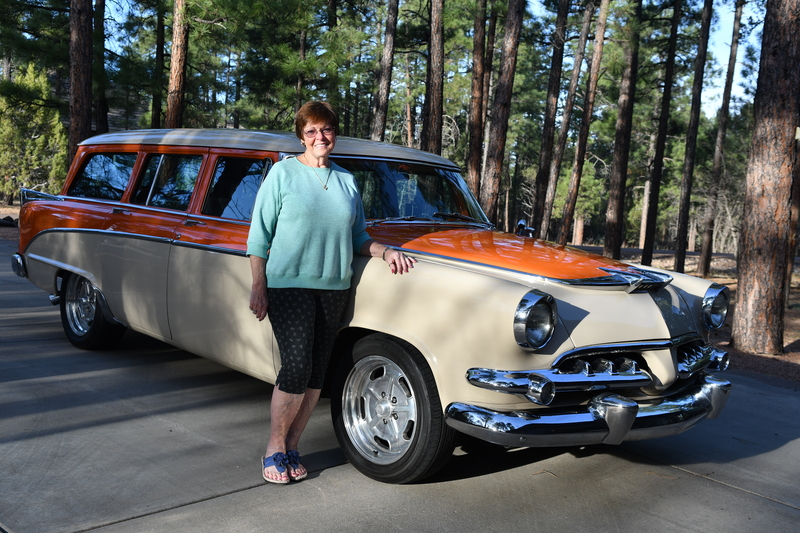 Clark and Sherrie Geffe on Welcome! 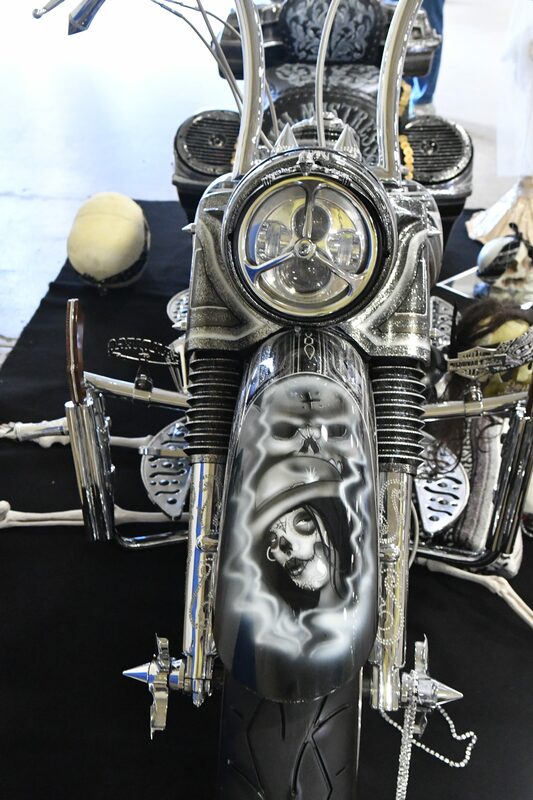 Leslie Frank Miller on Welcome! 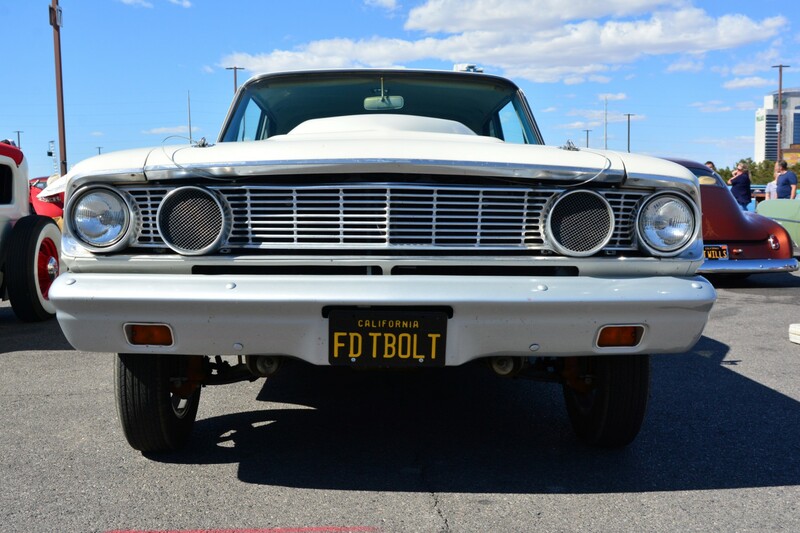 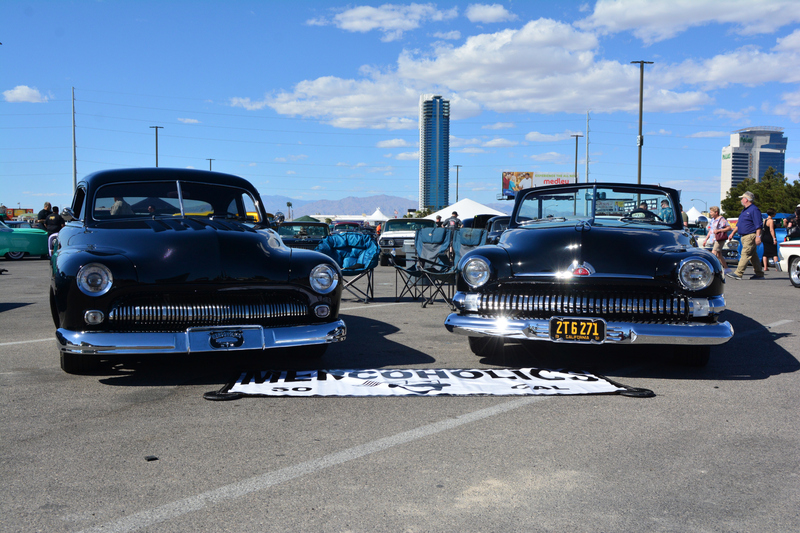 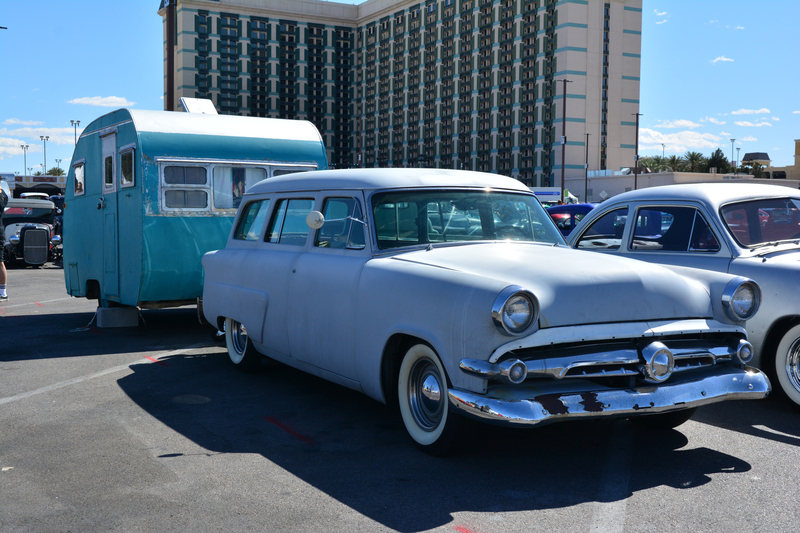 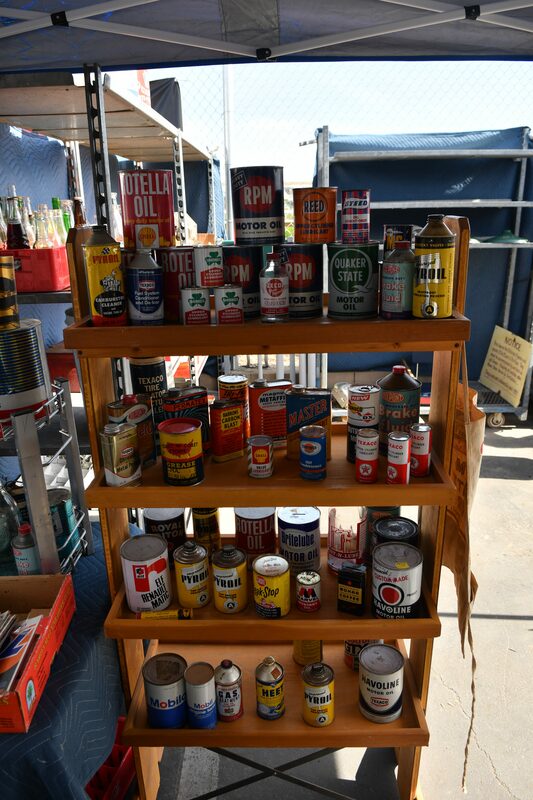 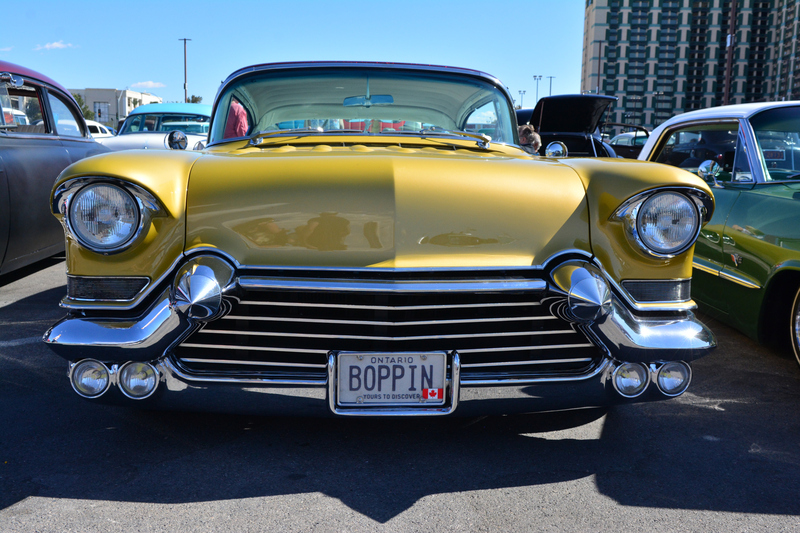 This was our second year at the Viva Las Vegas Rockabilly Weekend. 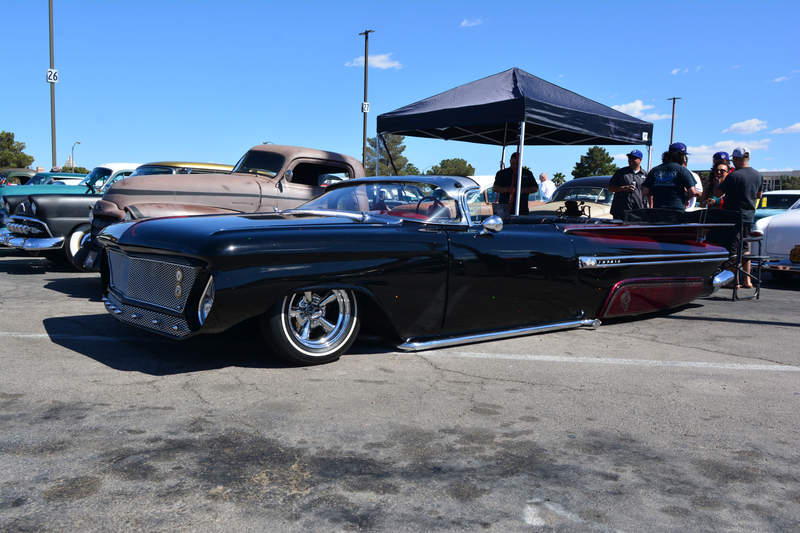 This was the 21st edition of what has become a great fun weekend of traditional hot rods and custom cars, pin up girls and rockabilly music. 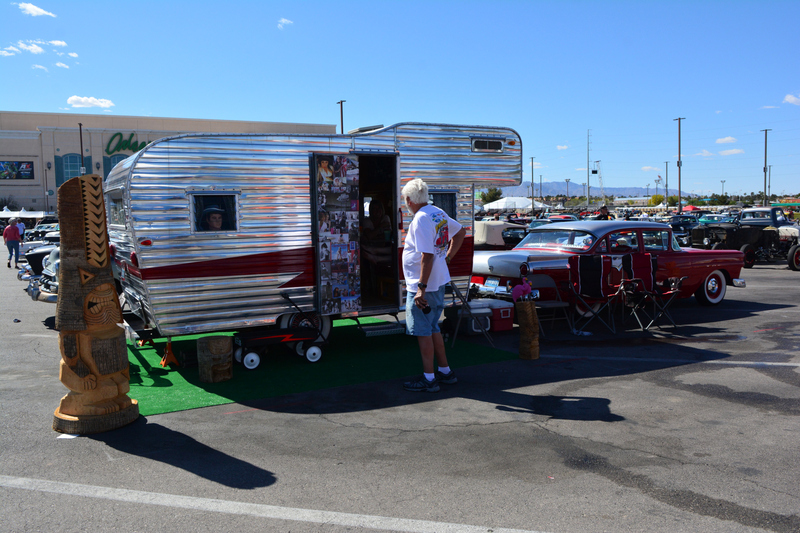 Making the trip this year was Paul & Judy Nolte, Greg Selvidge and Sherry Hofler and Michelle and I. 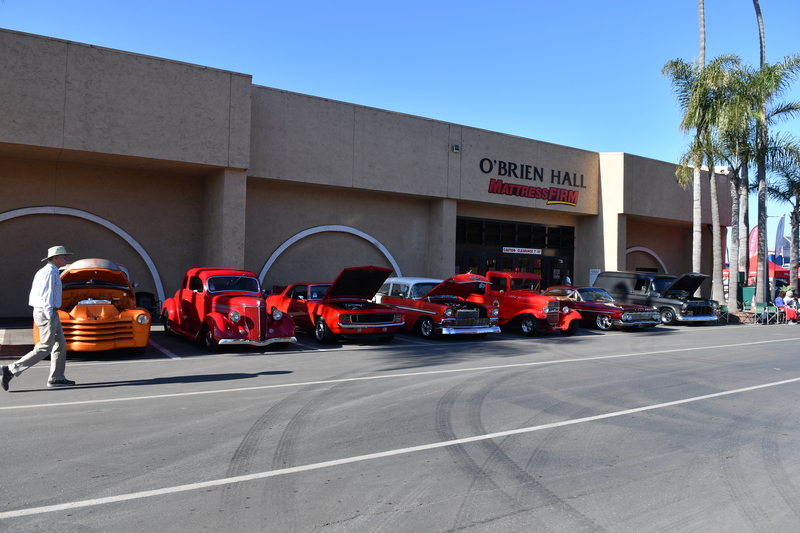 We met at the Cracker Barrel in Kingman for lunch and the drive up 93 to Vegas. 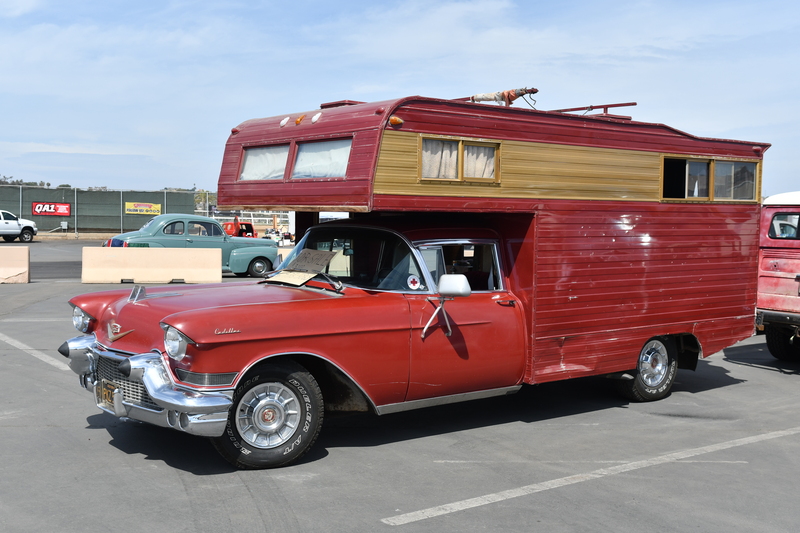 Just outside of Boulder Dam, Paul’s trailer acquired a flat which did some damage to the trailer which we had to take care of before traveling on, compared to some of our tire problems in Mexico years ago this was no big deal! 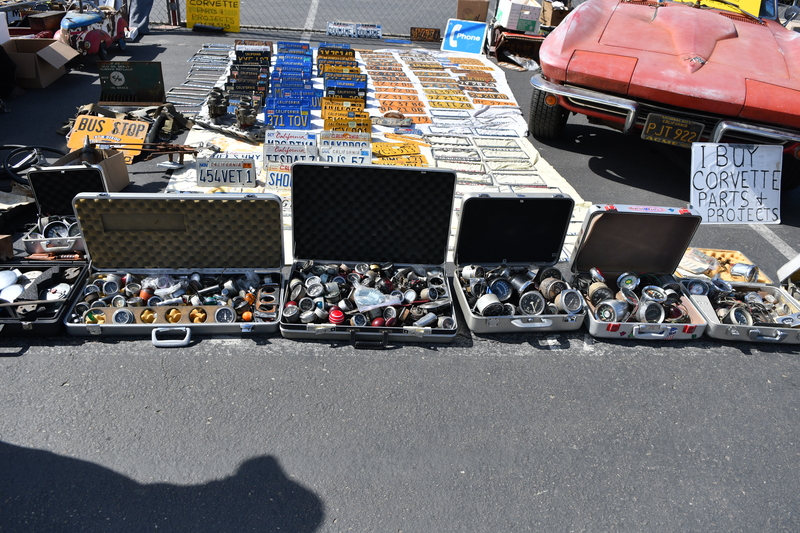 This was our second trip and frankly we are getting hooked! 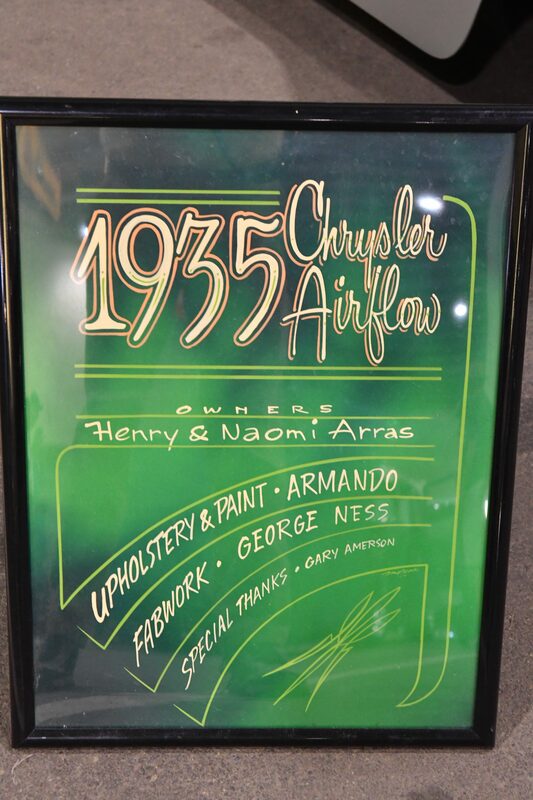 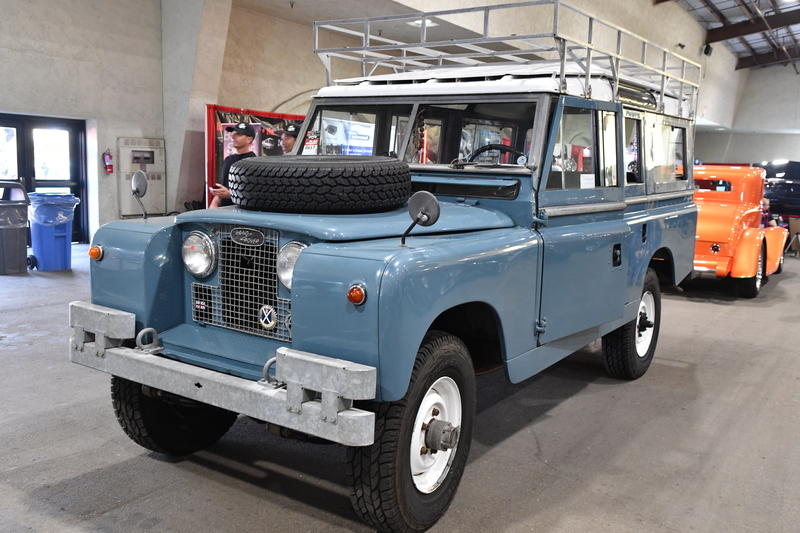 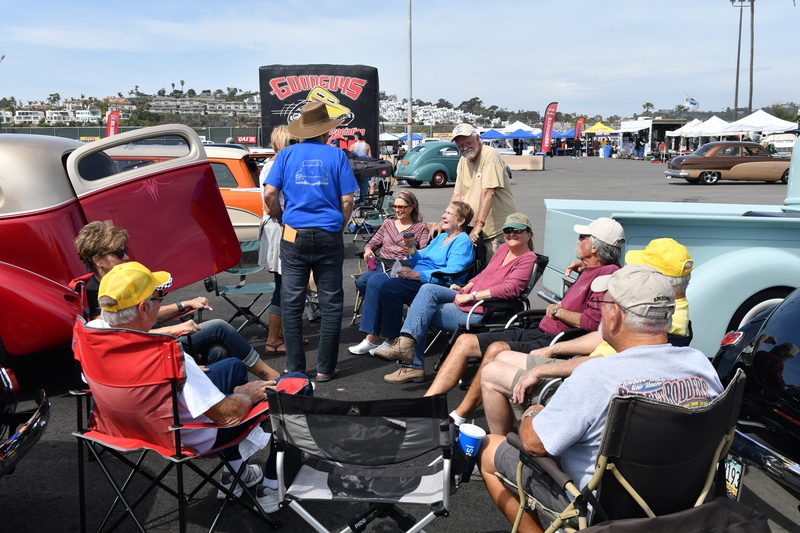 Fun weekend, everyone smiling and happy, no Grumpy Guses complaining about not getting an award for their checkbook car. 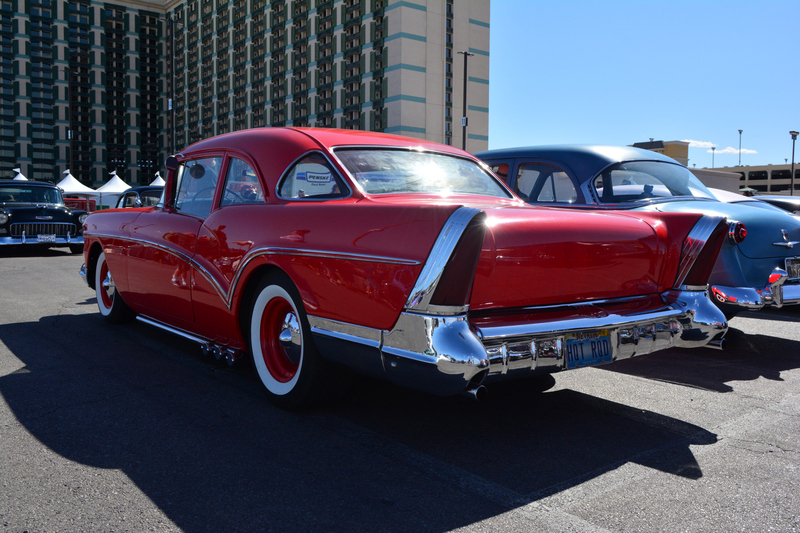 Great music all day with live performances by Duane Eddy, Jerry Lee Lewis (yes he is still performing at 82 yrs old) and the Stray Cats who haven’t lost a beat! 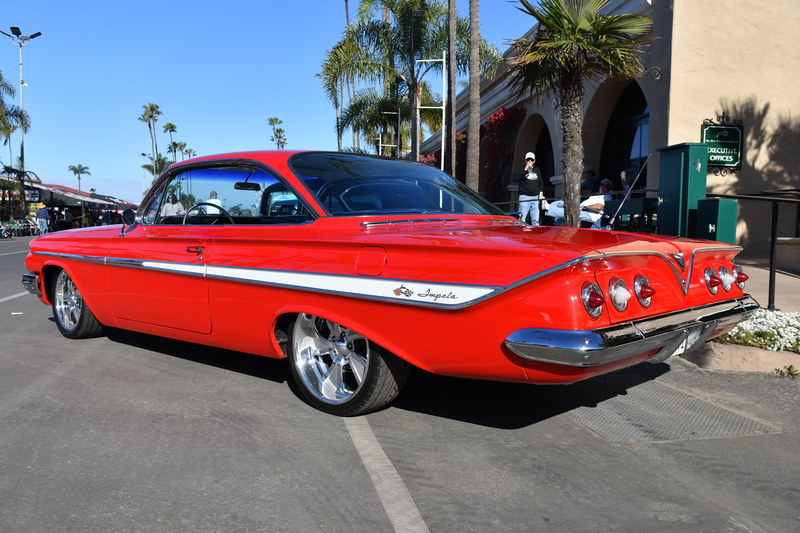 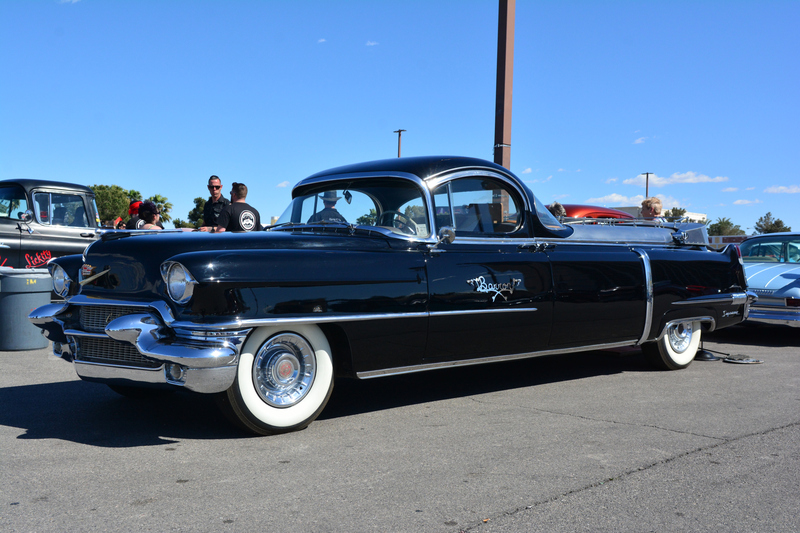 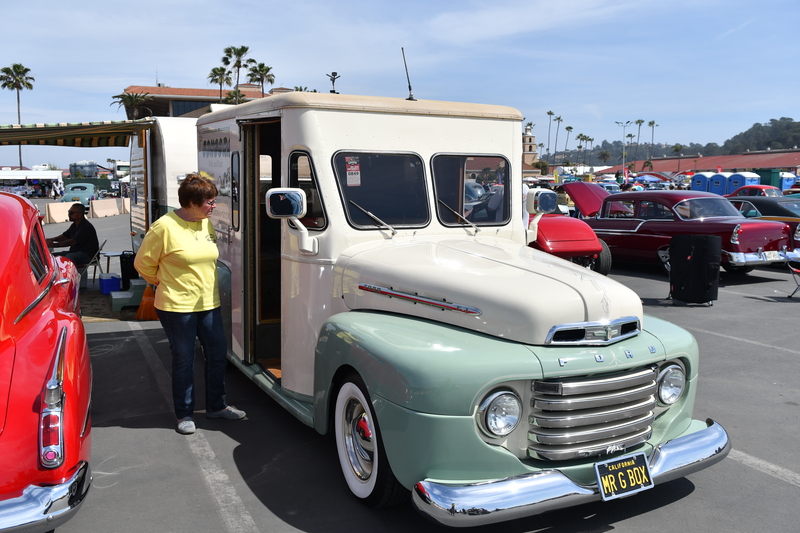 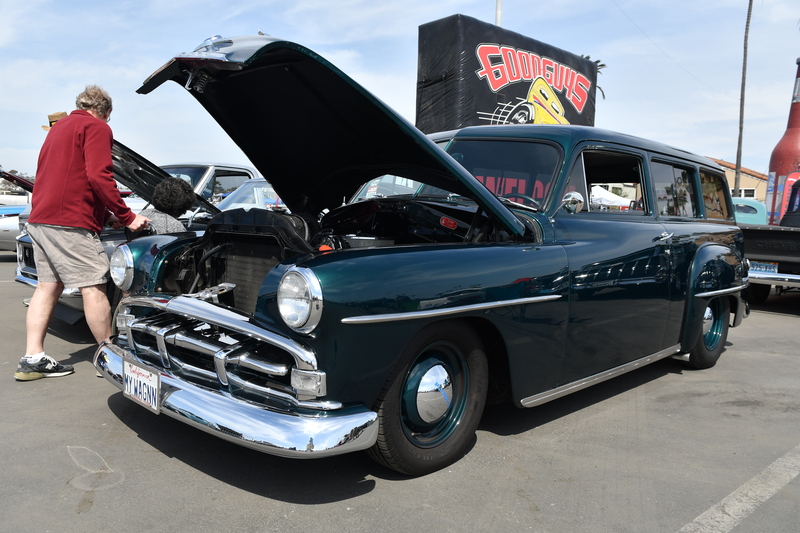 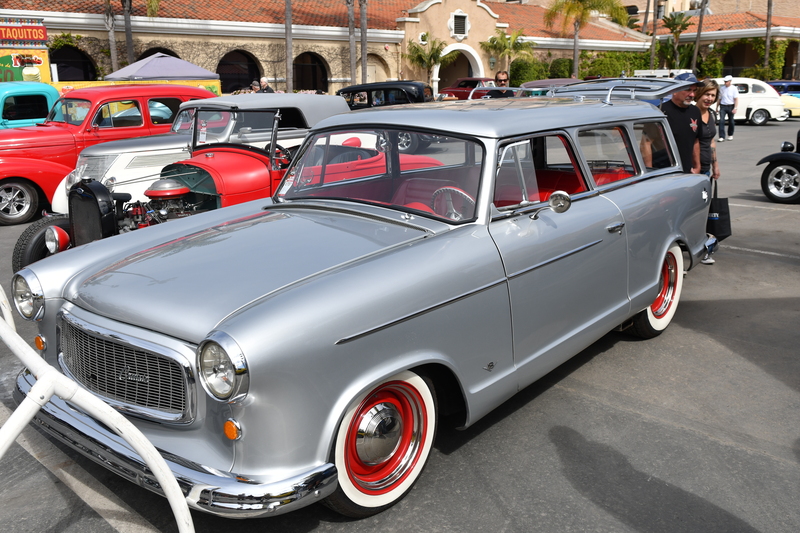 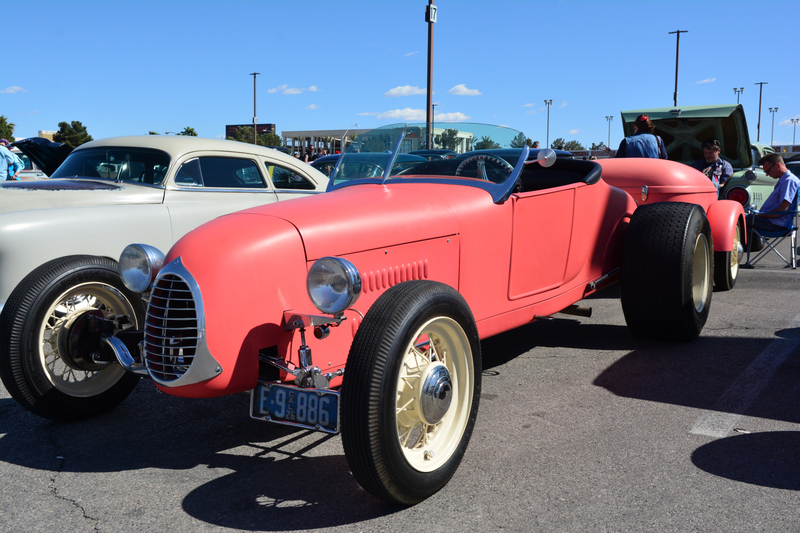 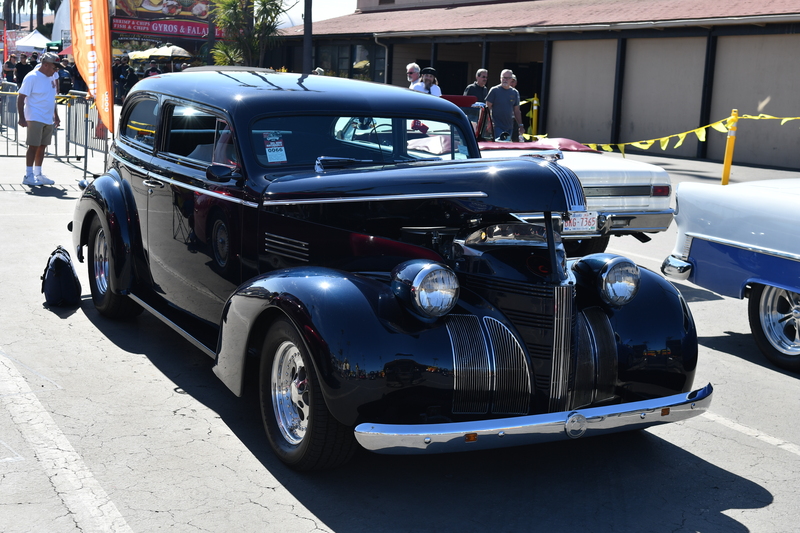 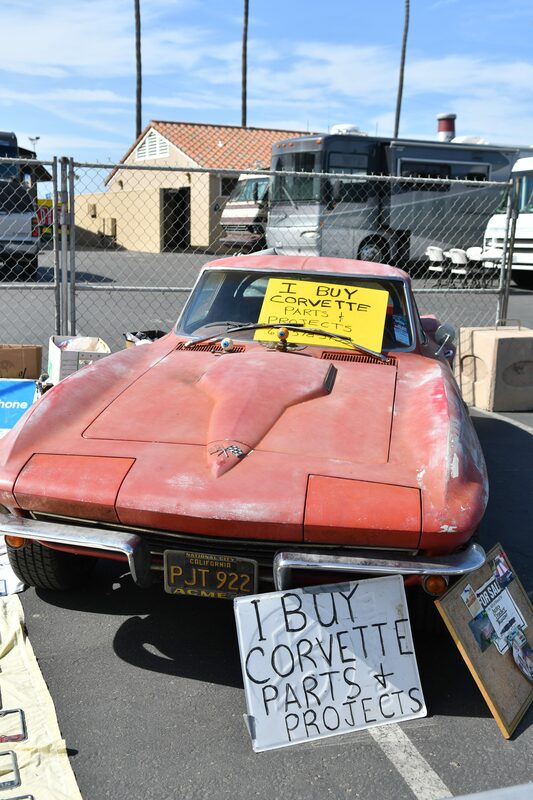 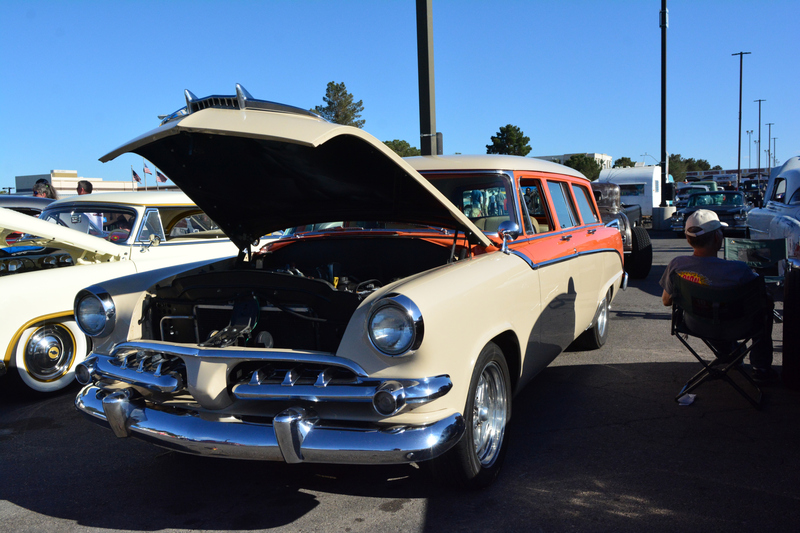 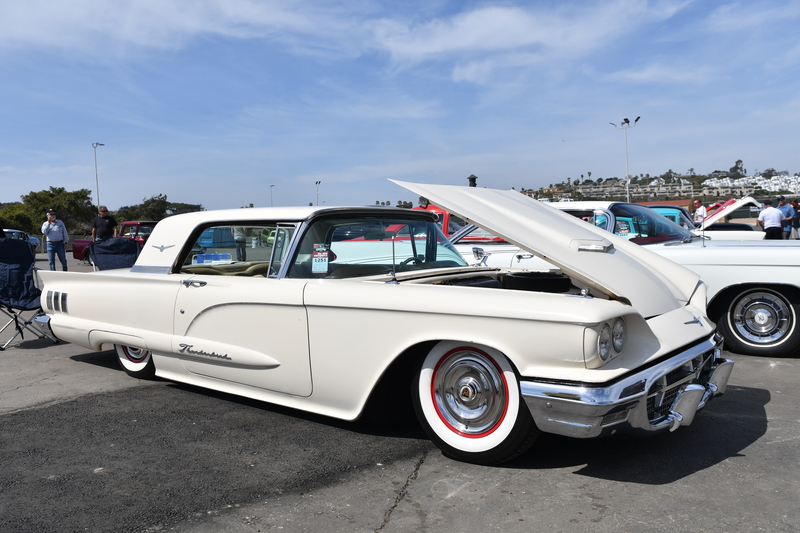 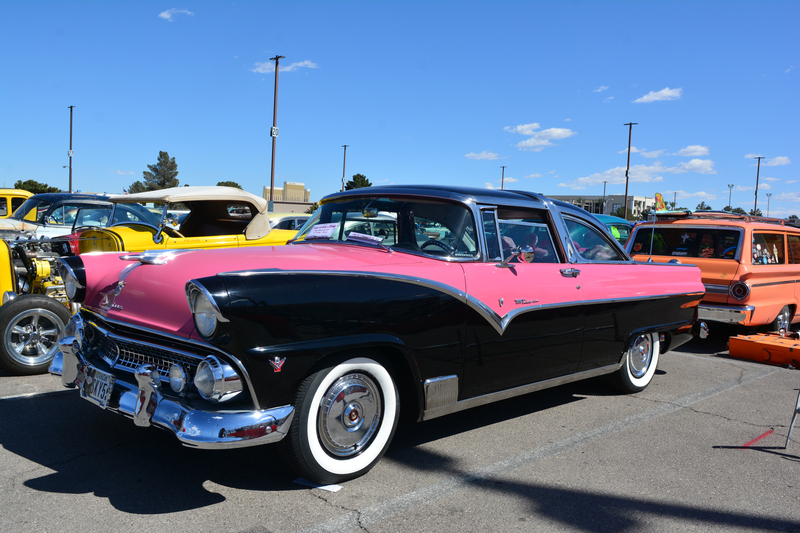 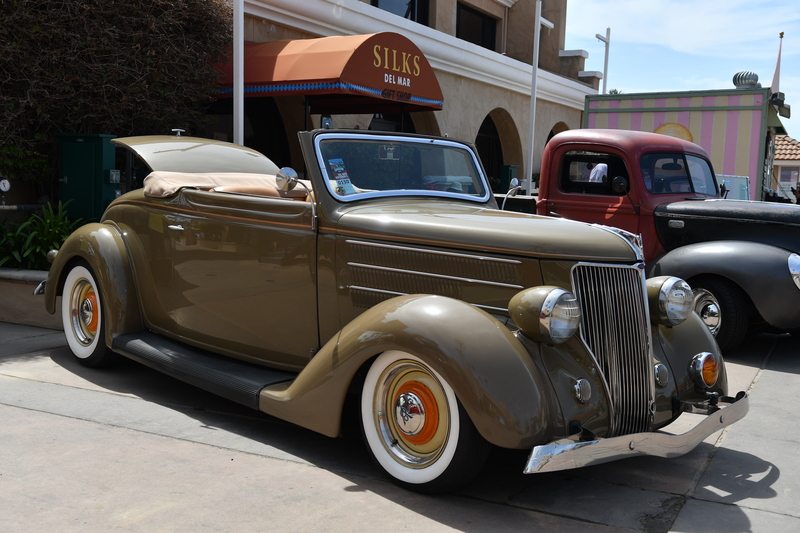 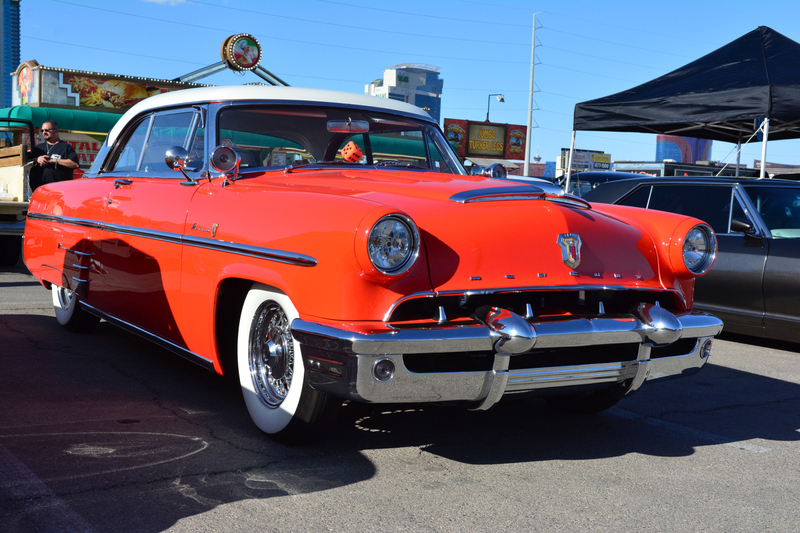 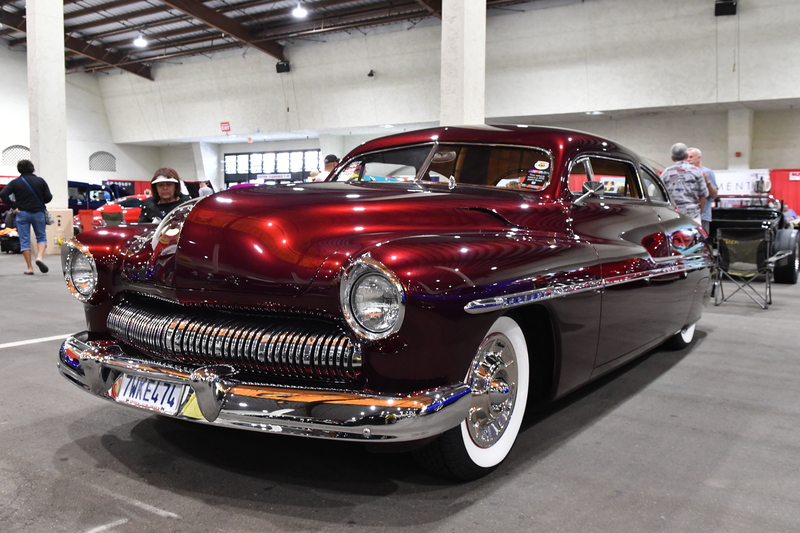 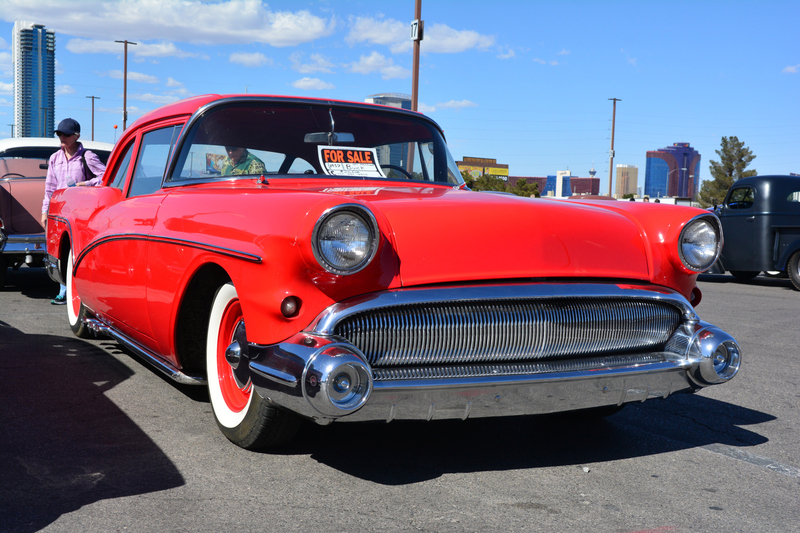 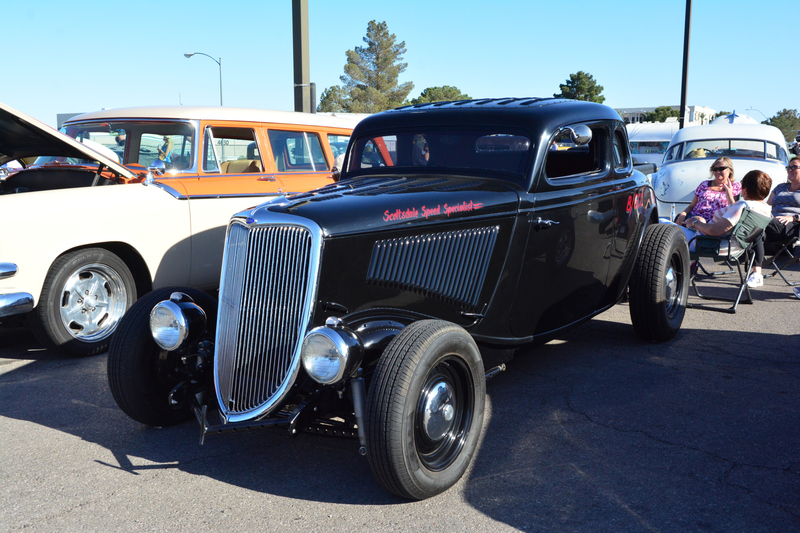 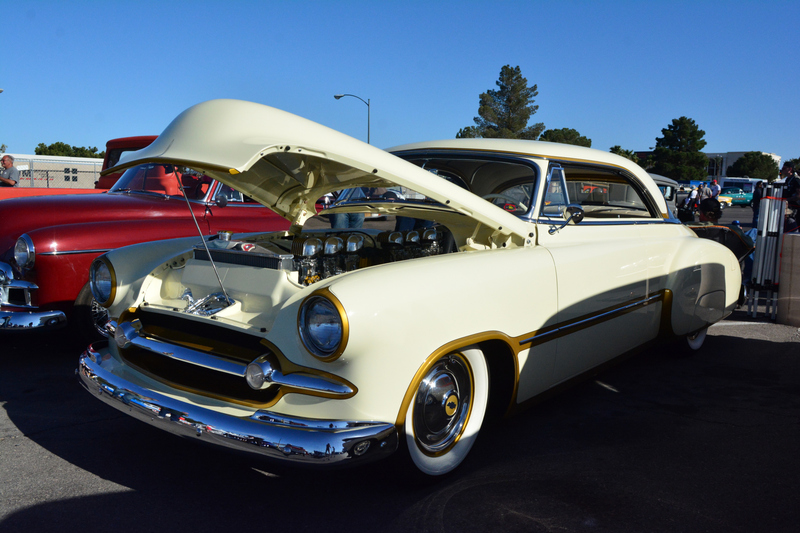 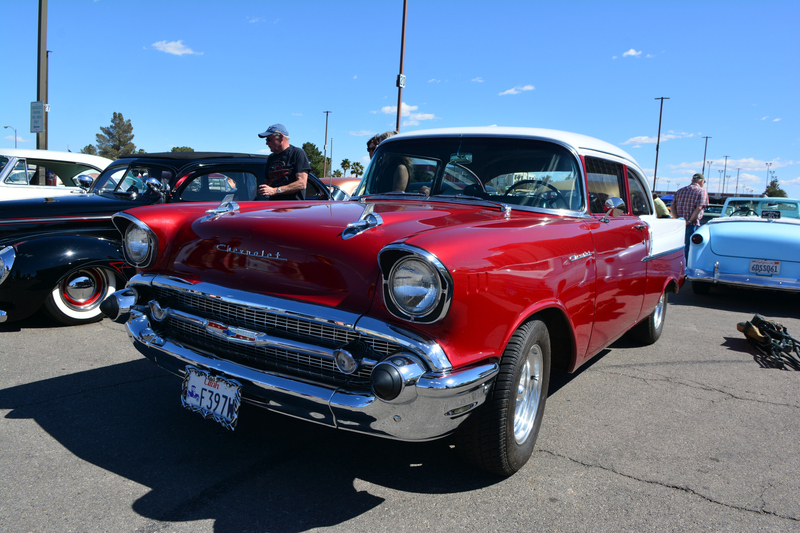 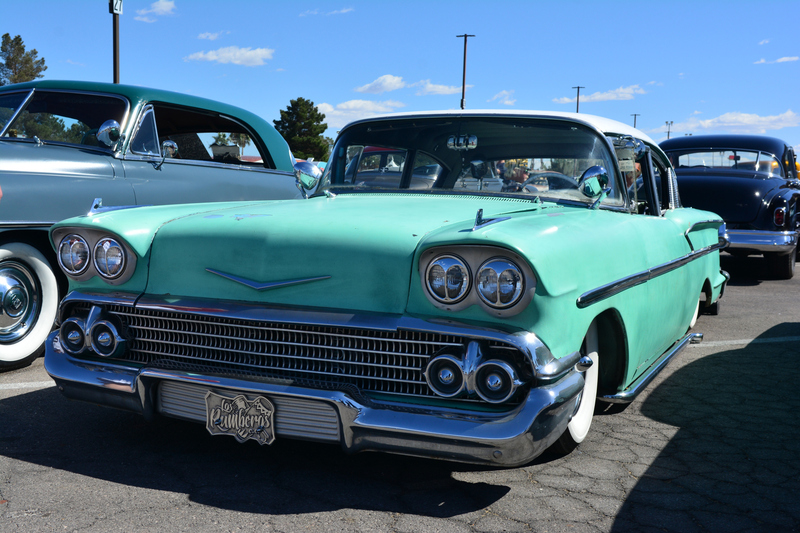 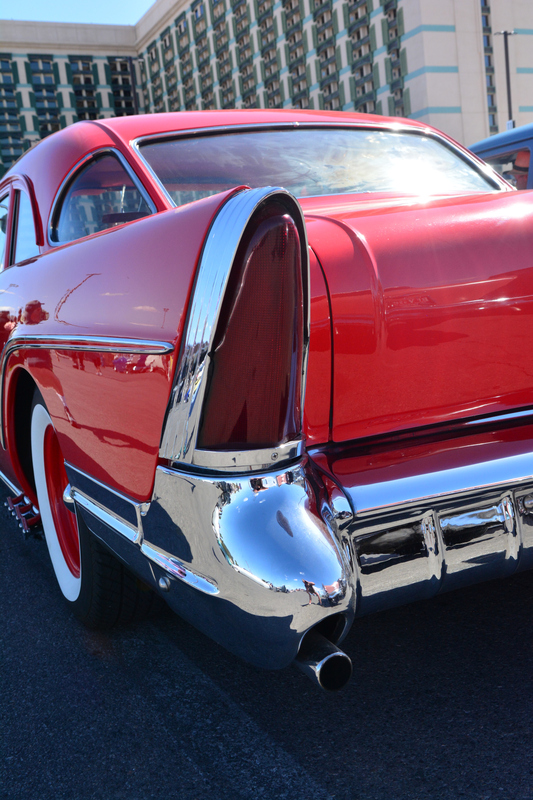 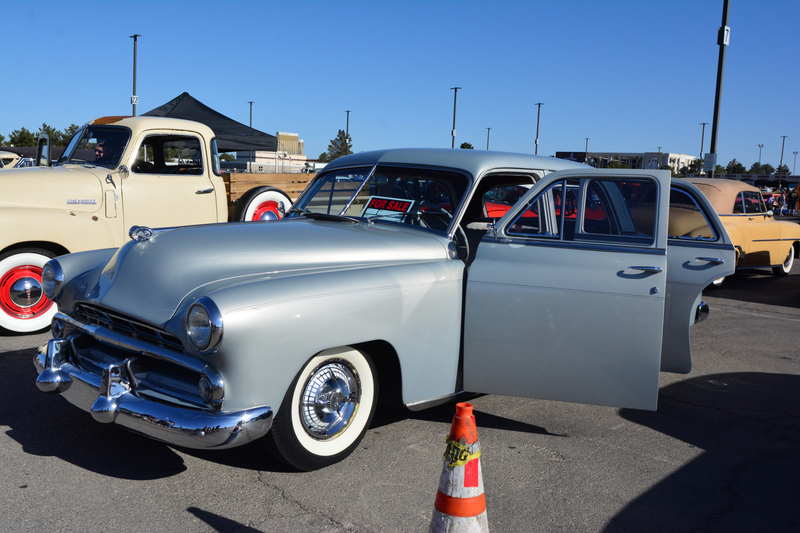 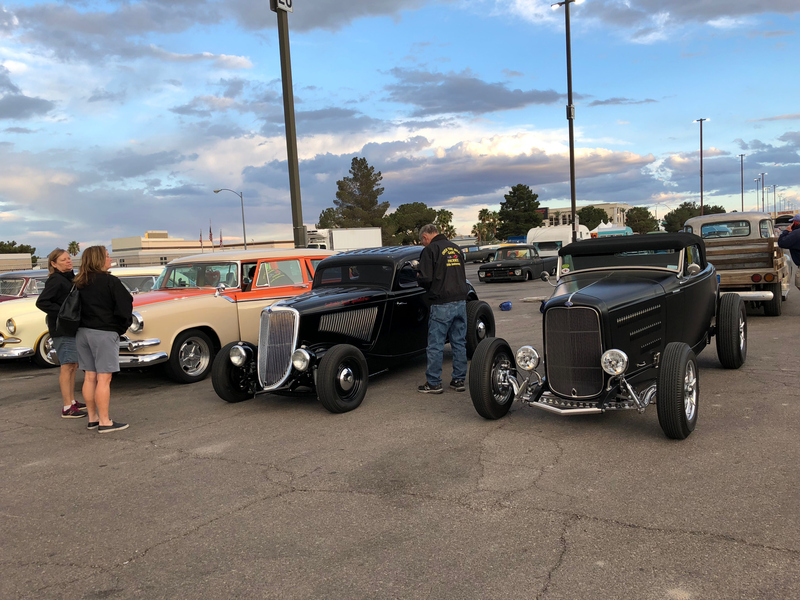 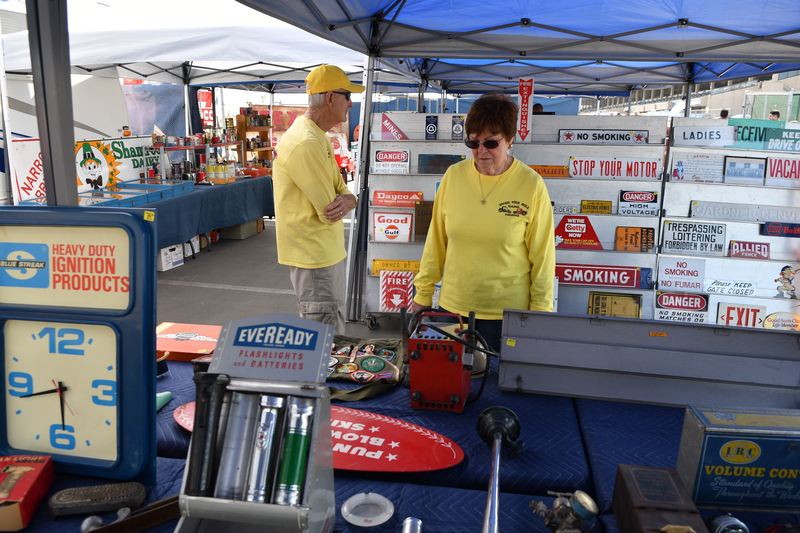 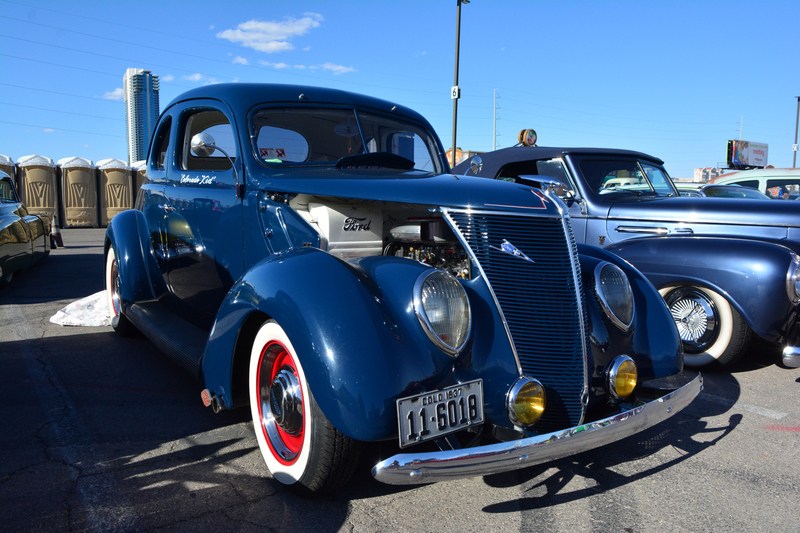 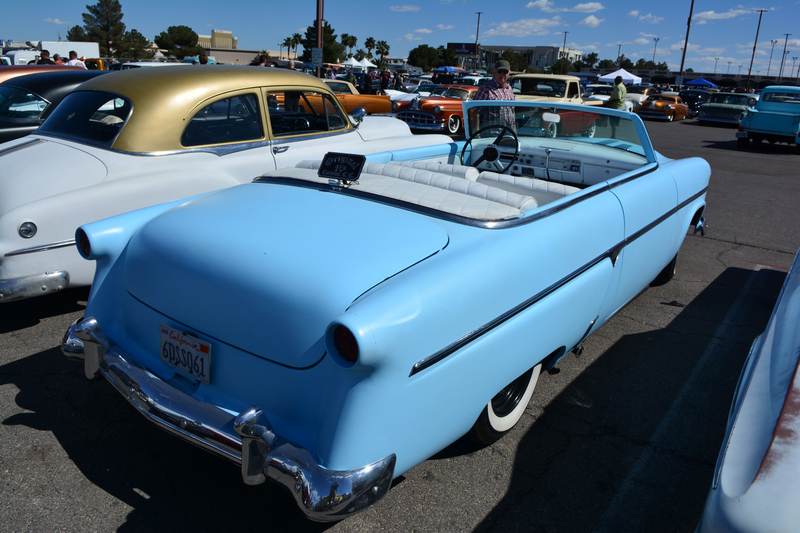 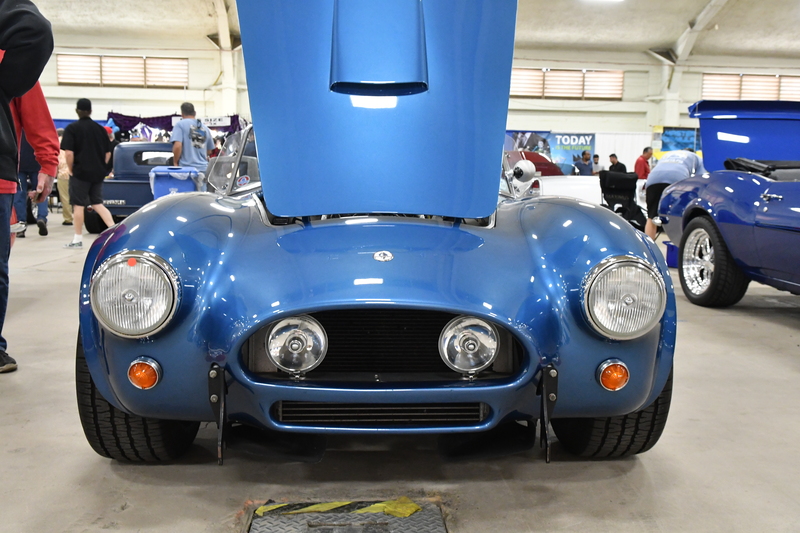 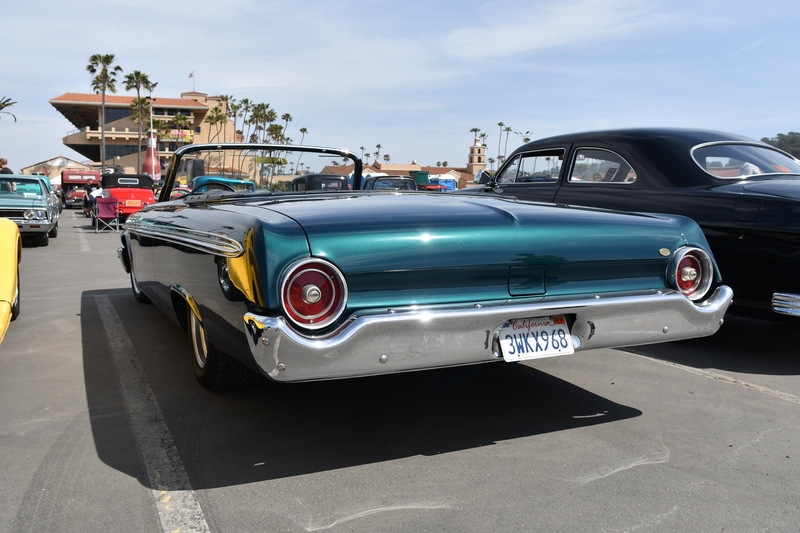 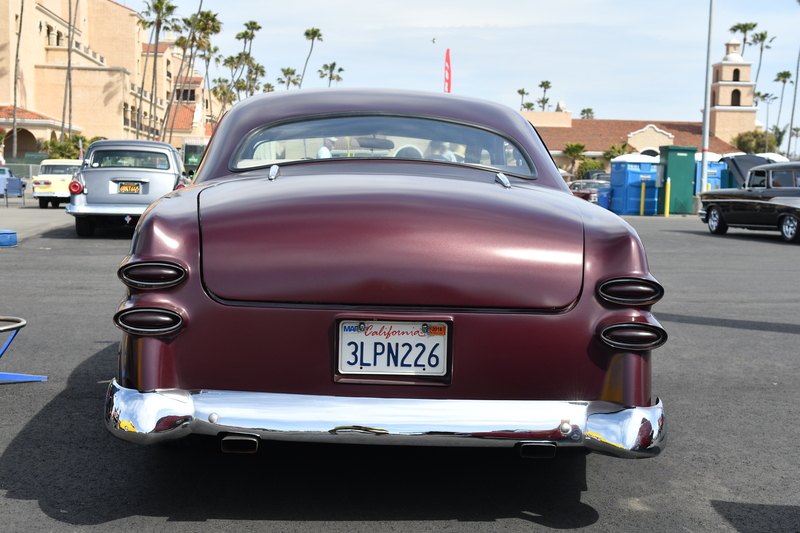 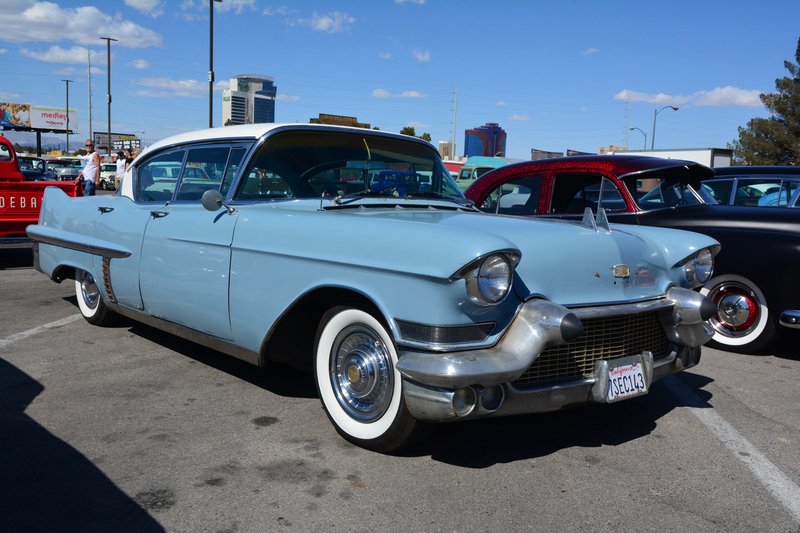 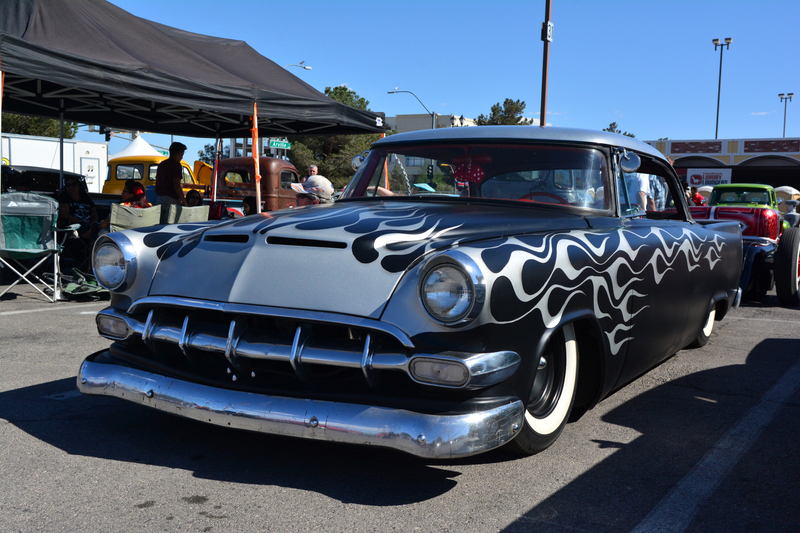 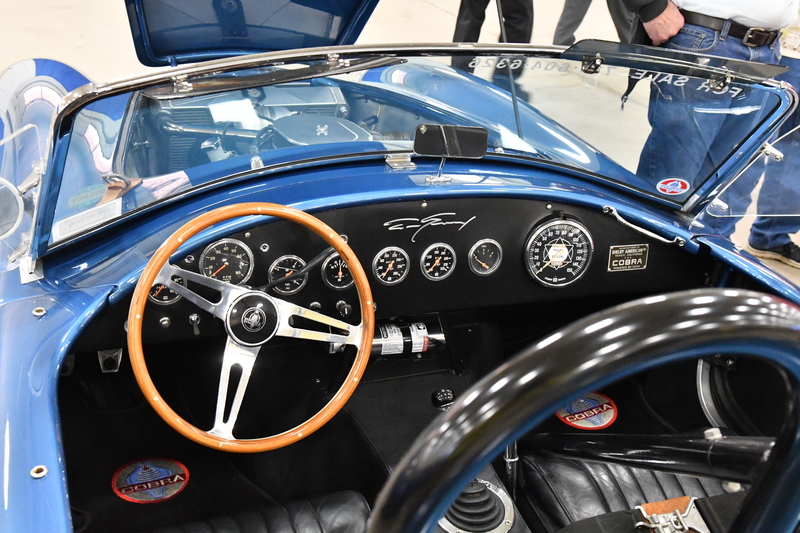 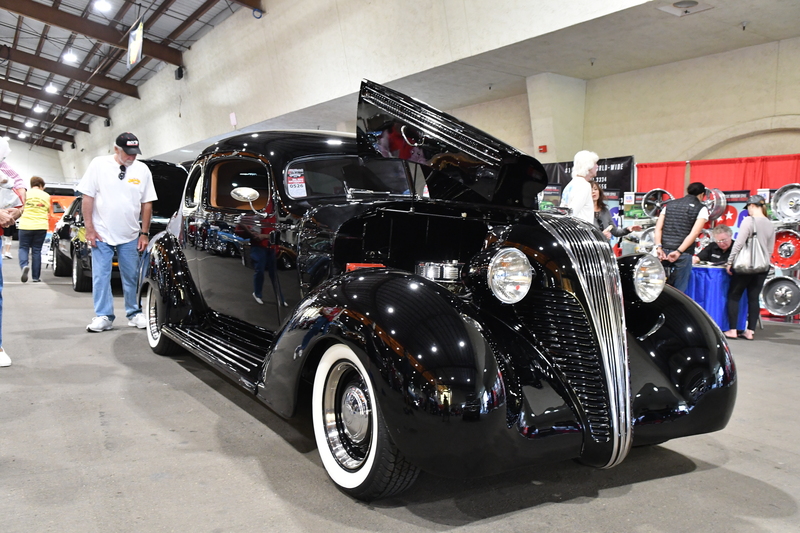 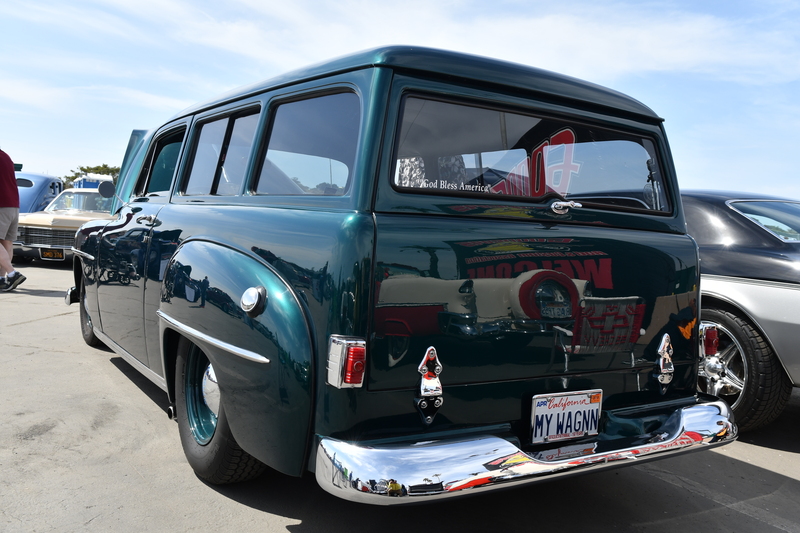 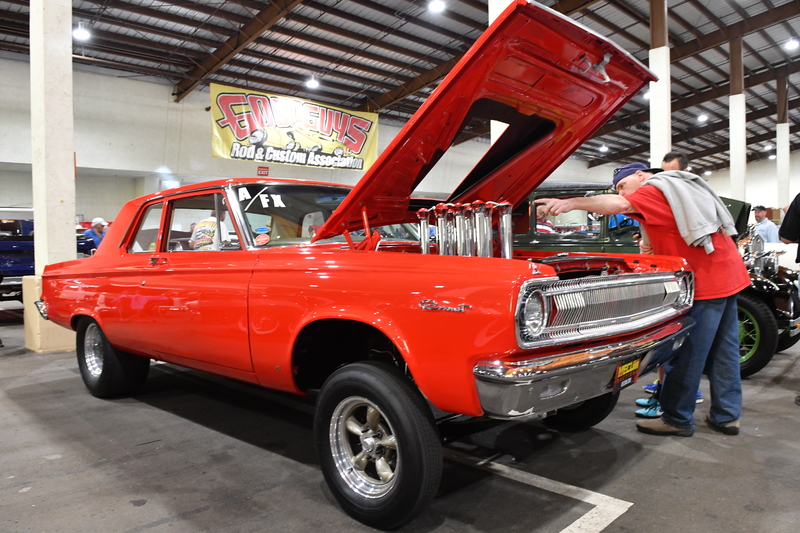 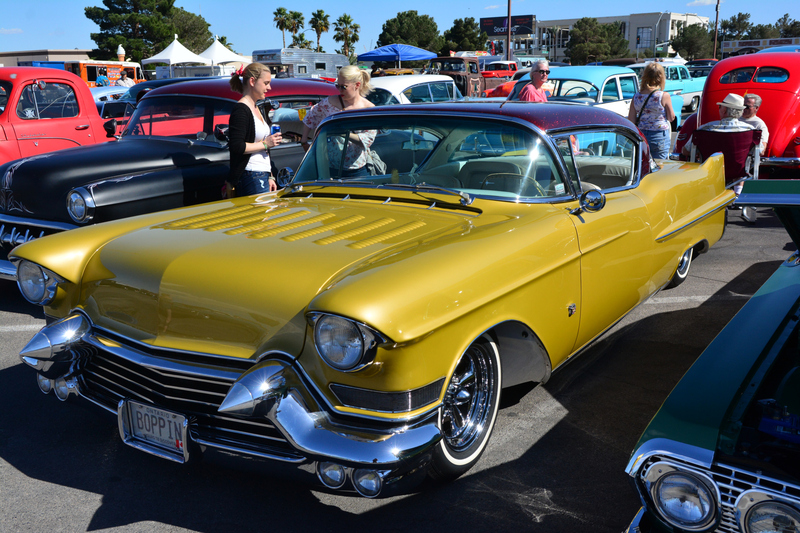 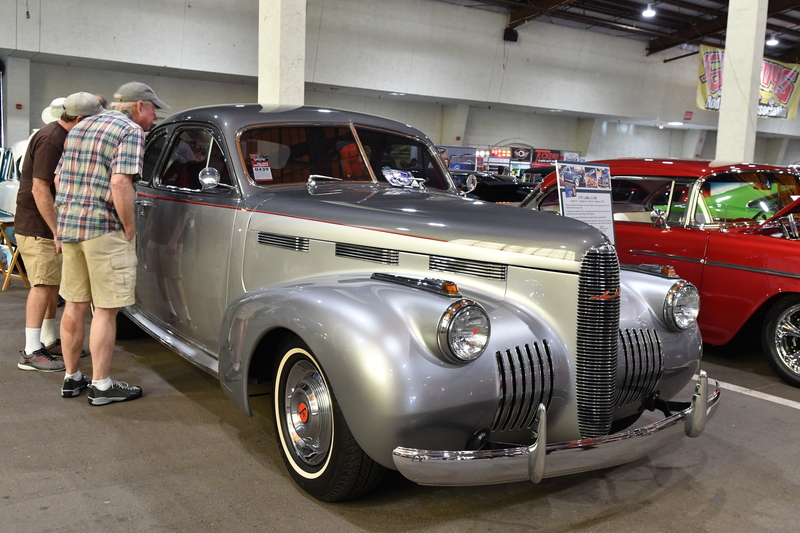 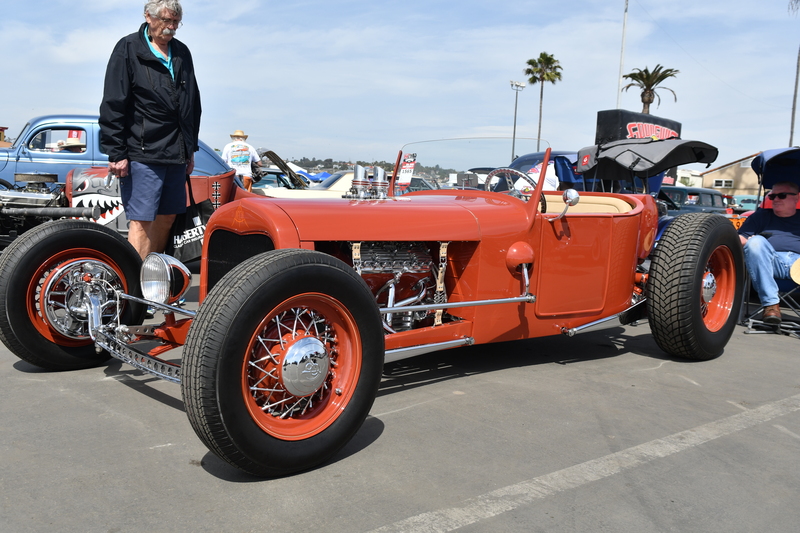 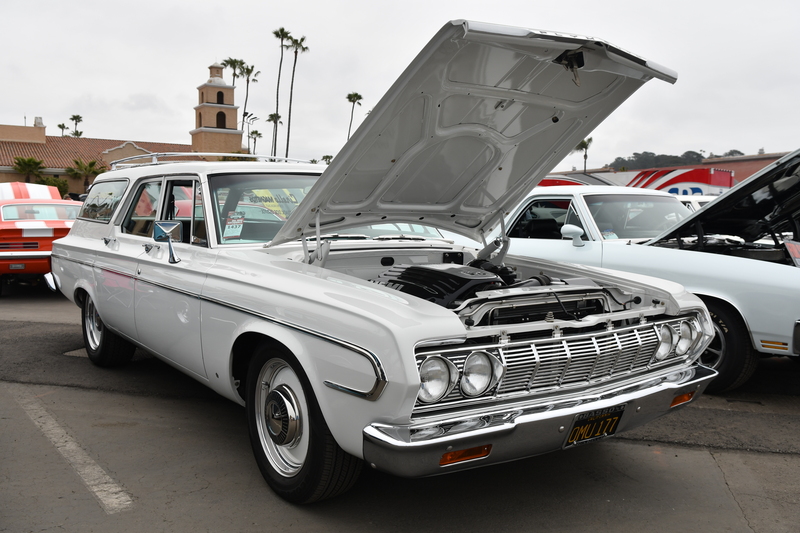 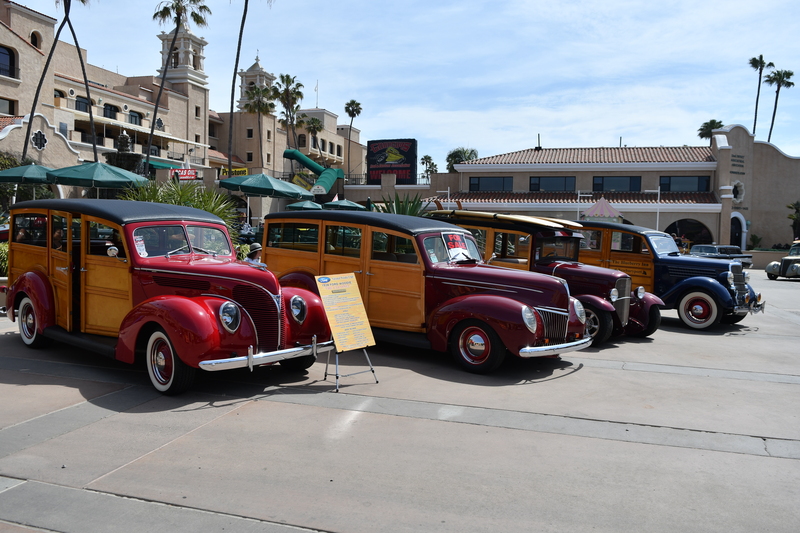 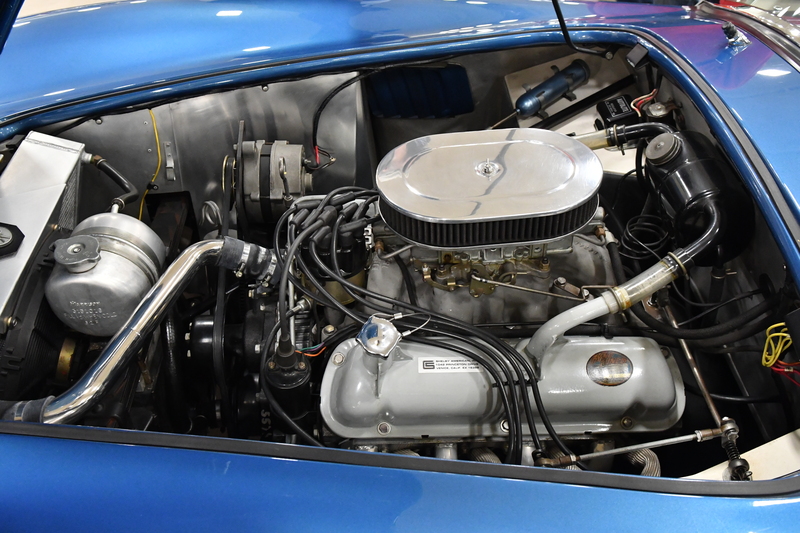 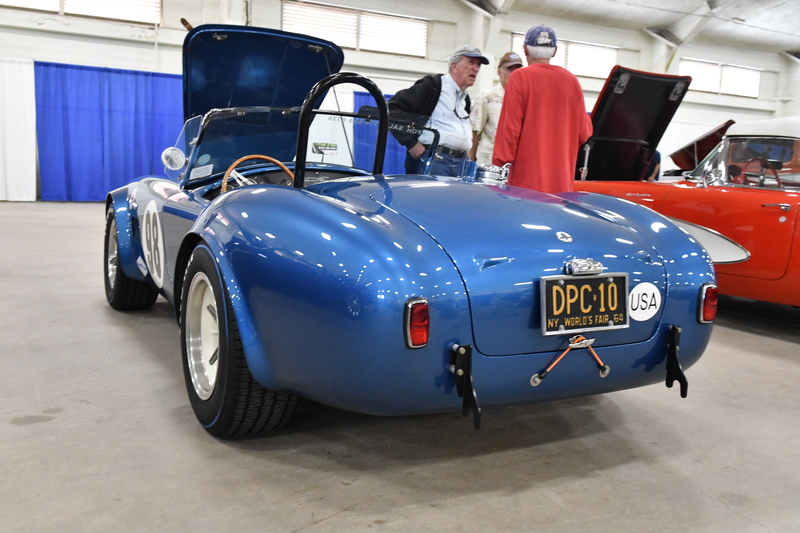 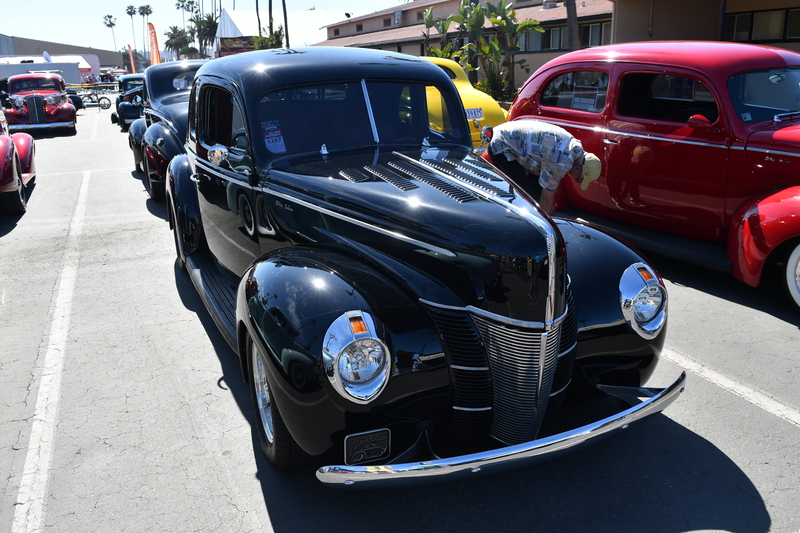 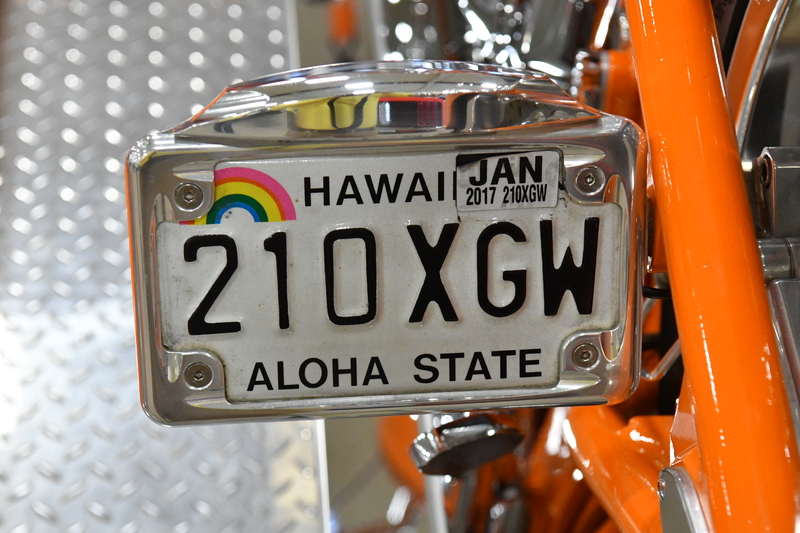 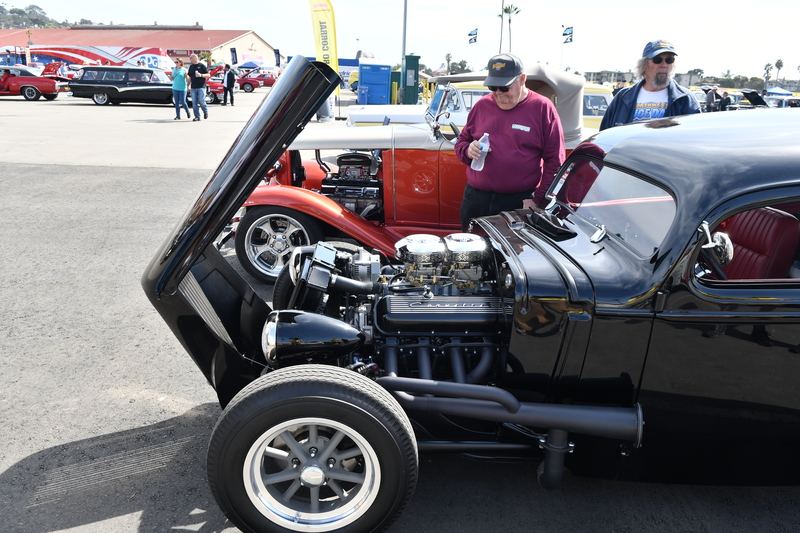 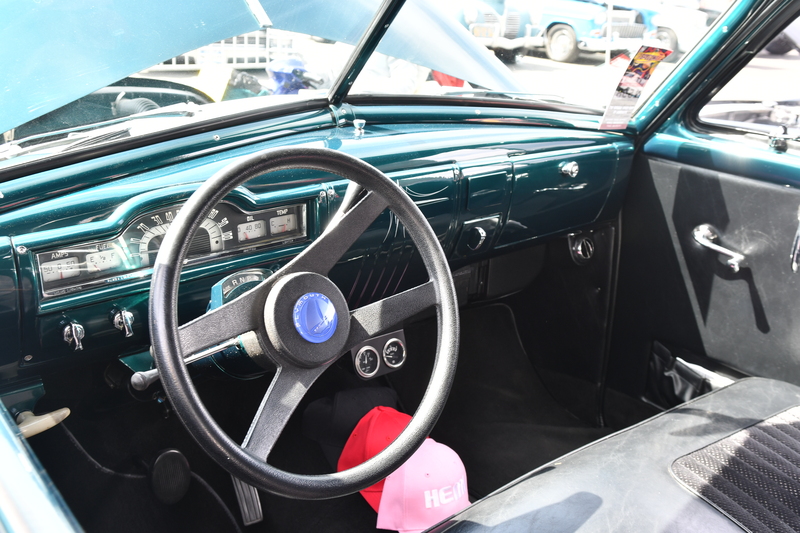 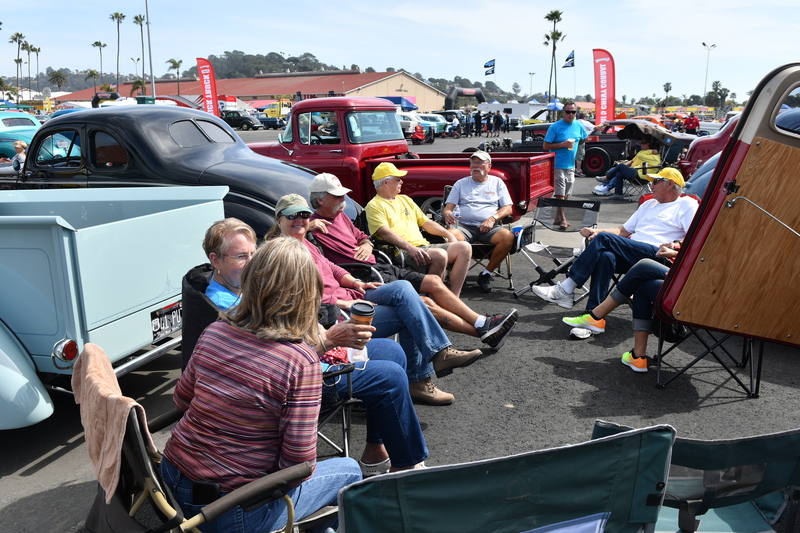 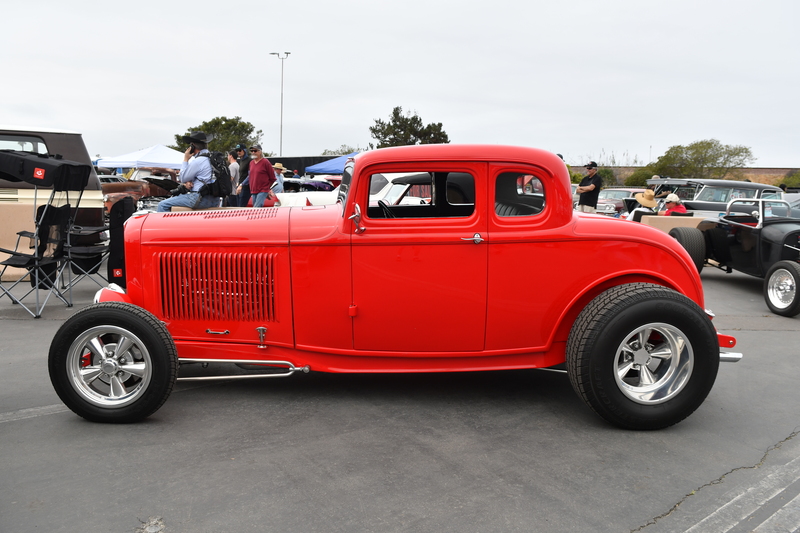 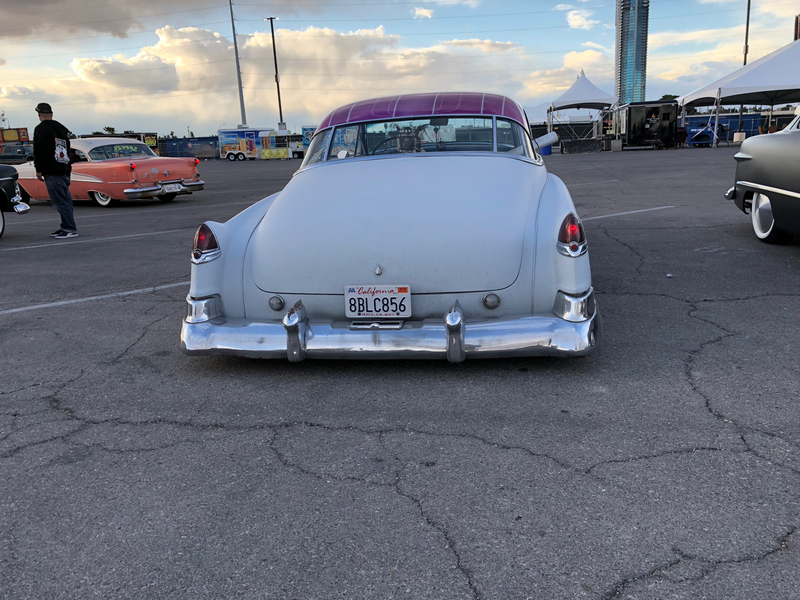 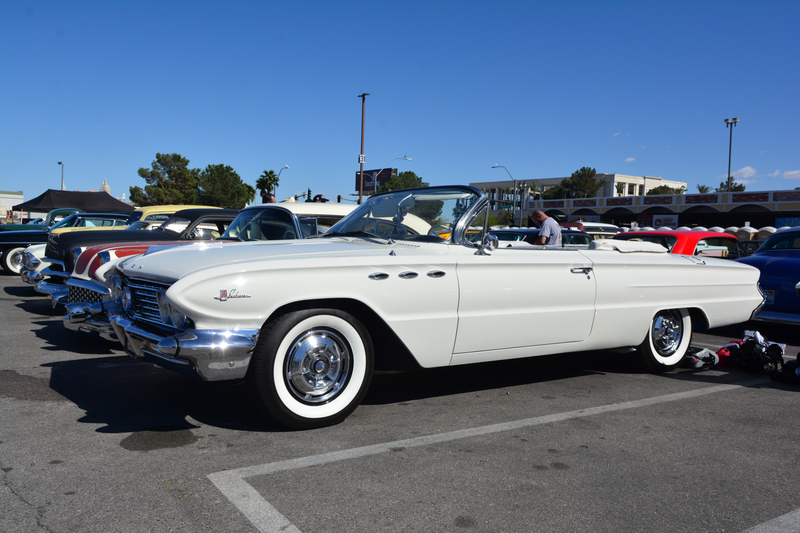 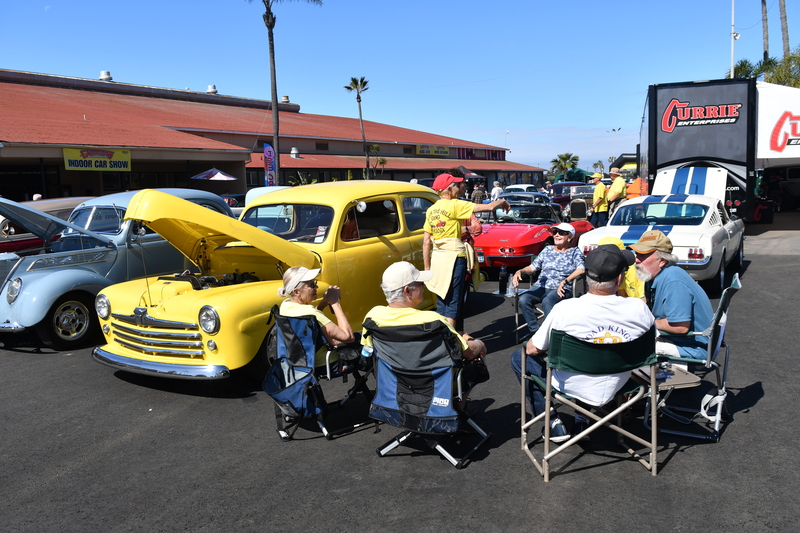 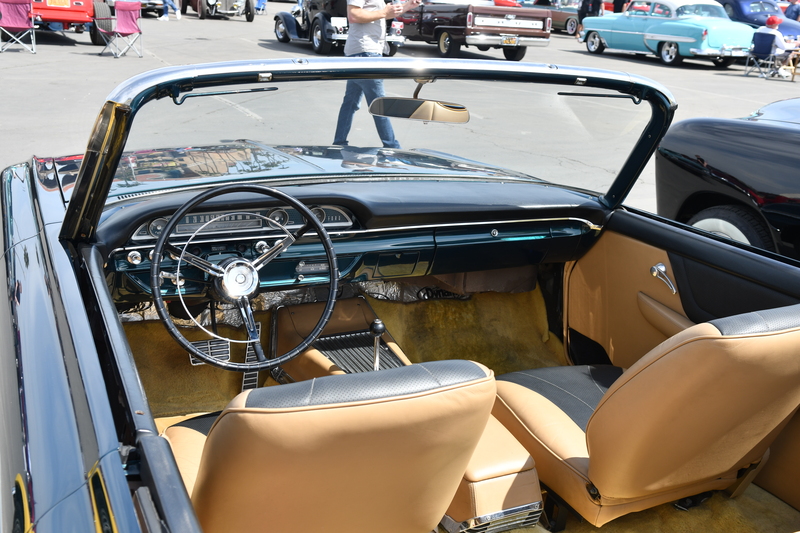 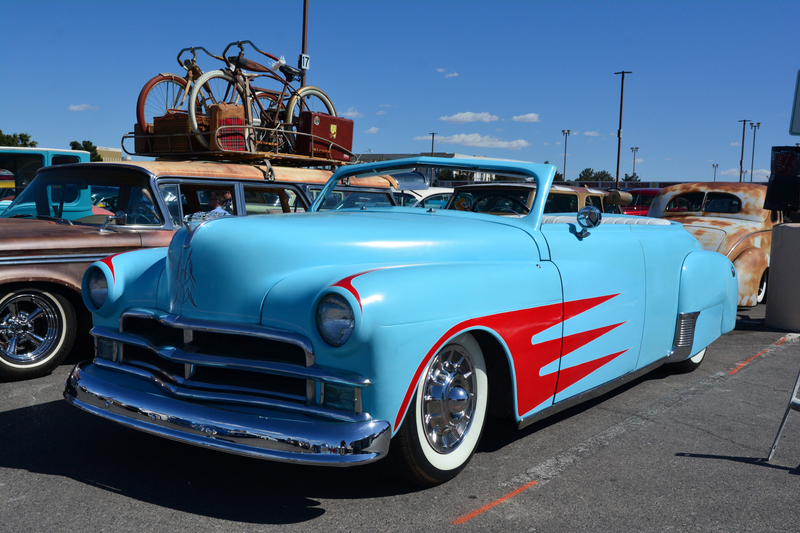 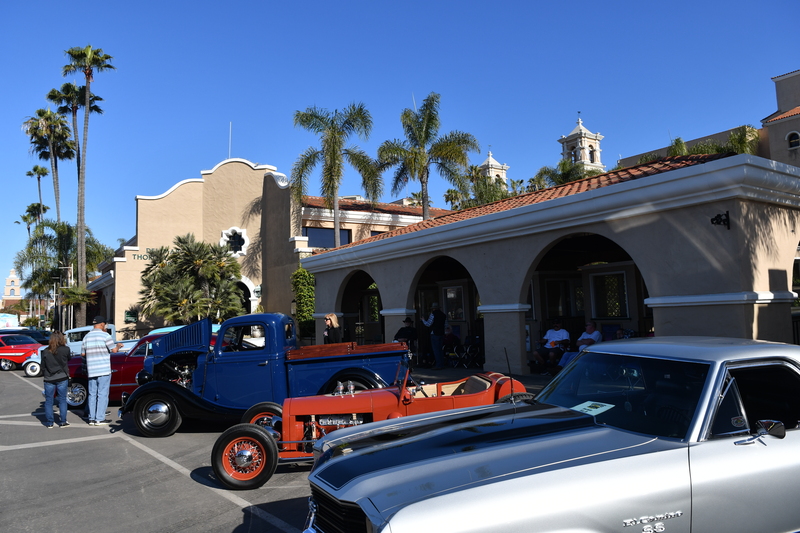 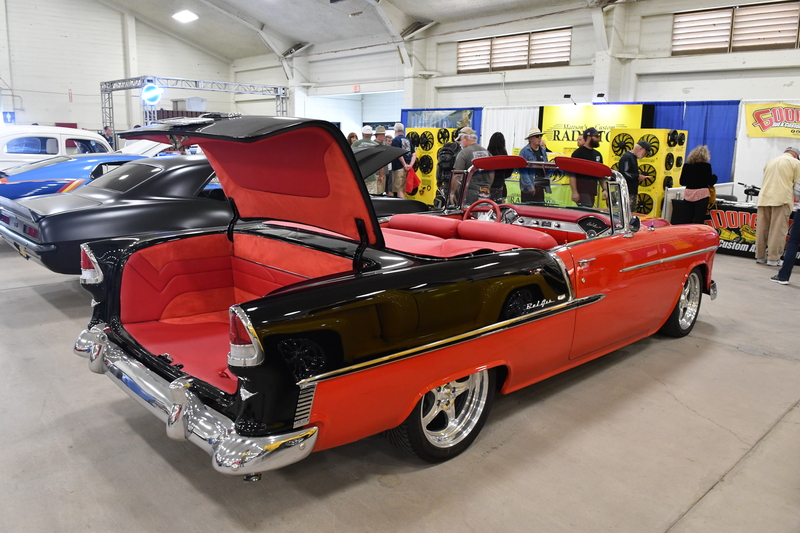 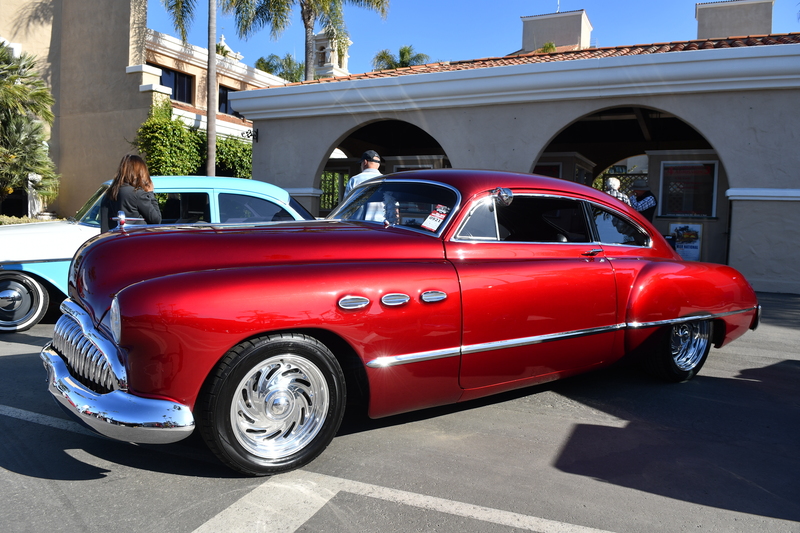 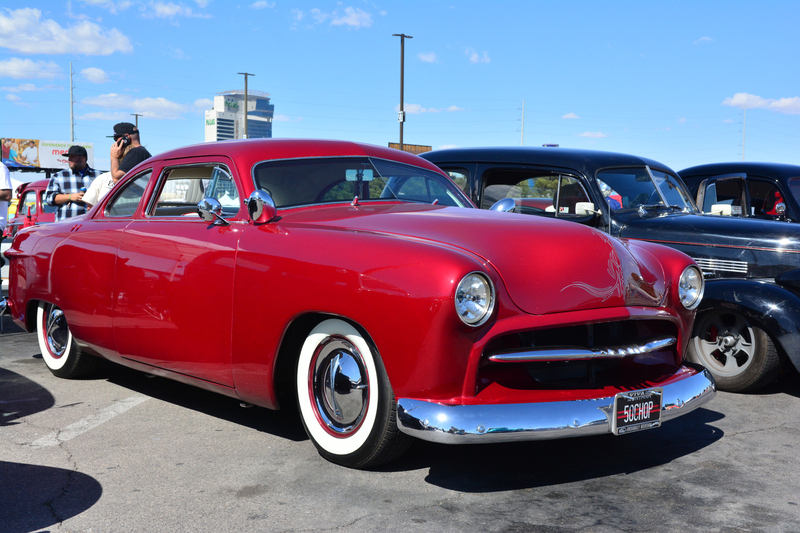 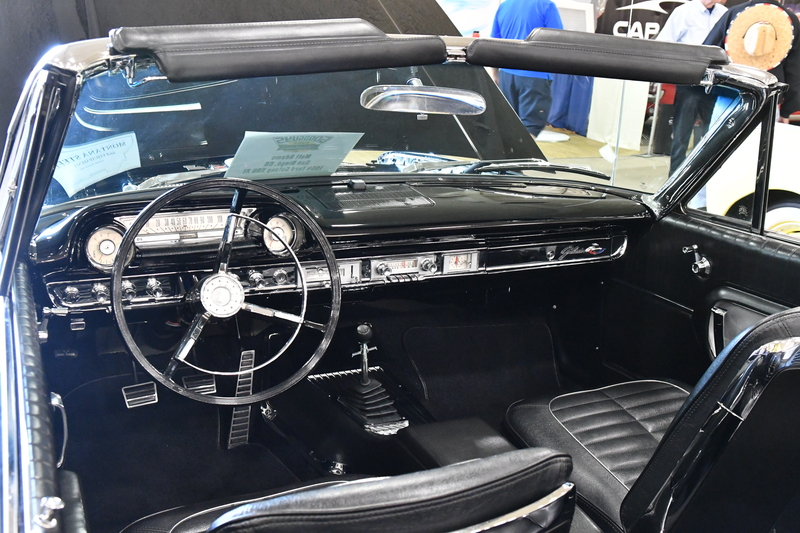 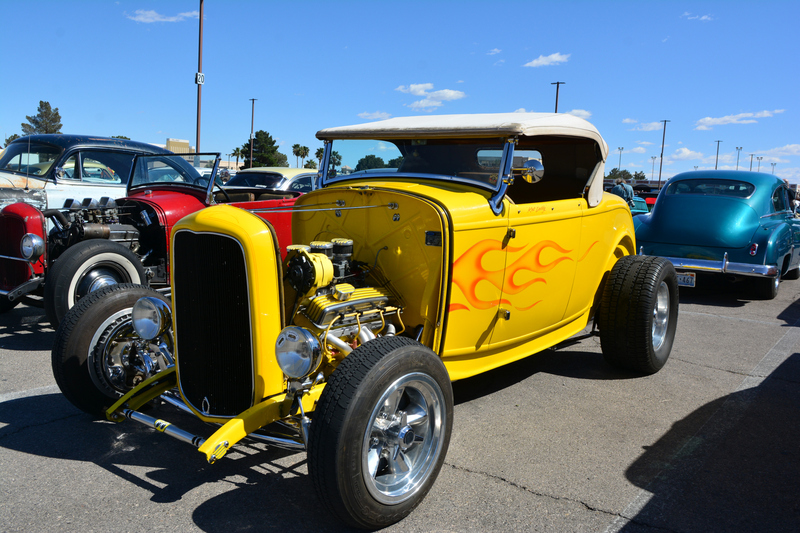 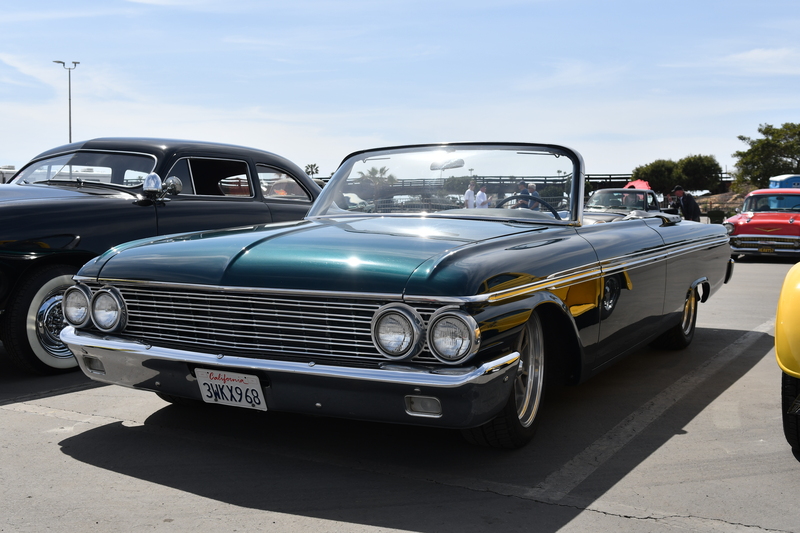 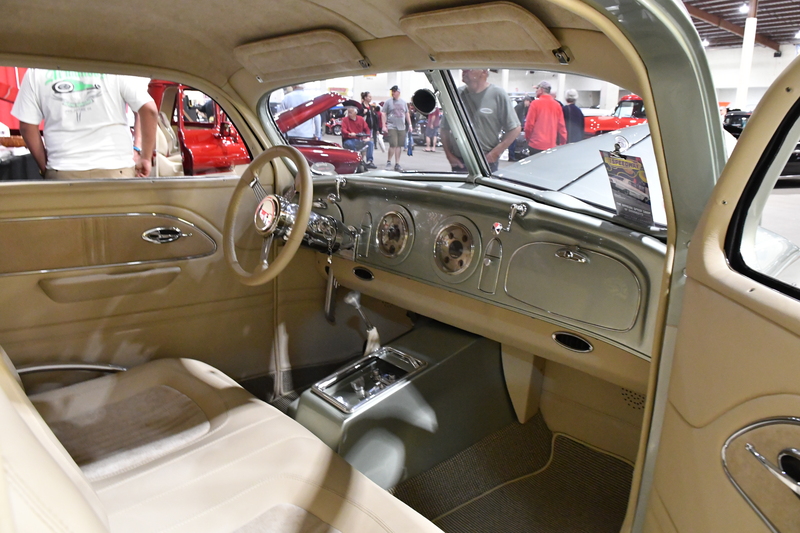 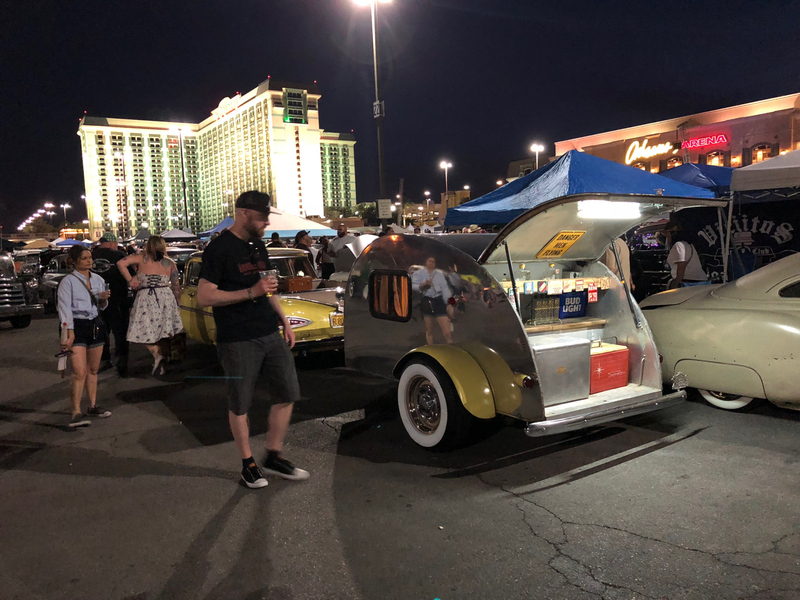 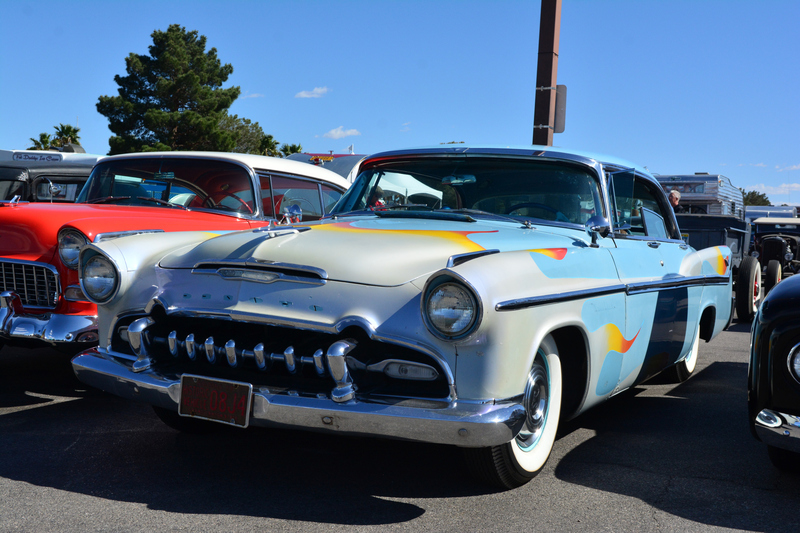 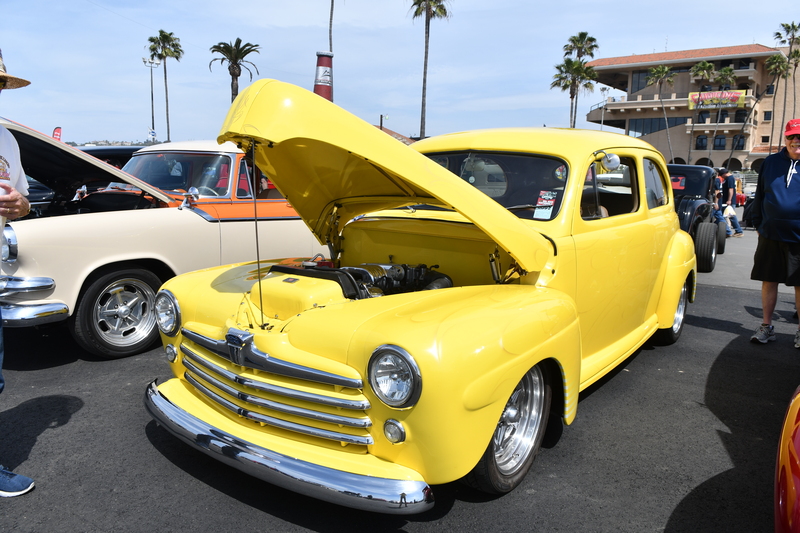 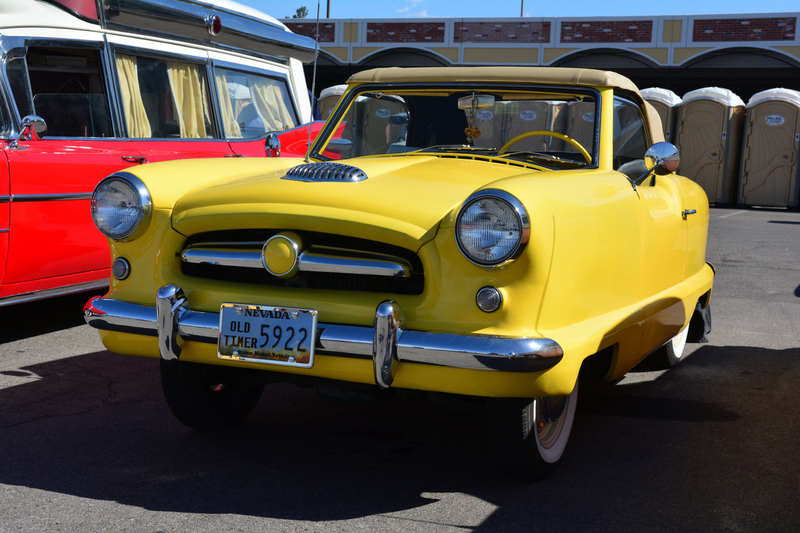 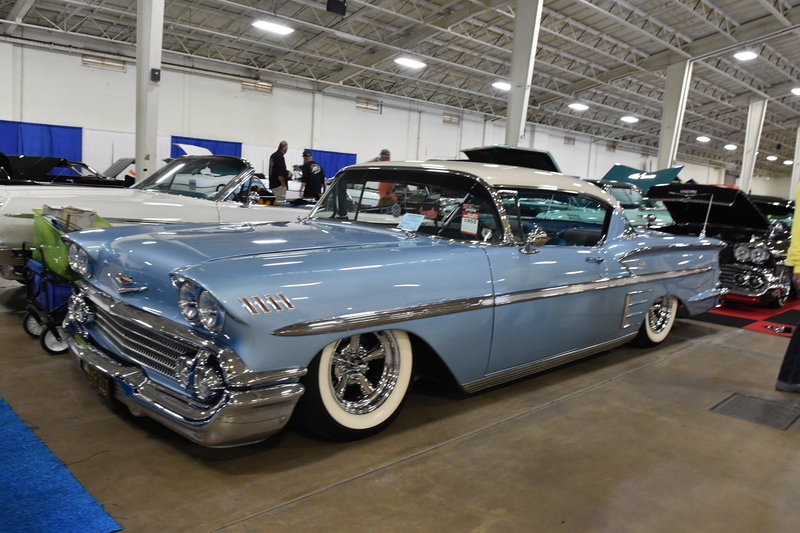 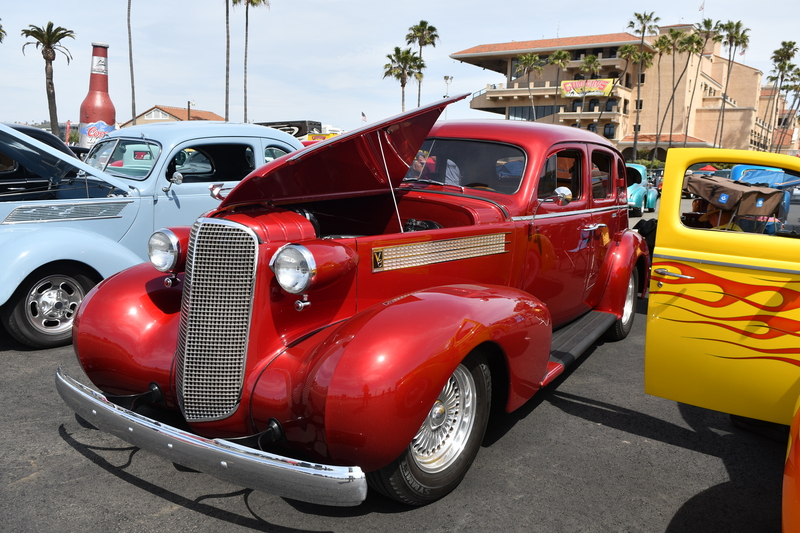 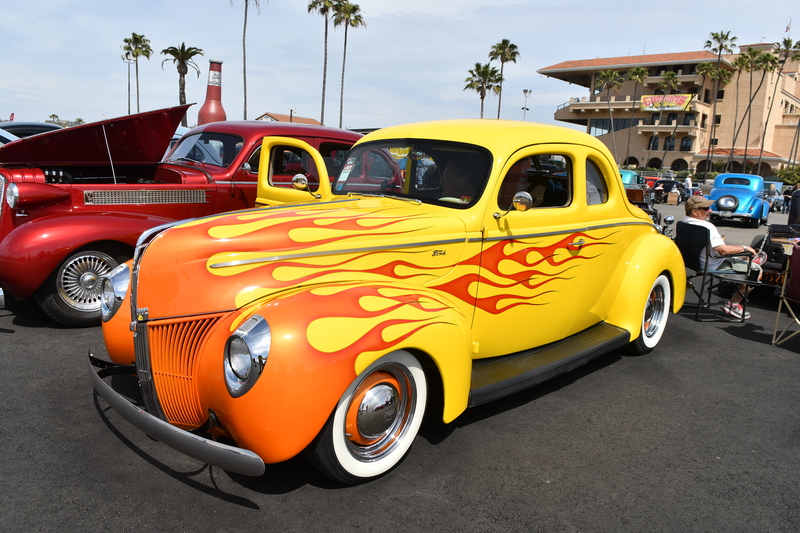 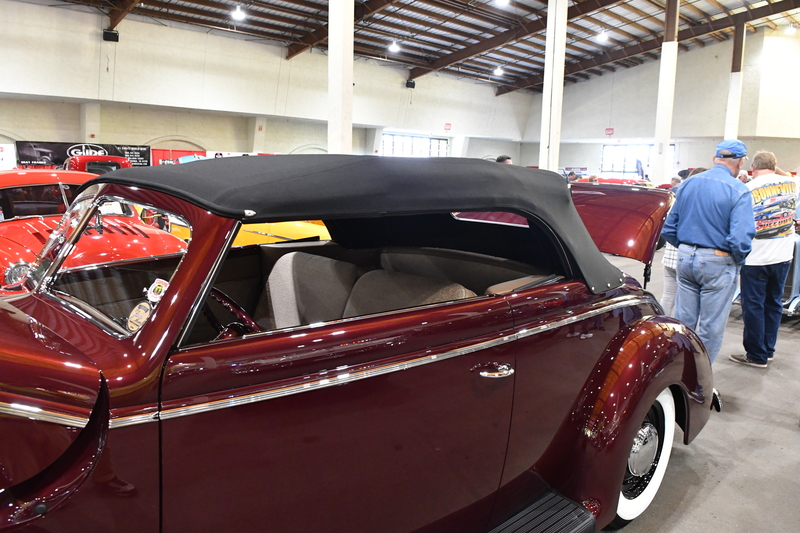 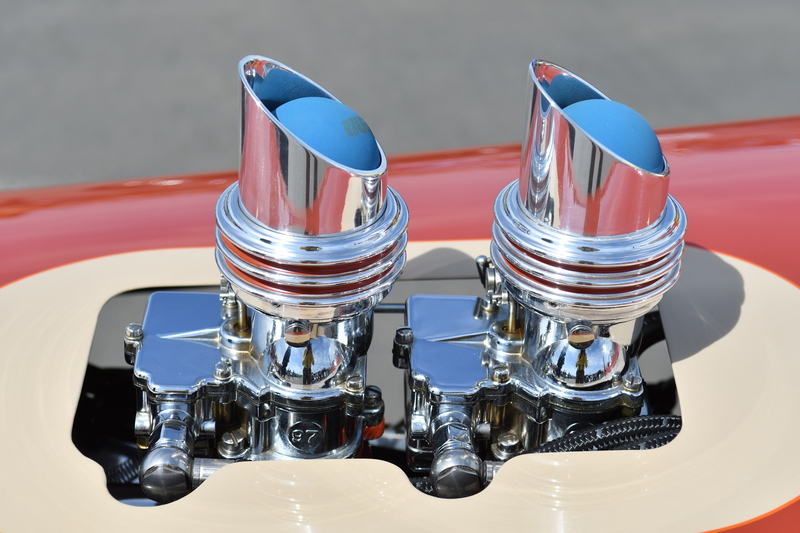 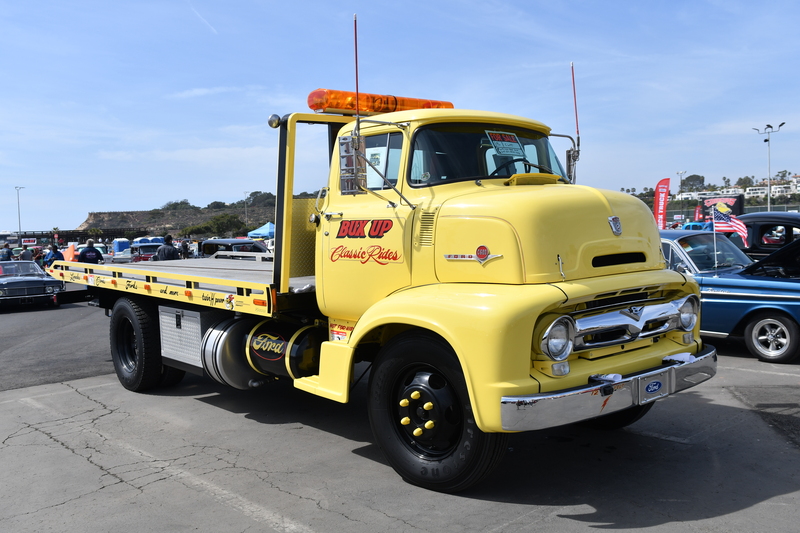 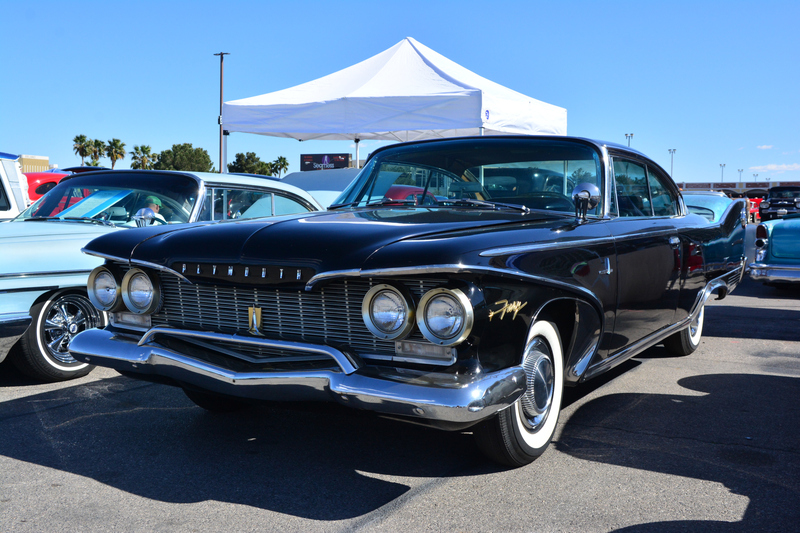 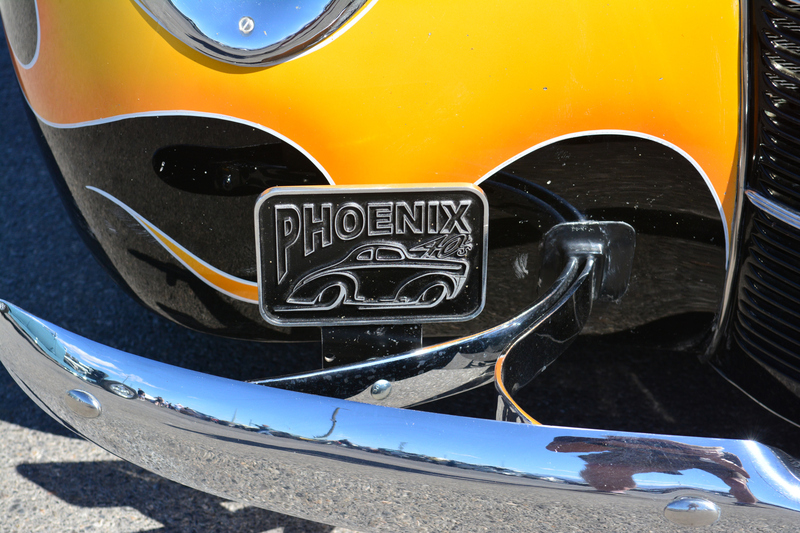 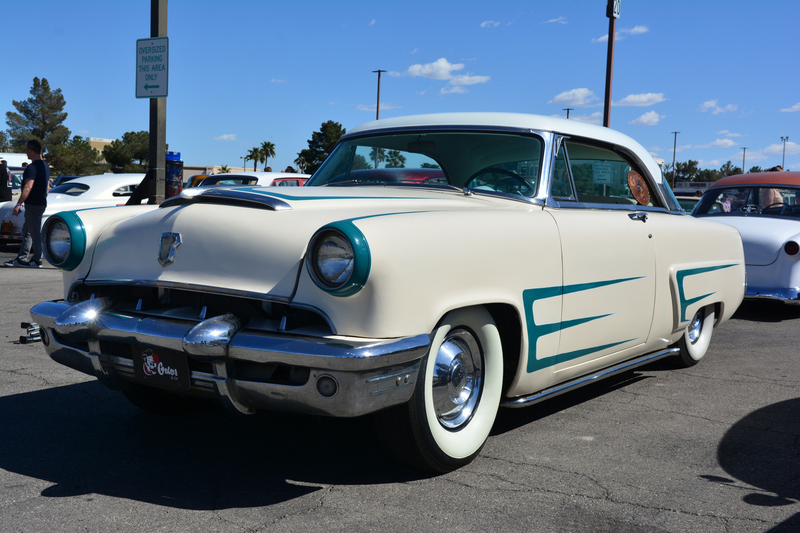 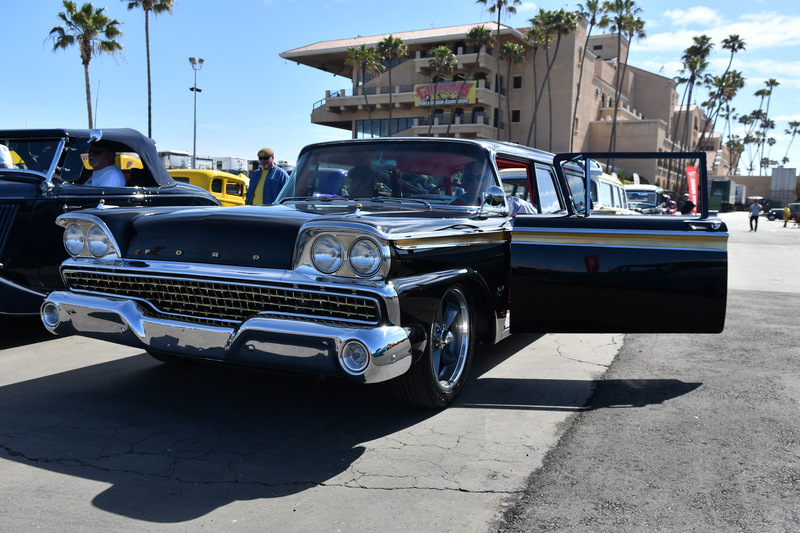 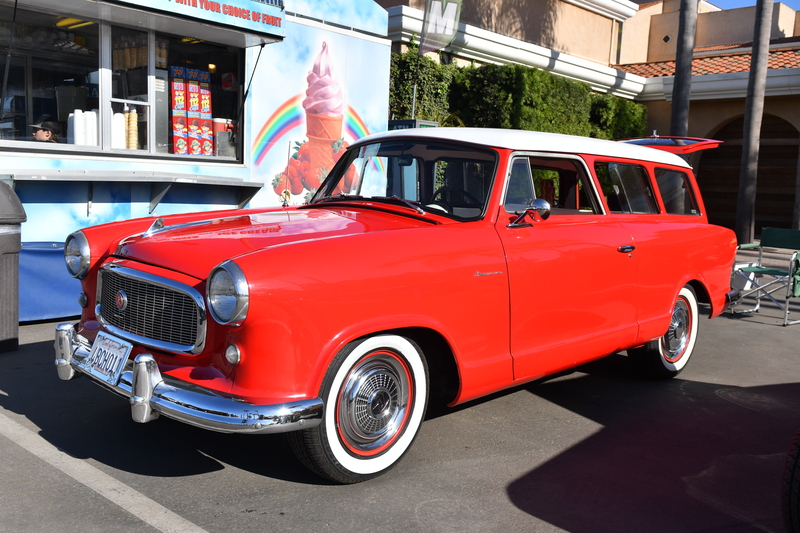 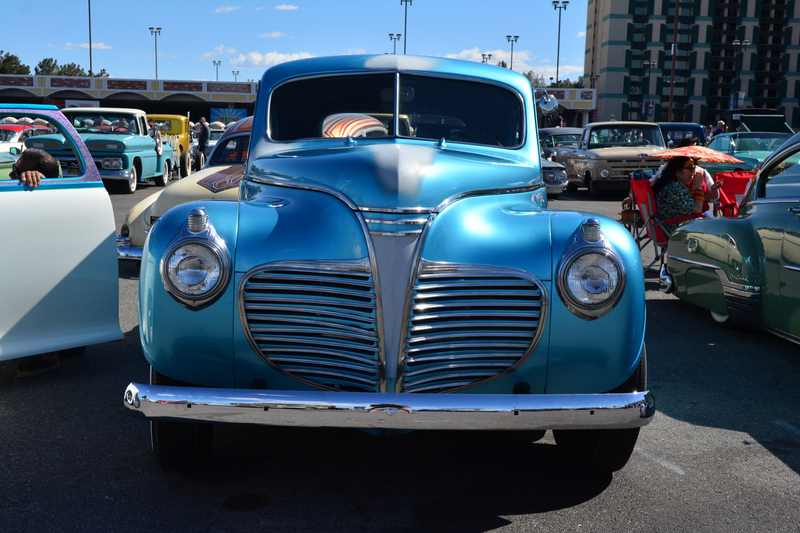 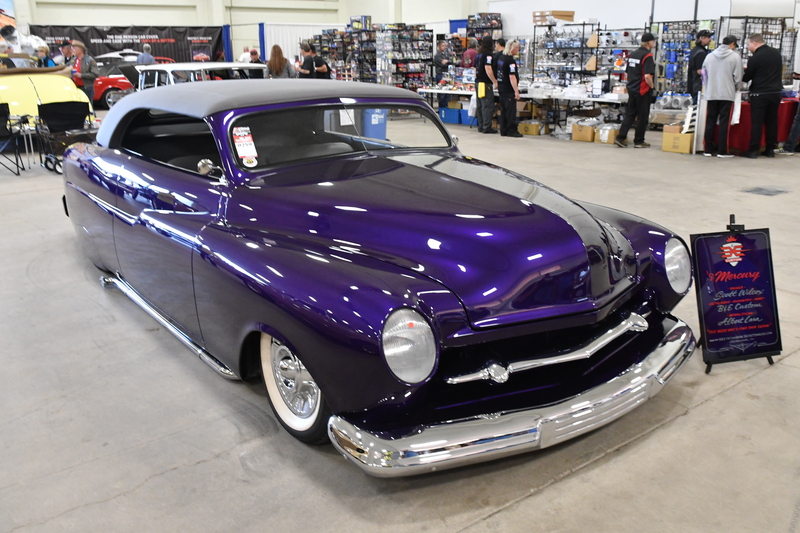 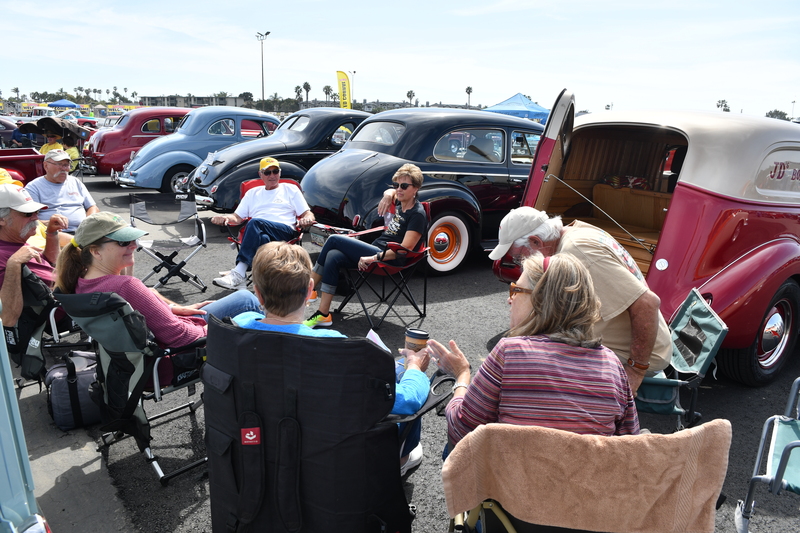 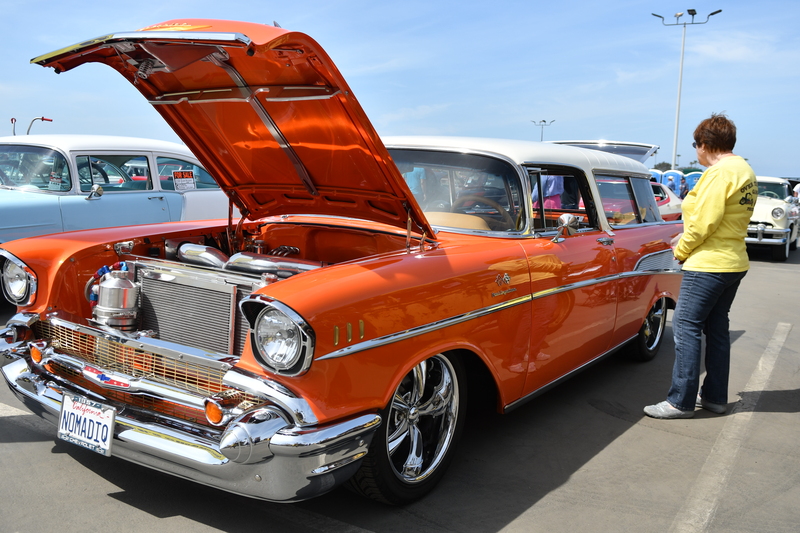 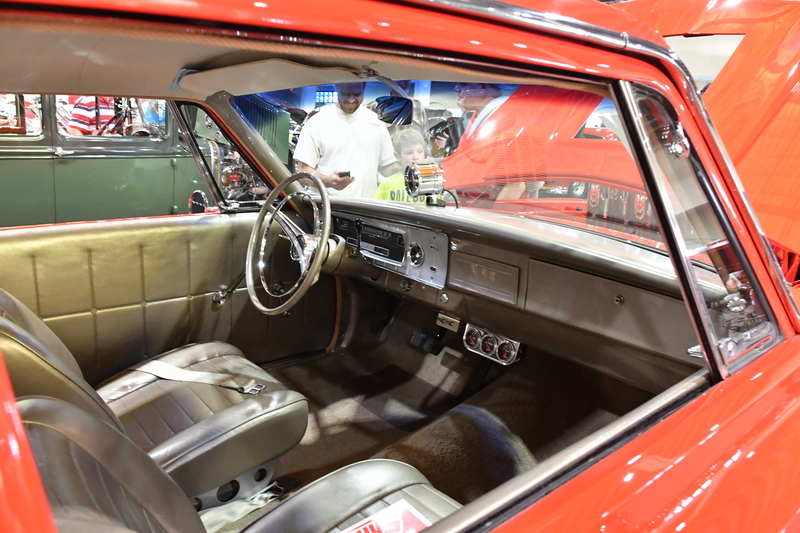 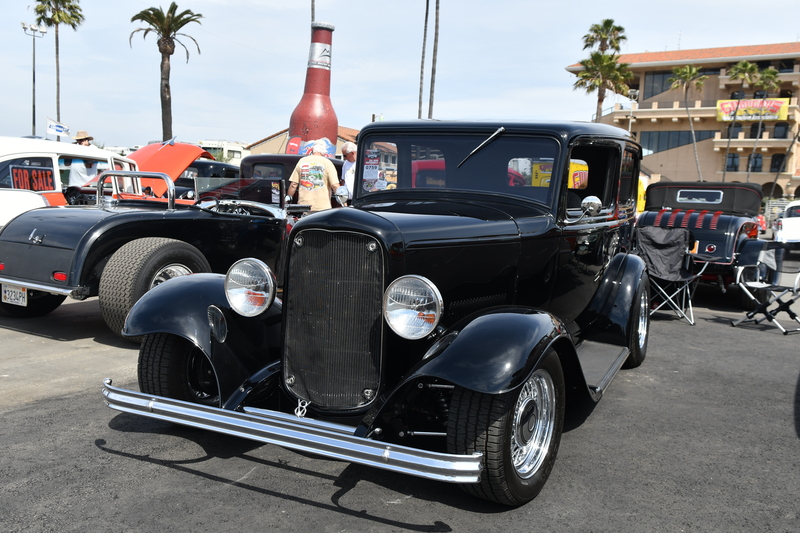 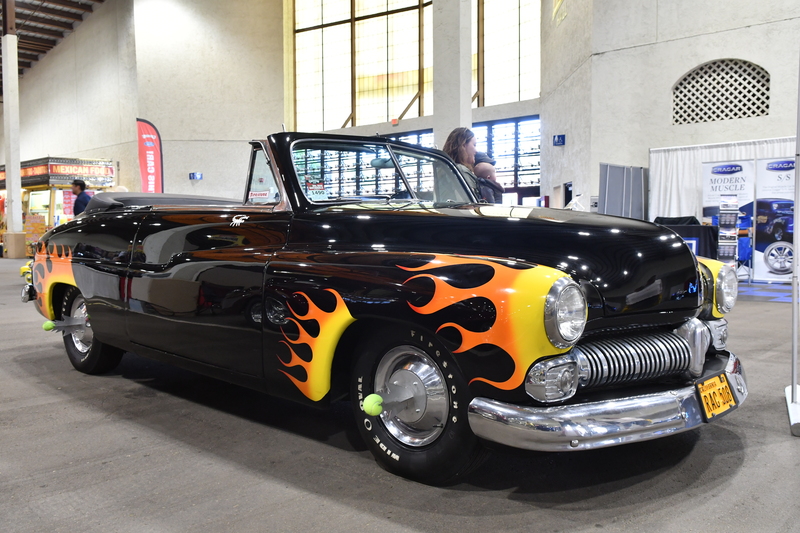 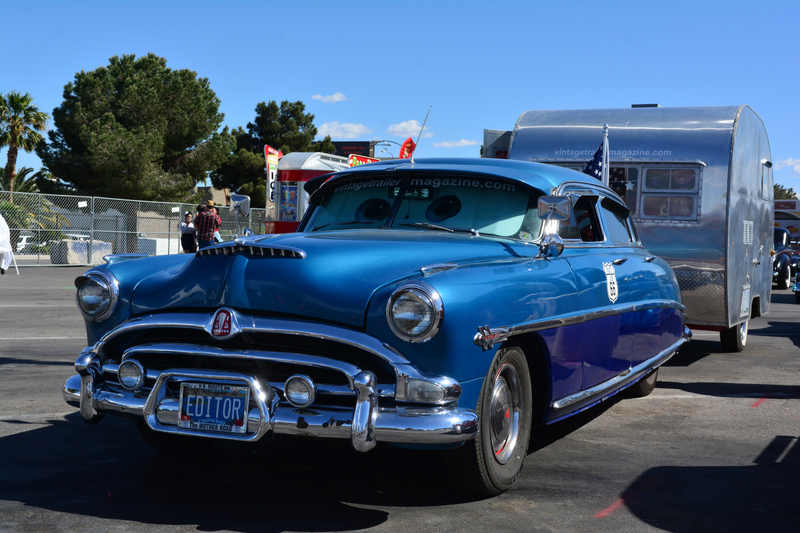 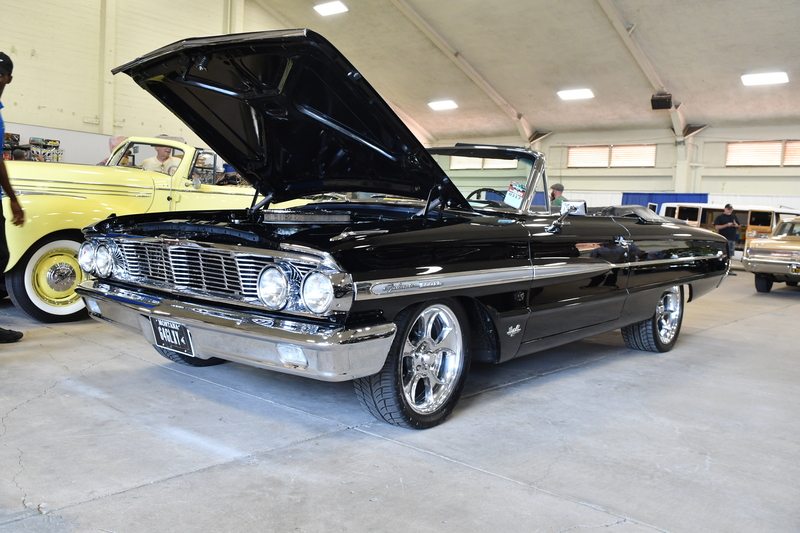 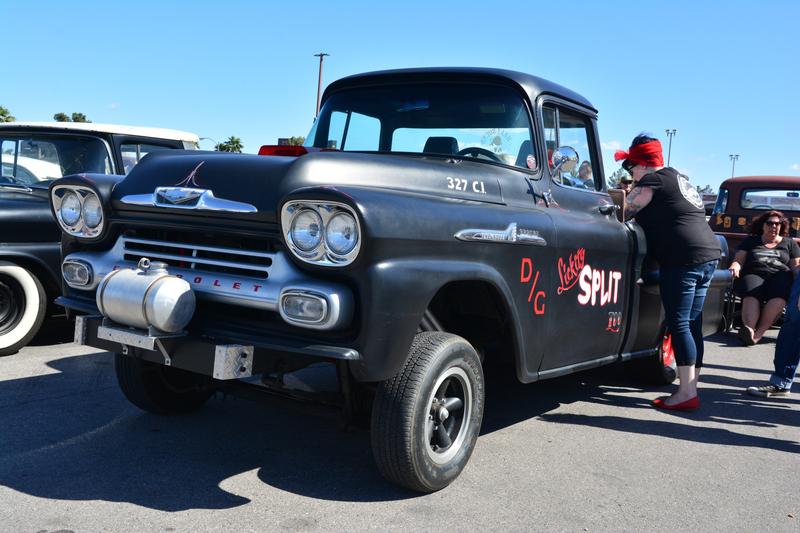 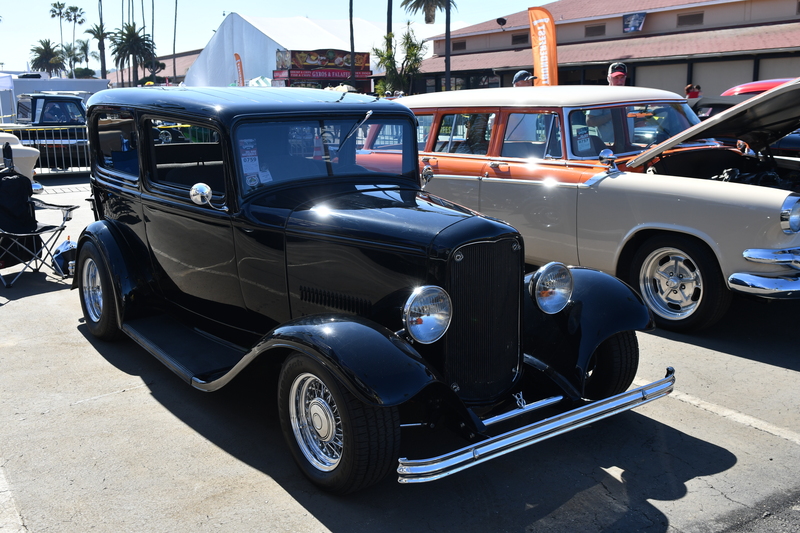 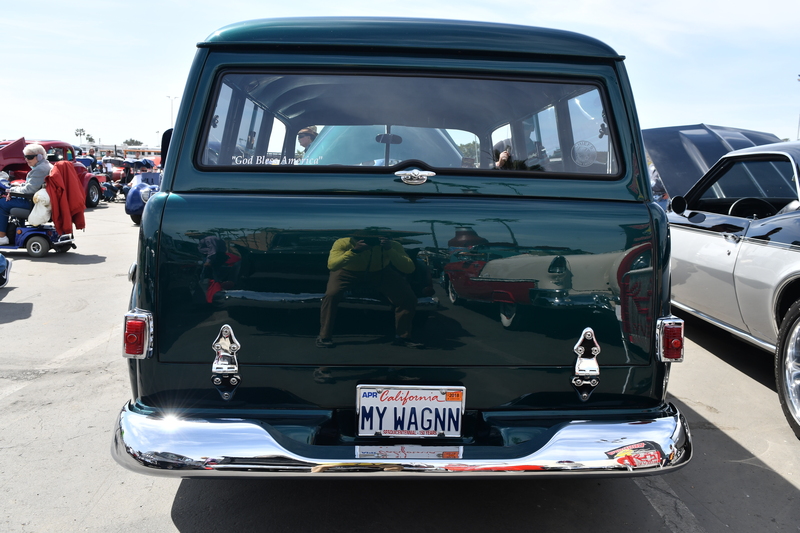 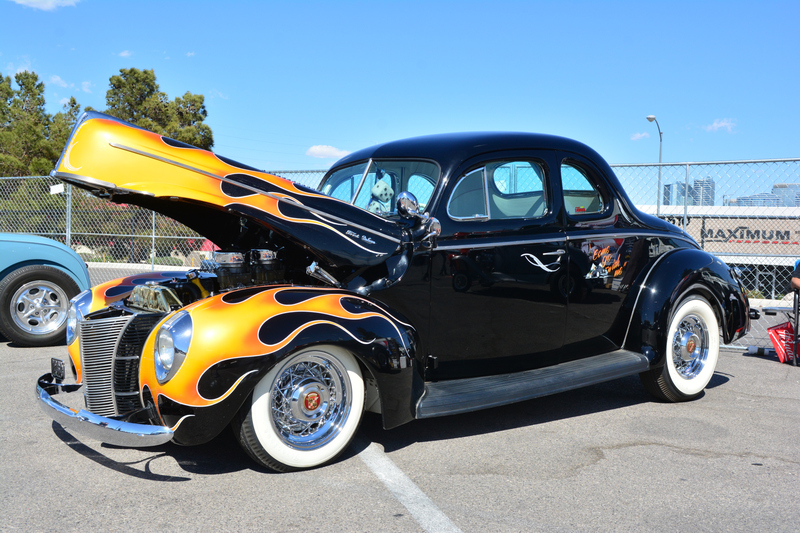 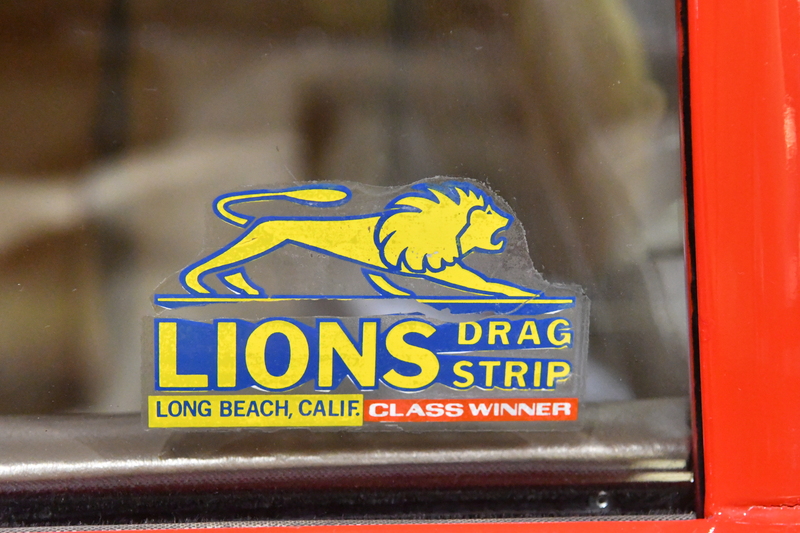 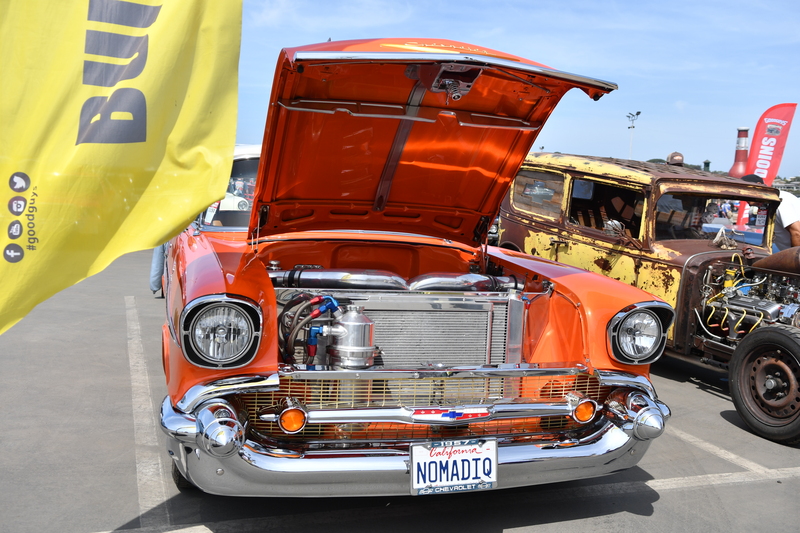 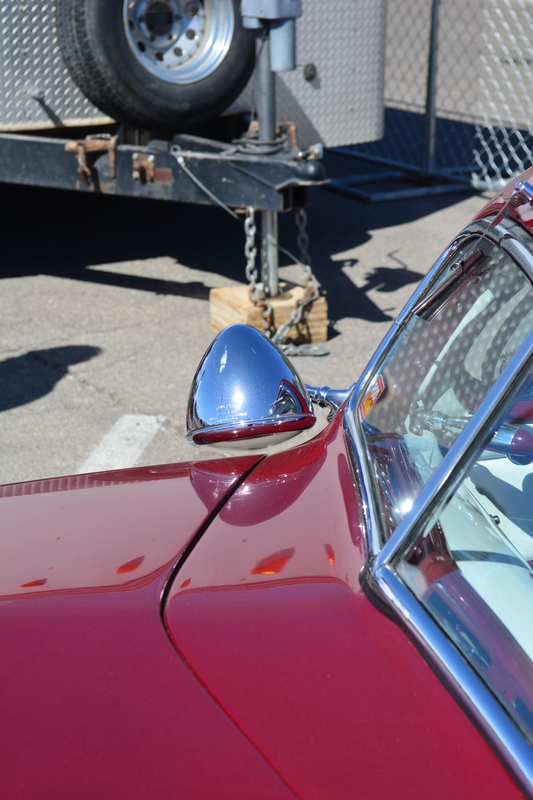 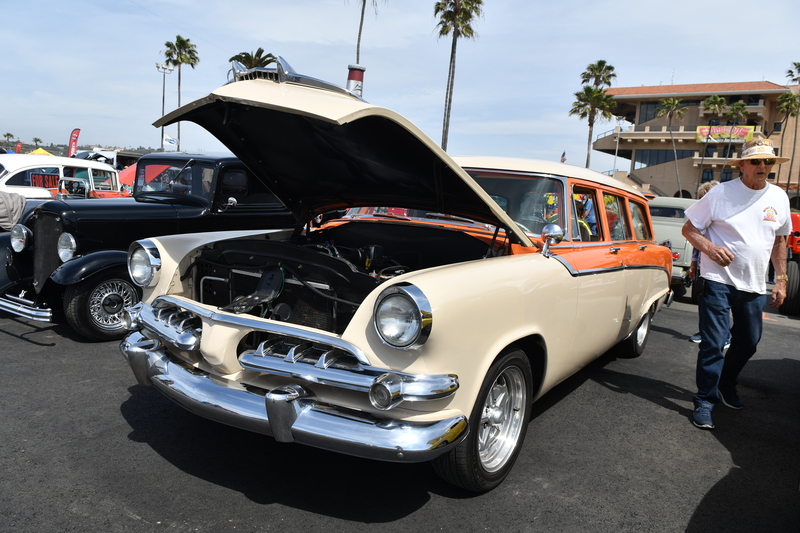 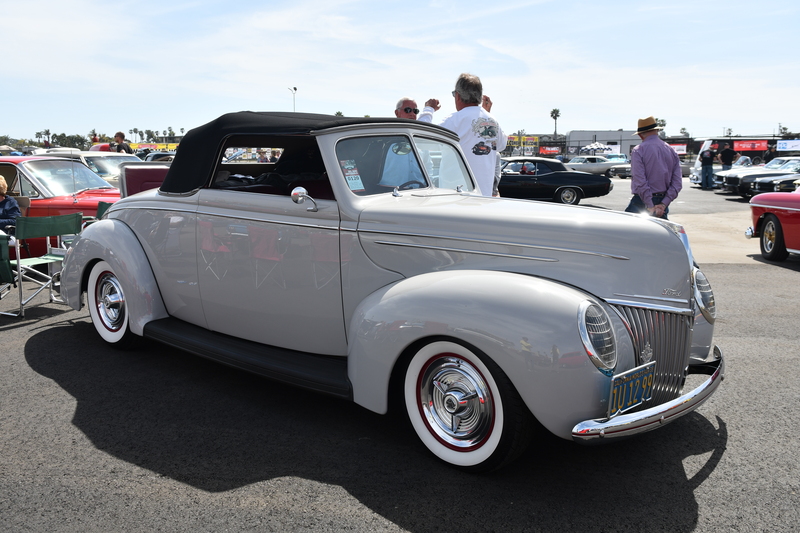 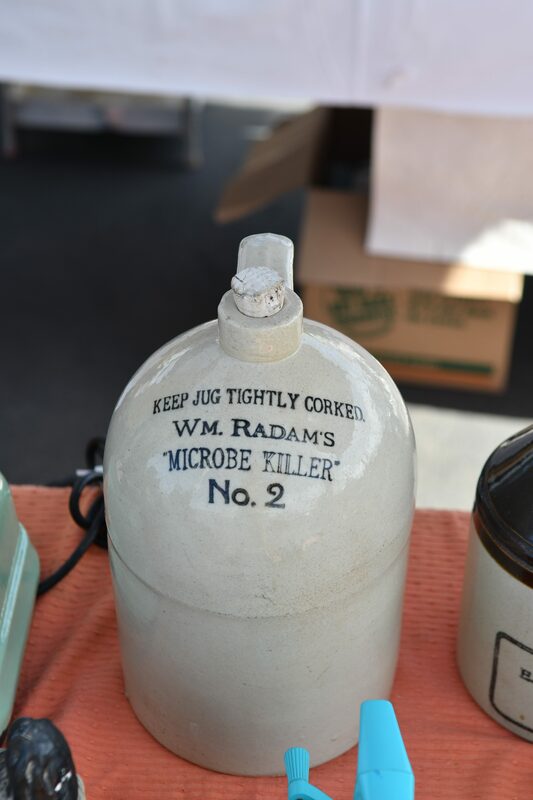 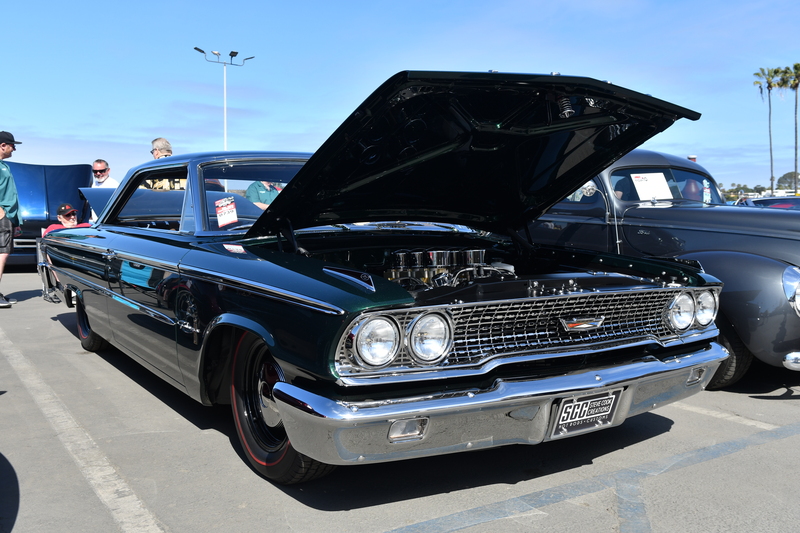 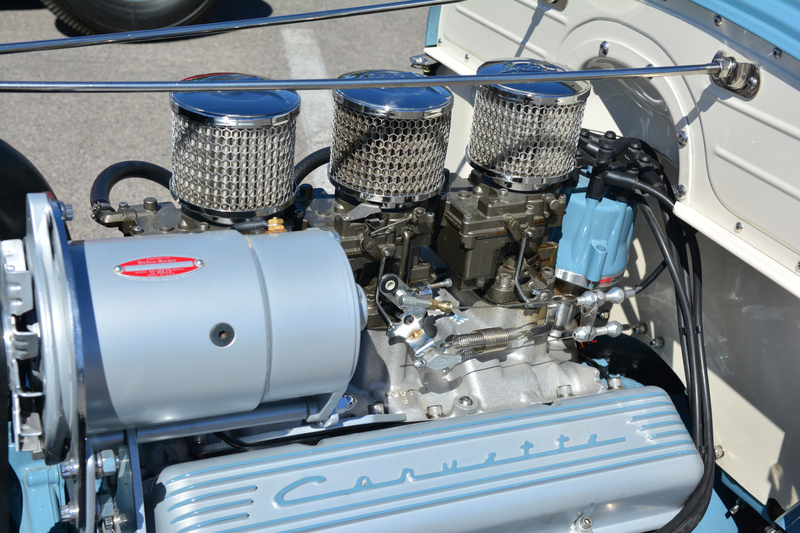 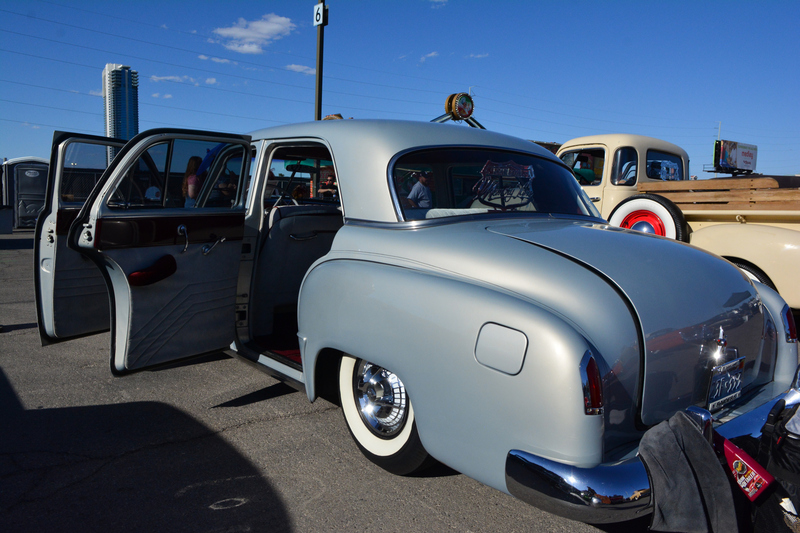 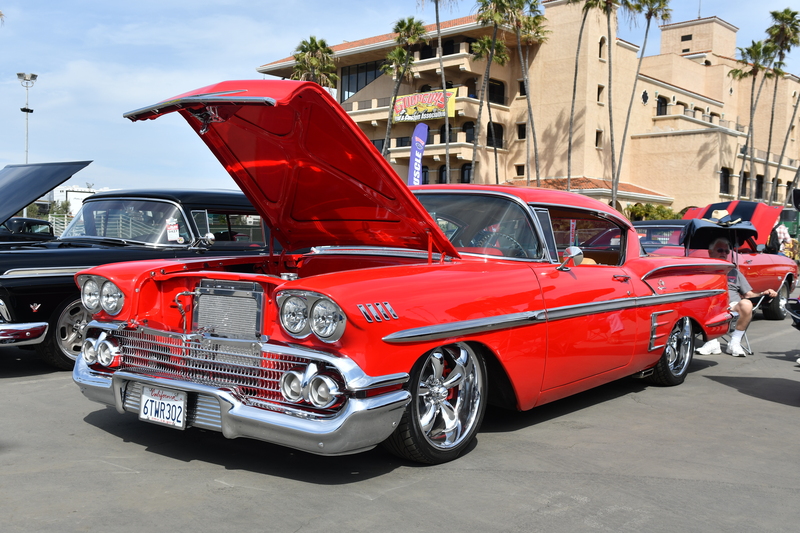 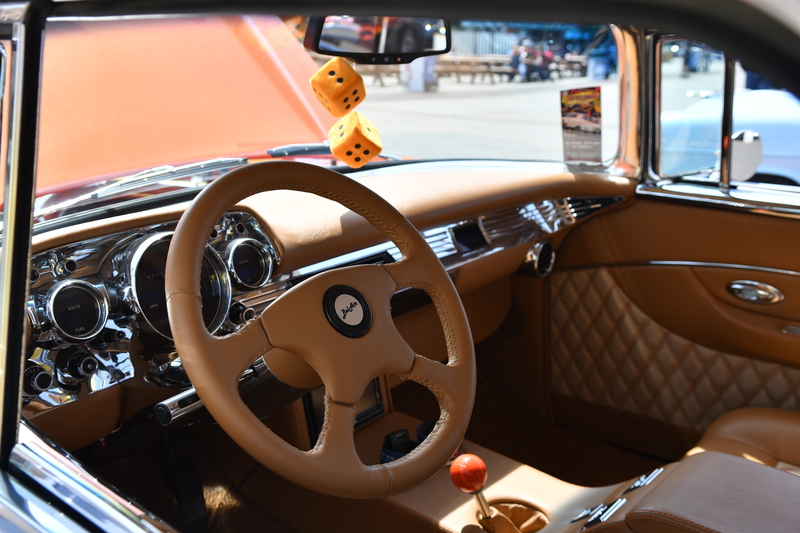 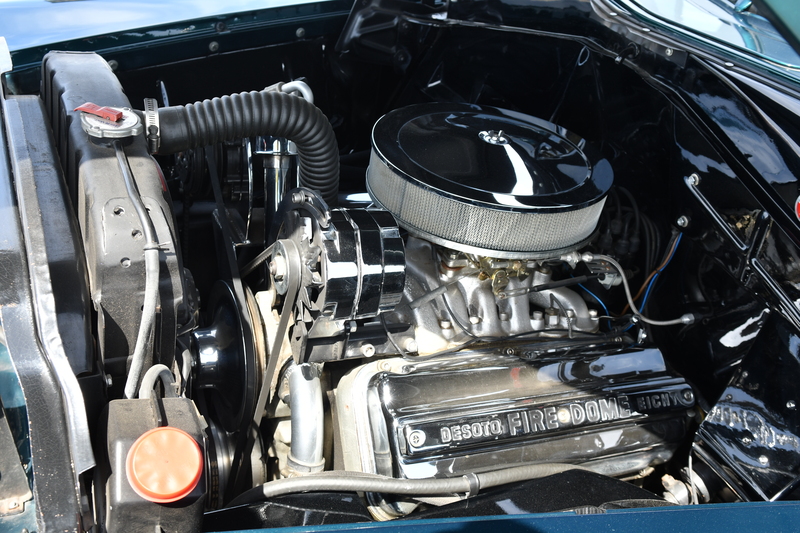 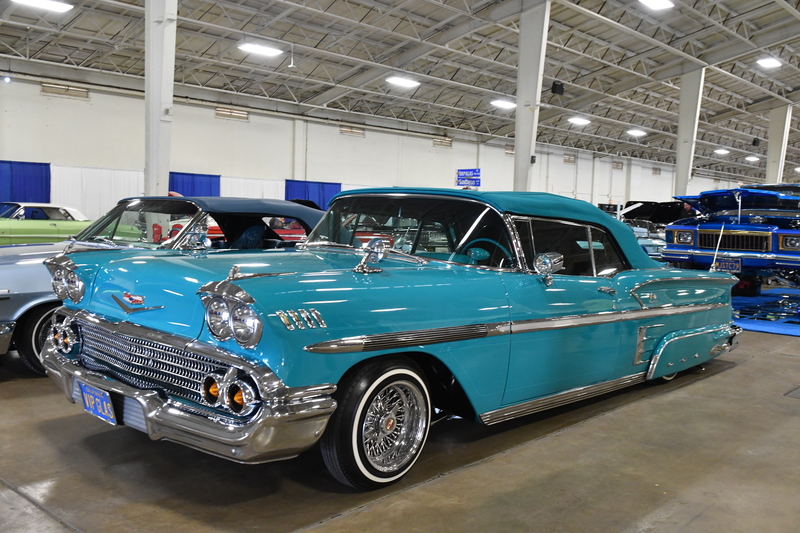 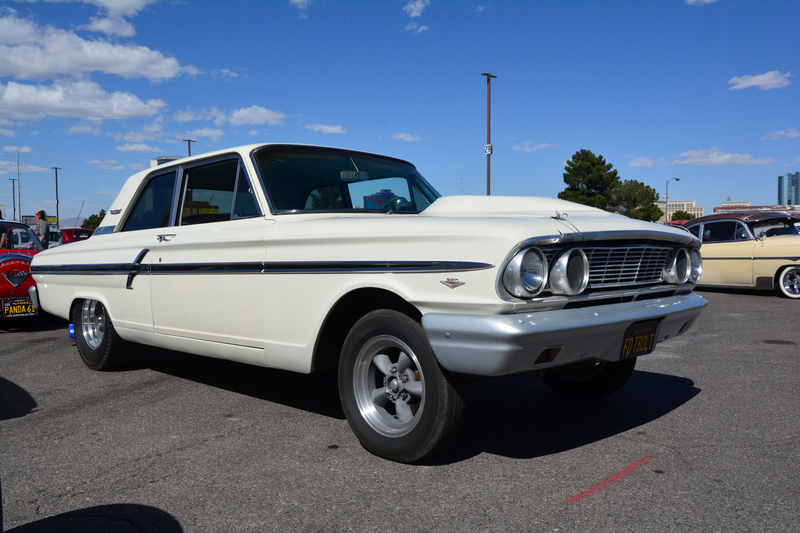 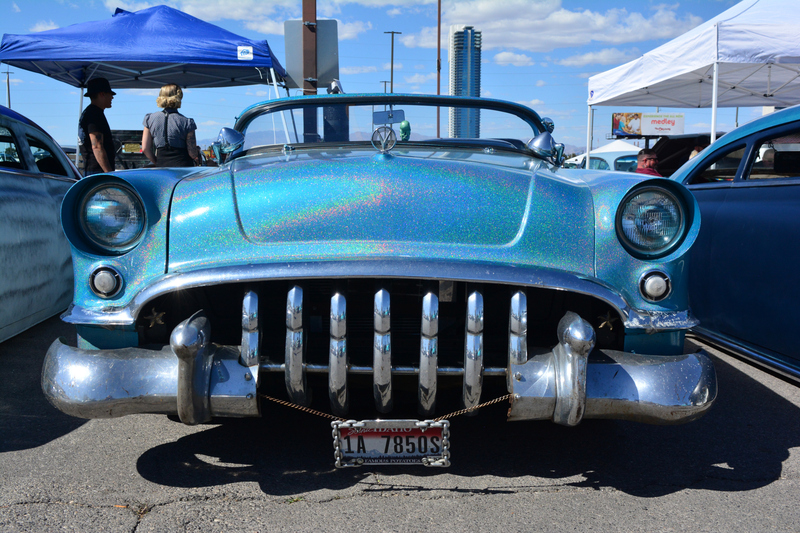 Most of the spectators show up on Saturday for all of the Rockabilly music and attractions, so Friday is typically a good day for checking out the cars and chatting with folks. 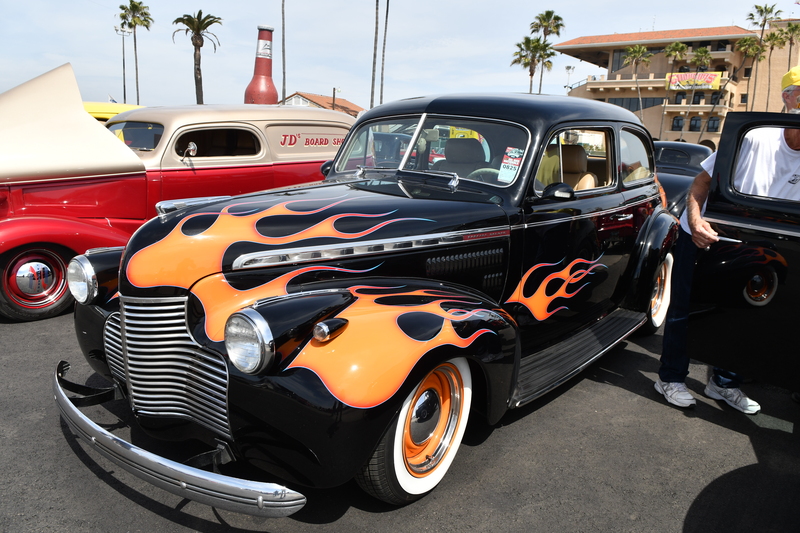 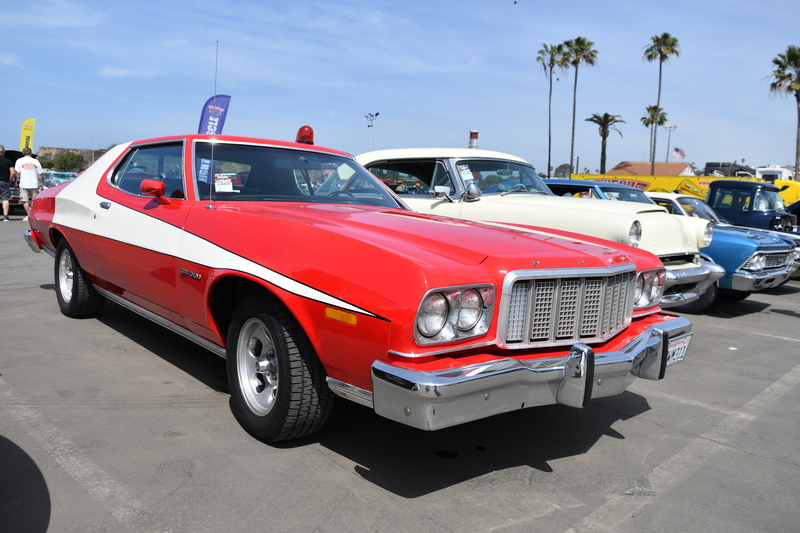 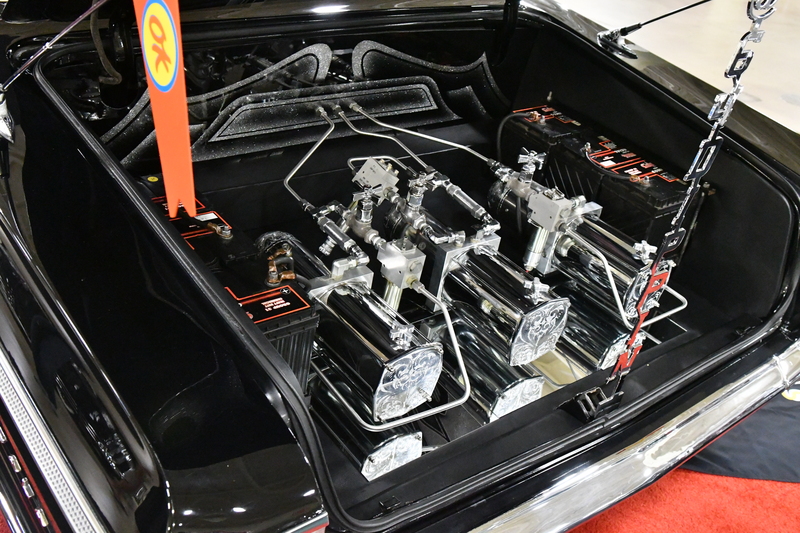 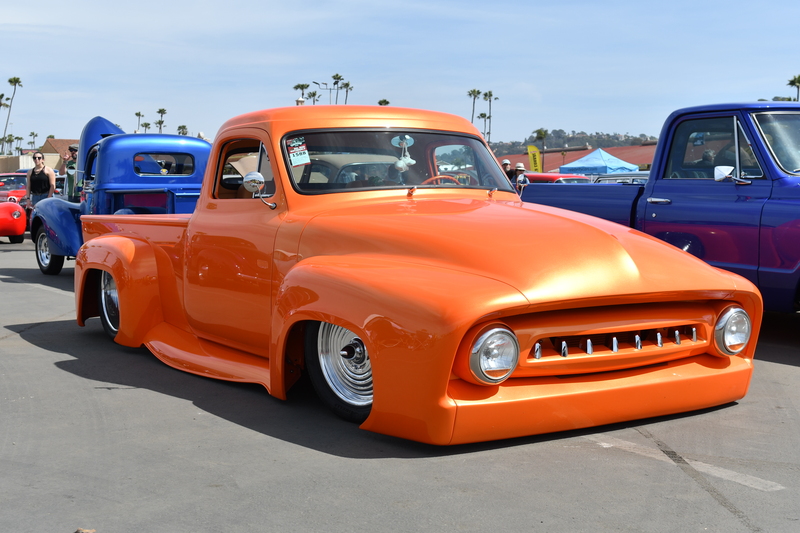 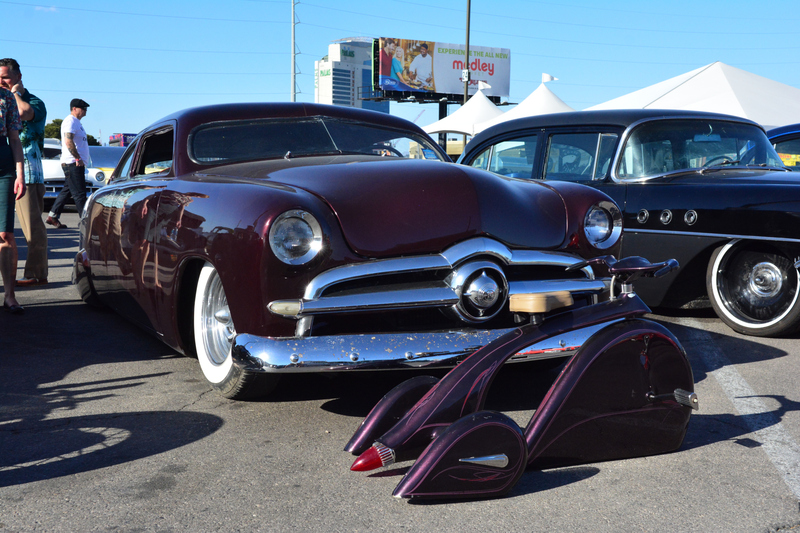 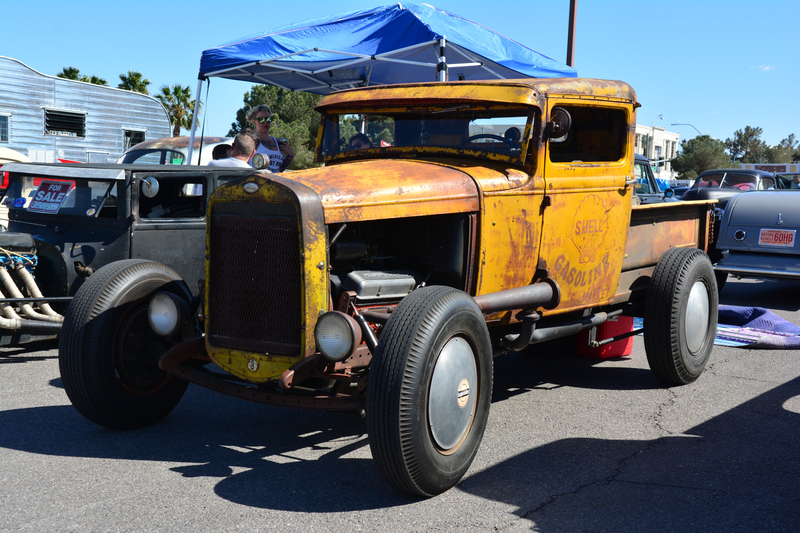 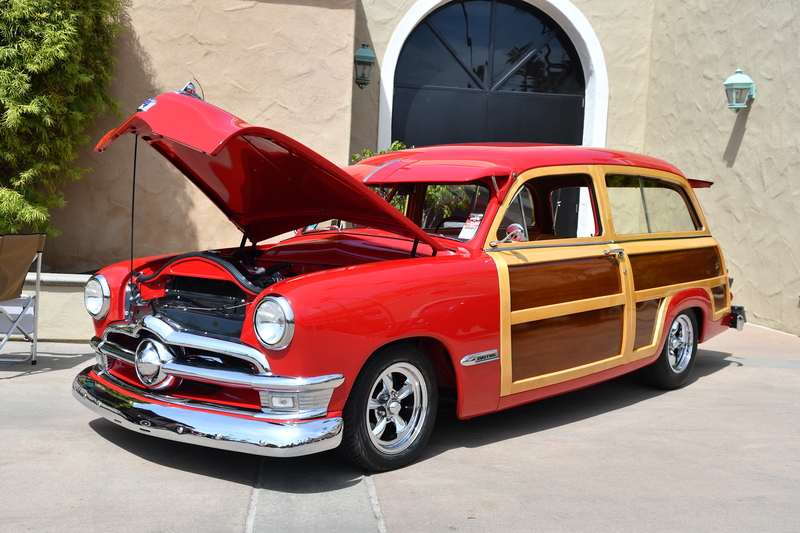 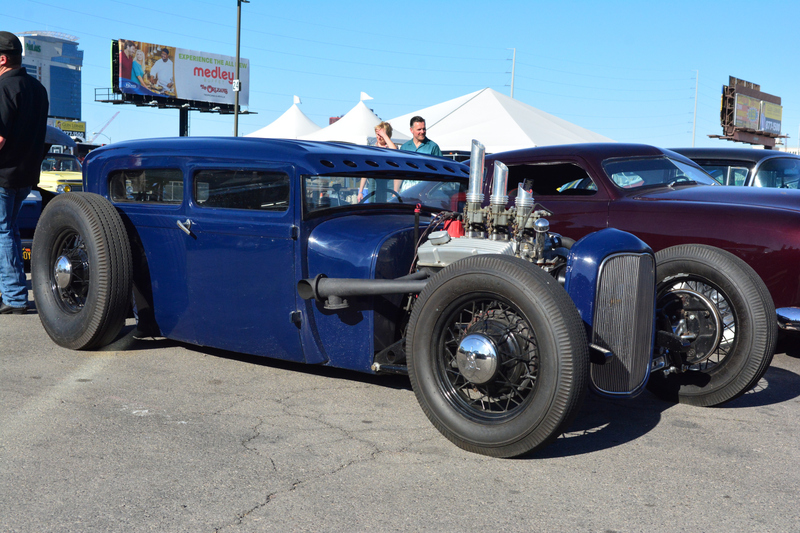 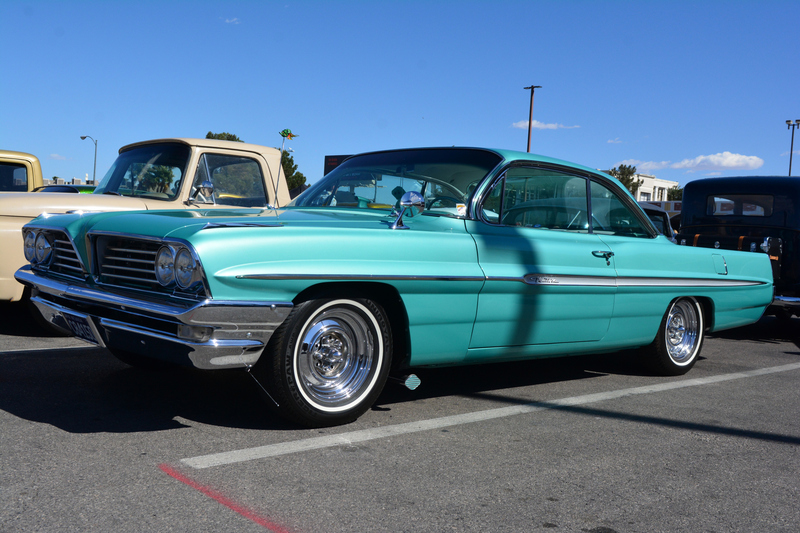 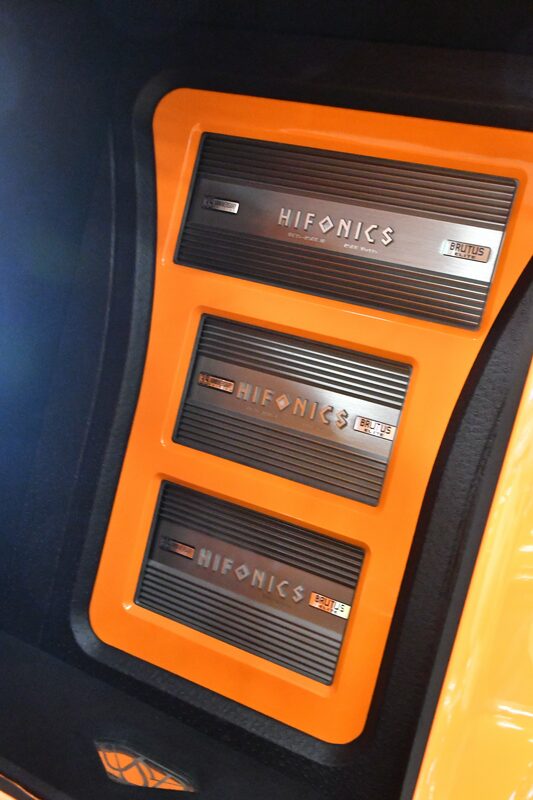 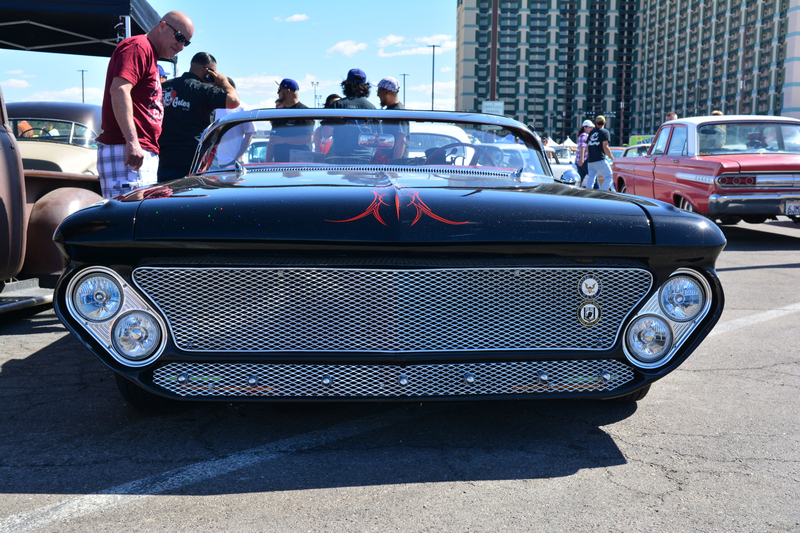 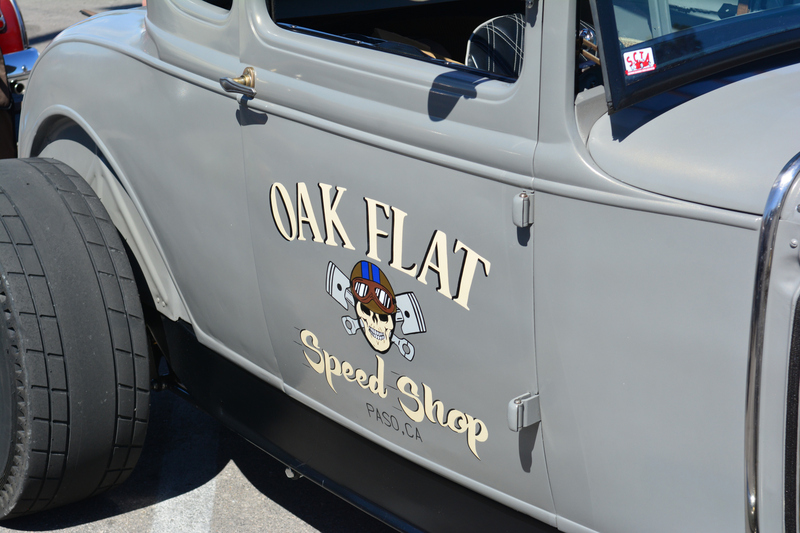 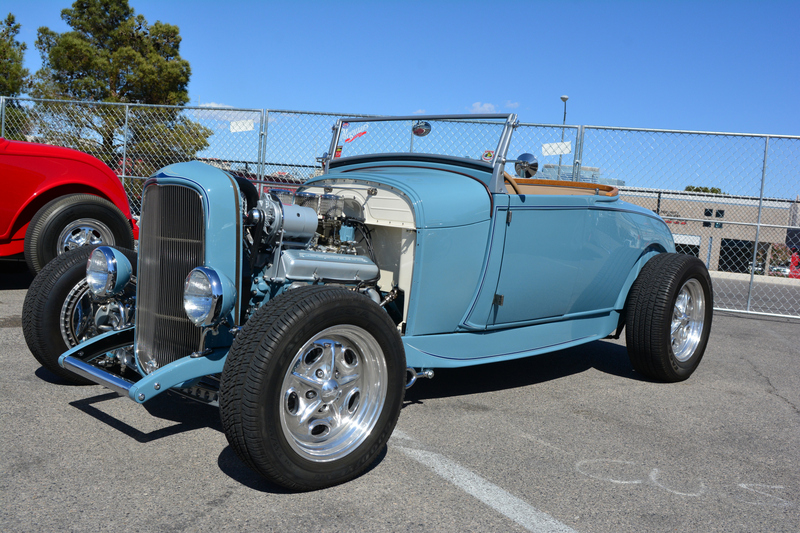 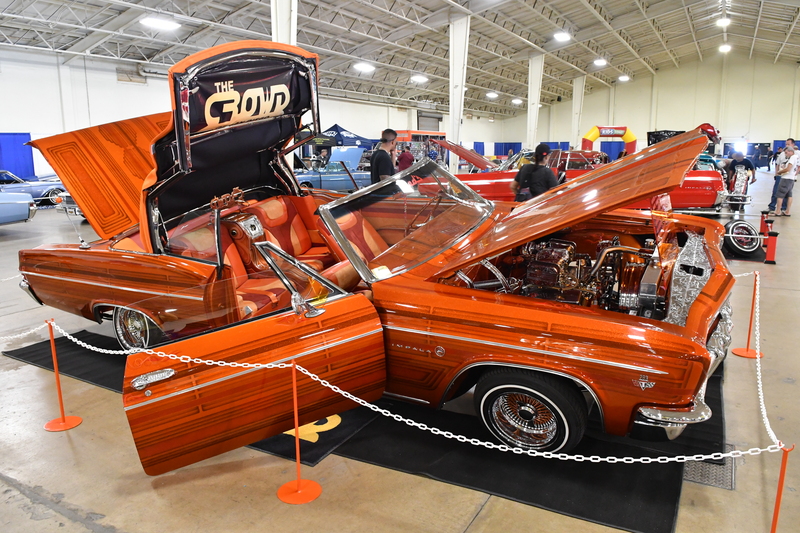 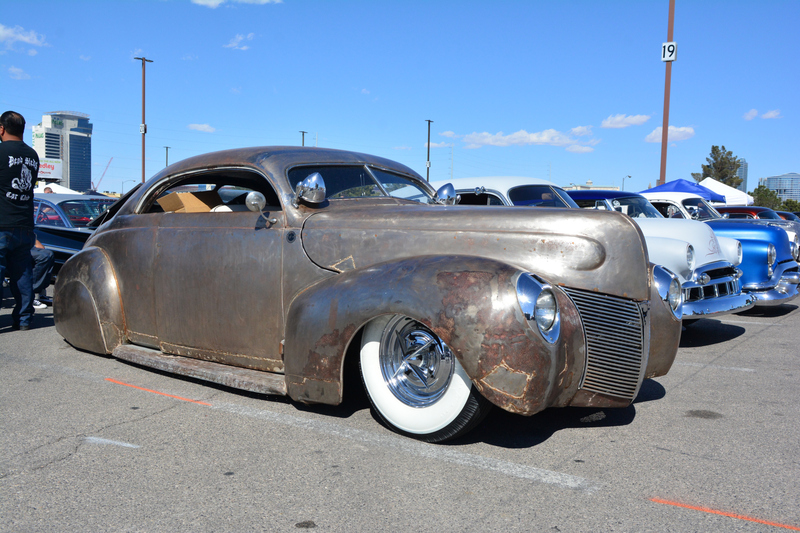 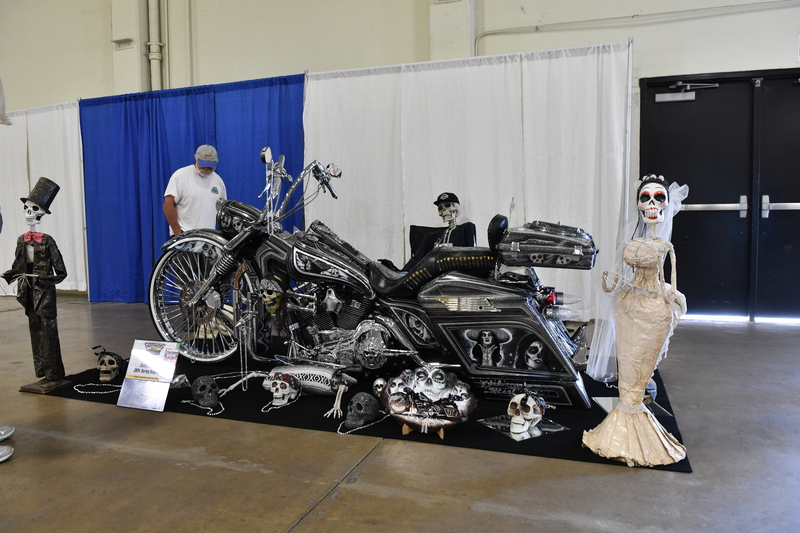 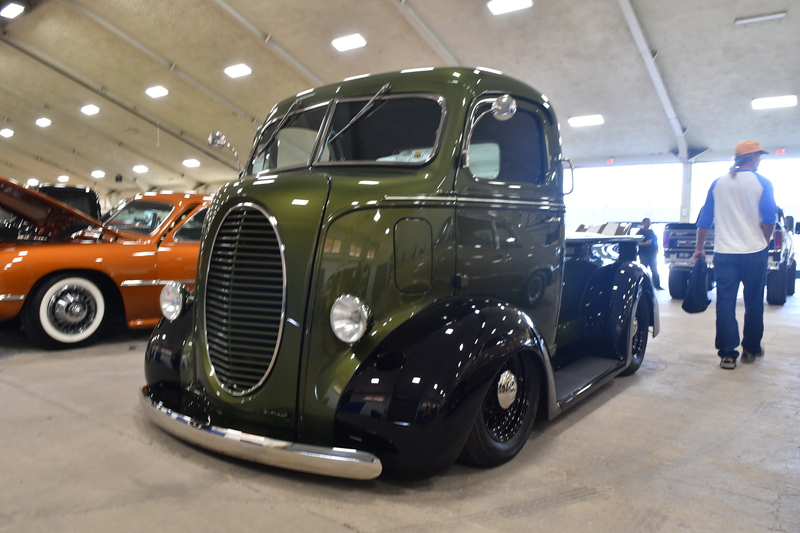 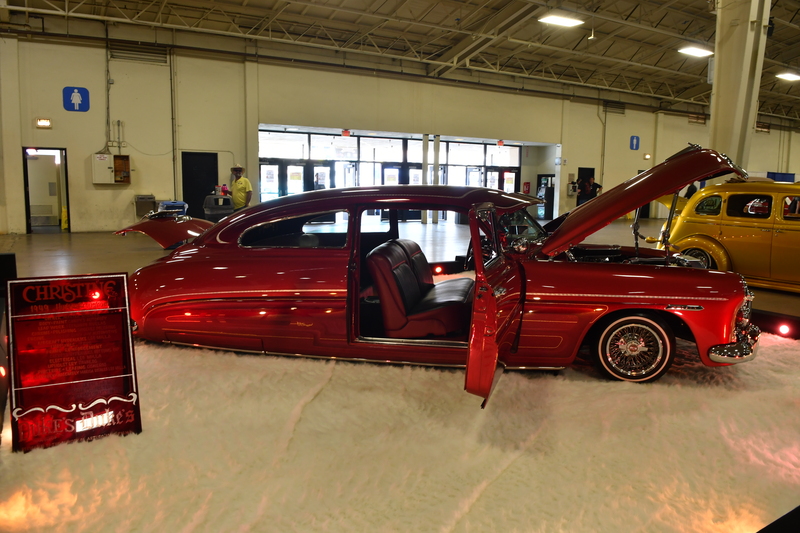 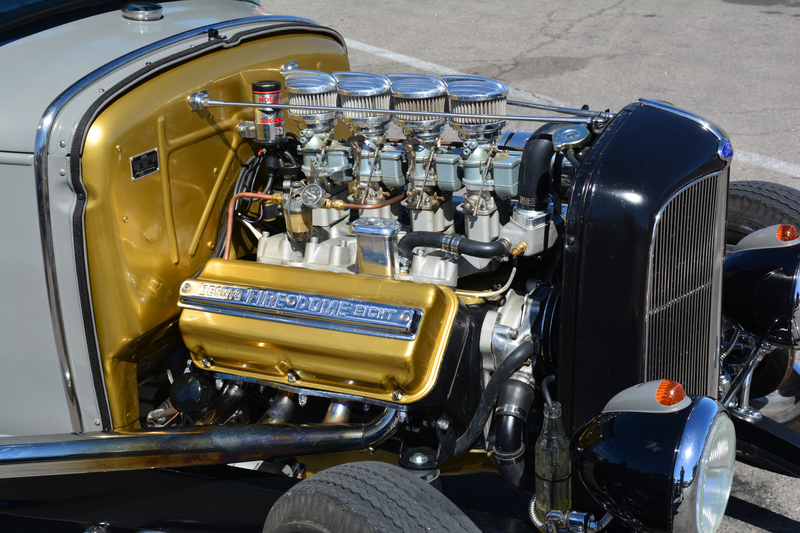 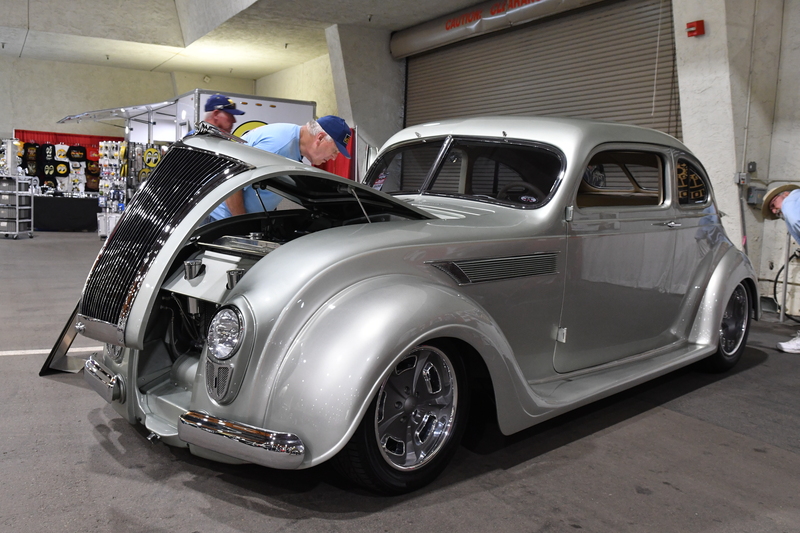 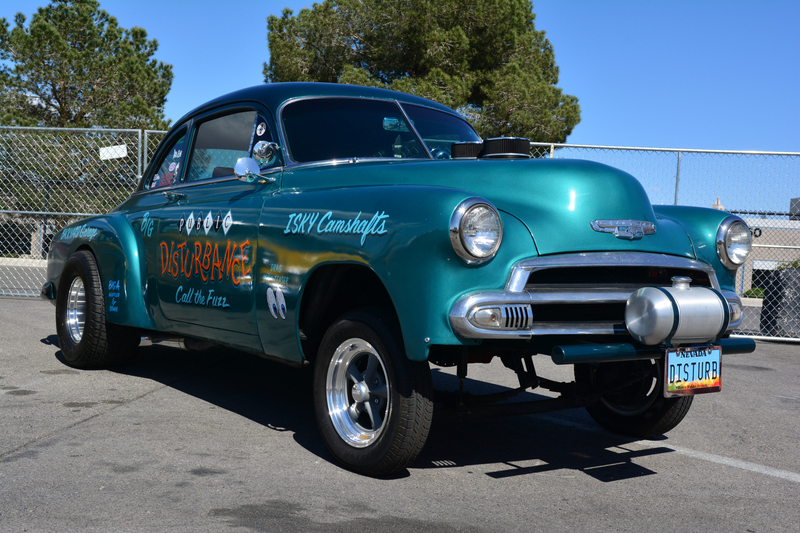 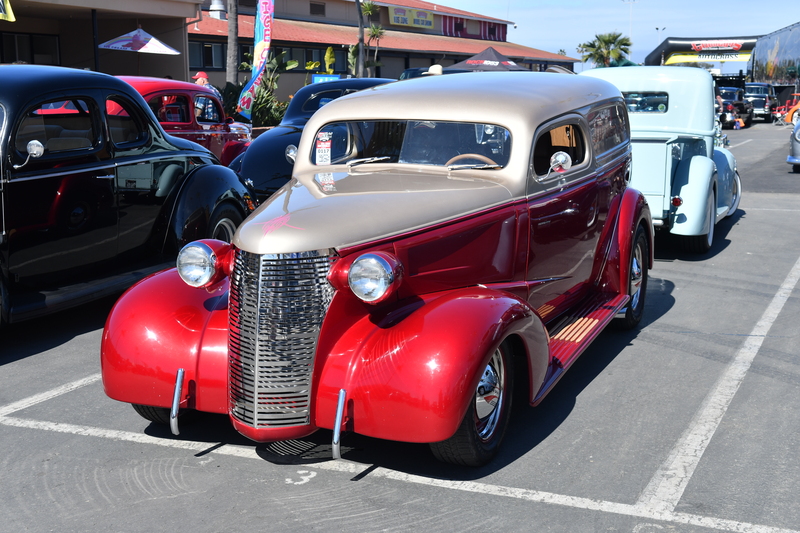 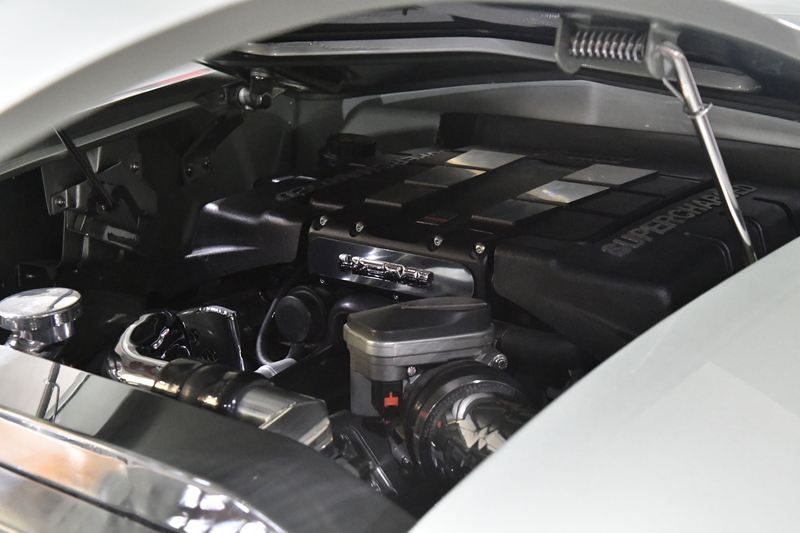 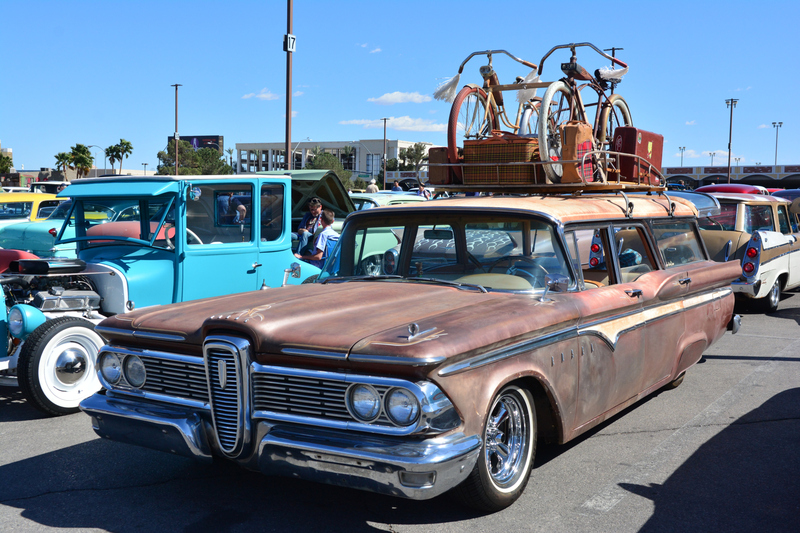 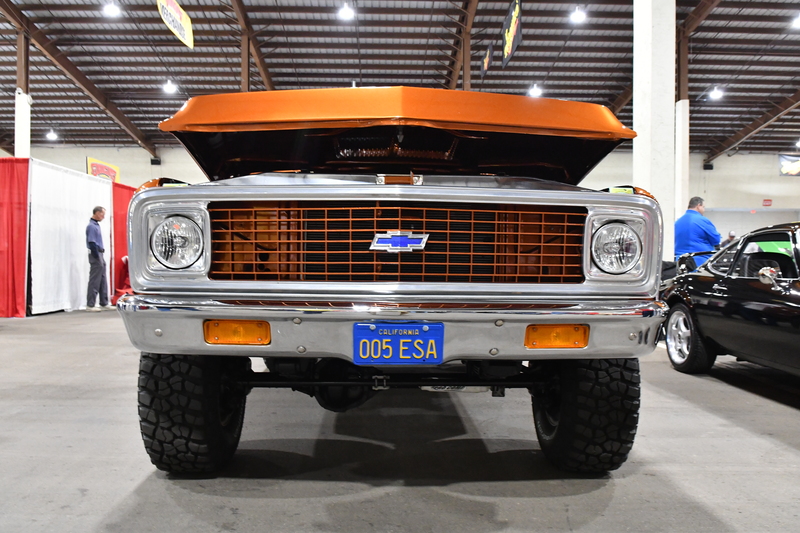 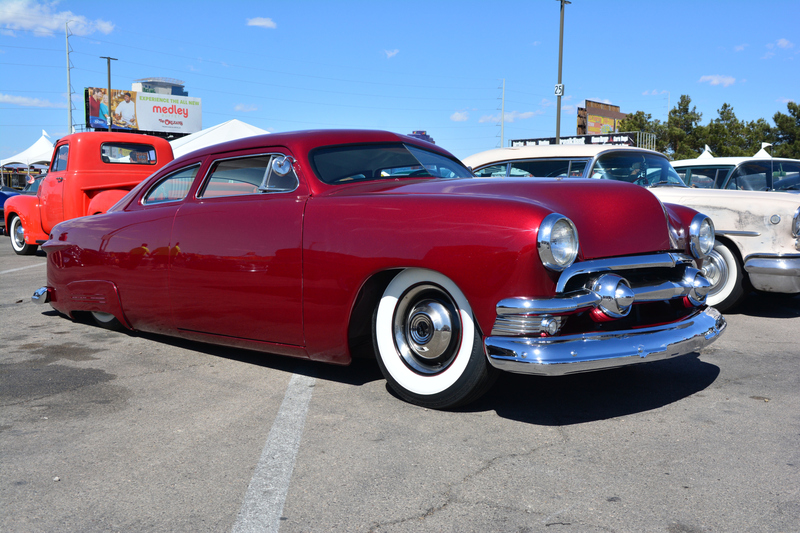 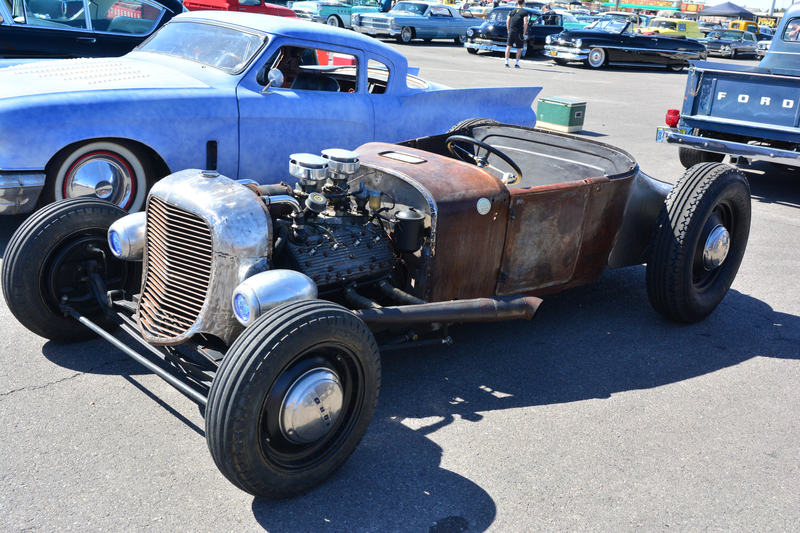 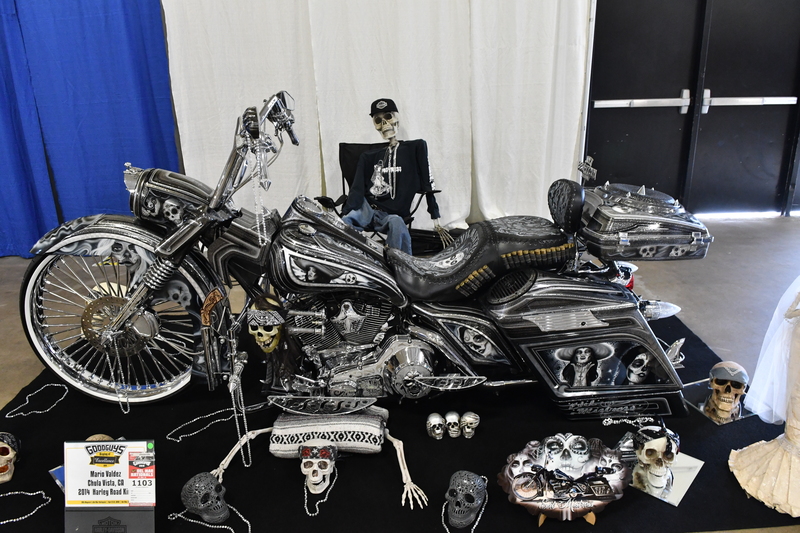 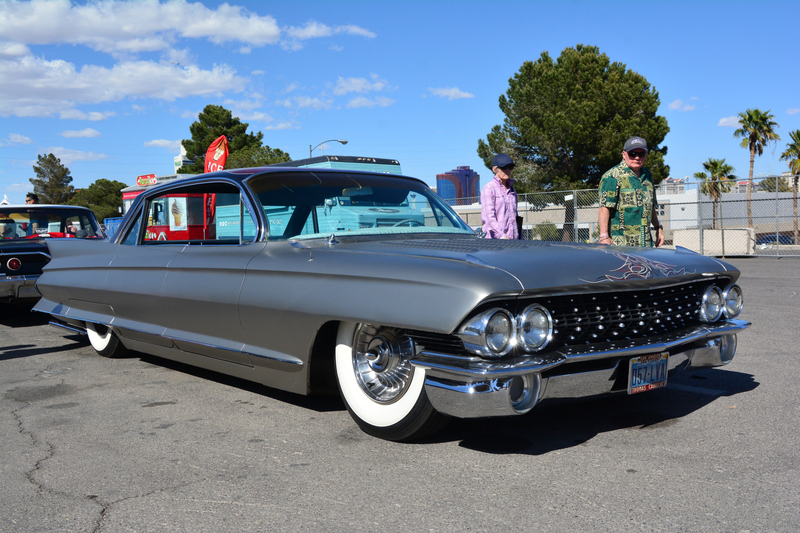 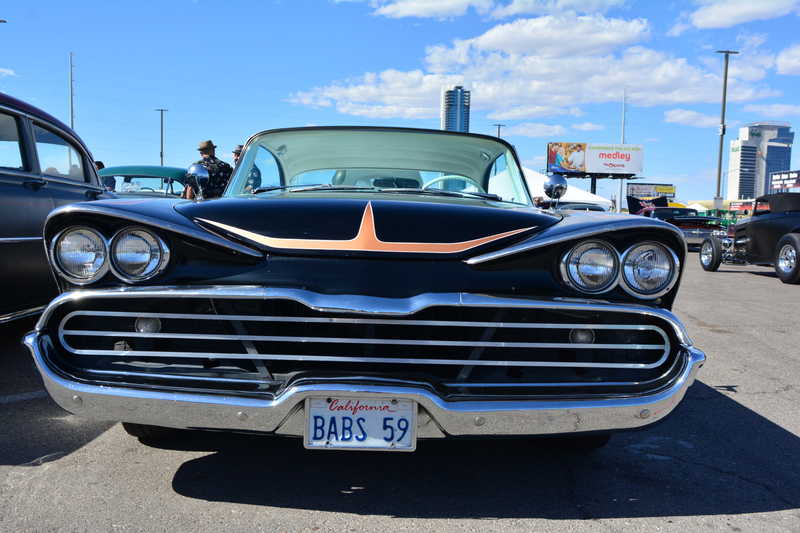 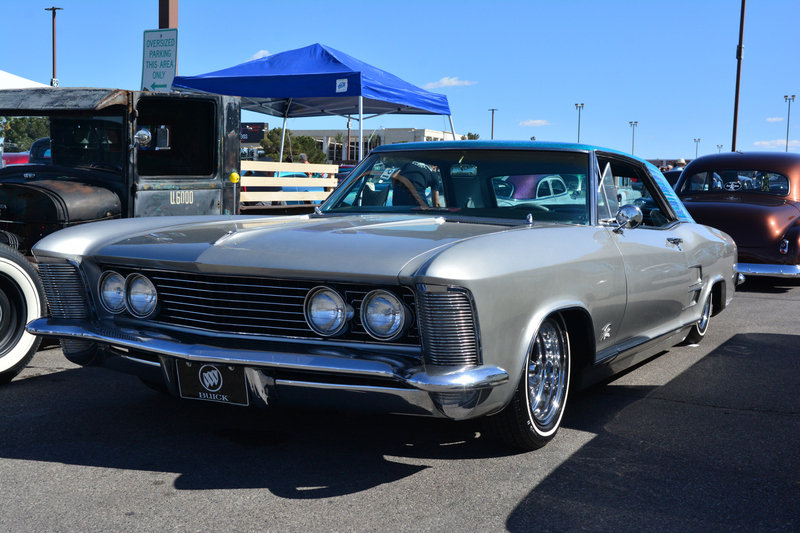 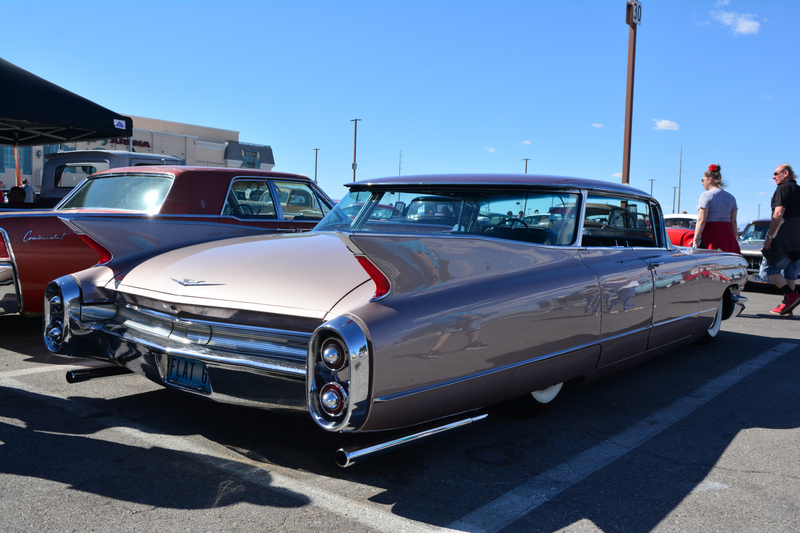 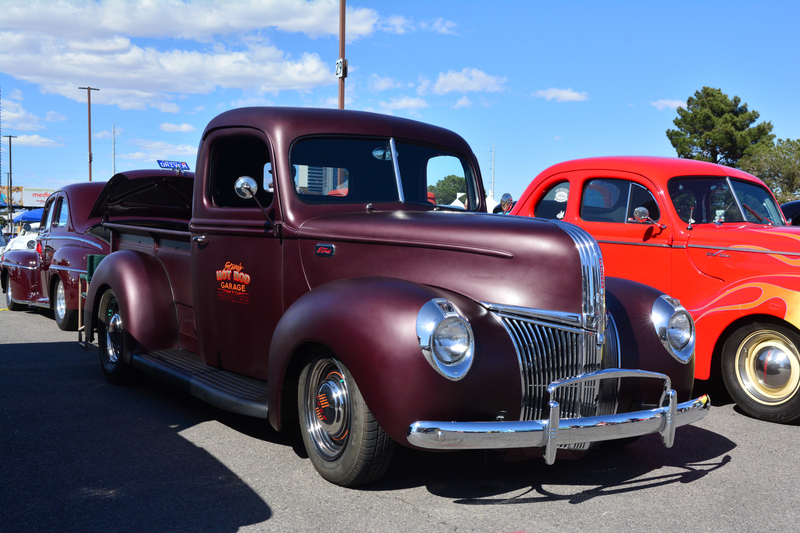 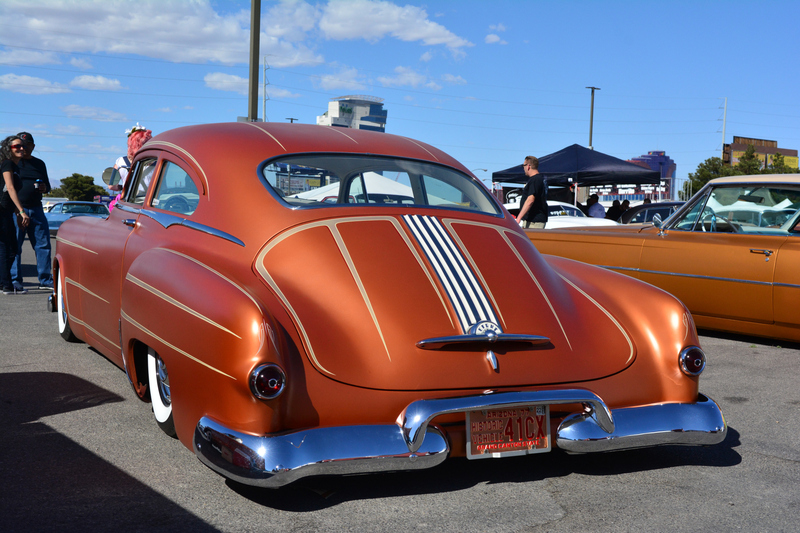 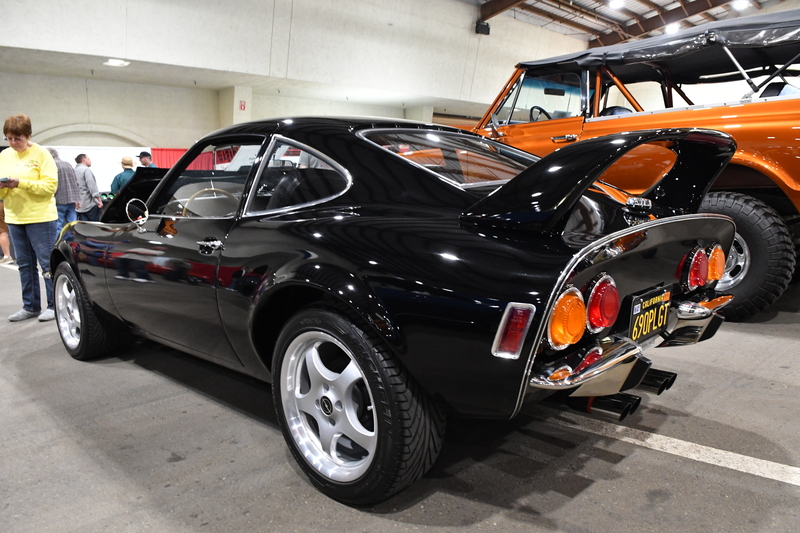 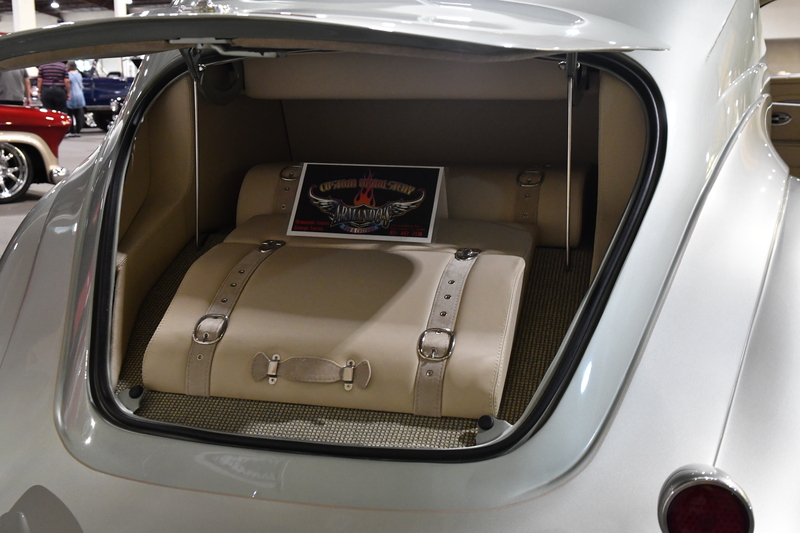 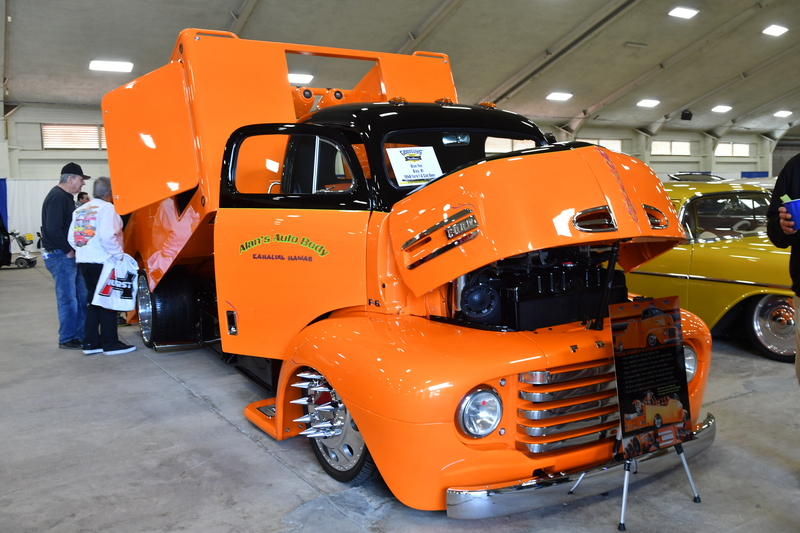 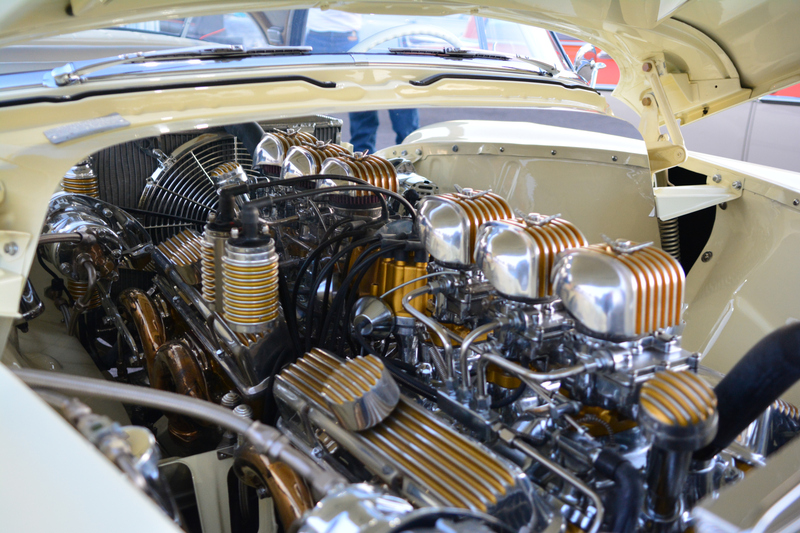 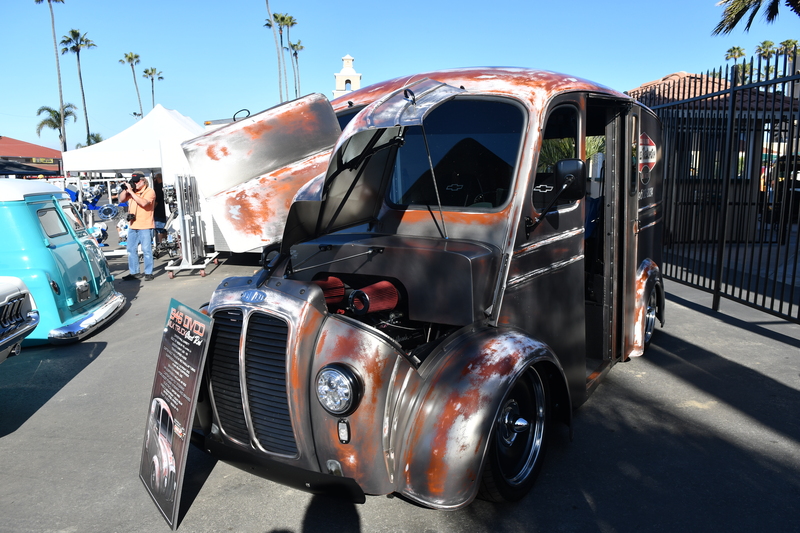 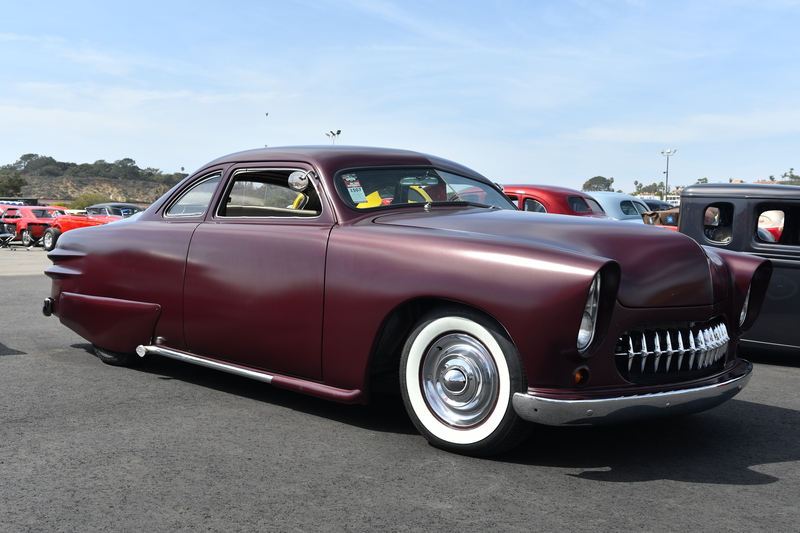 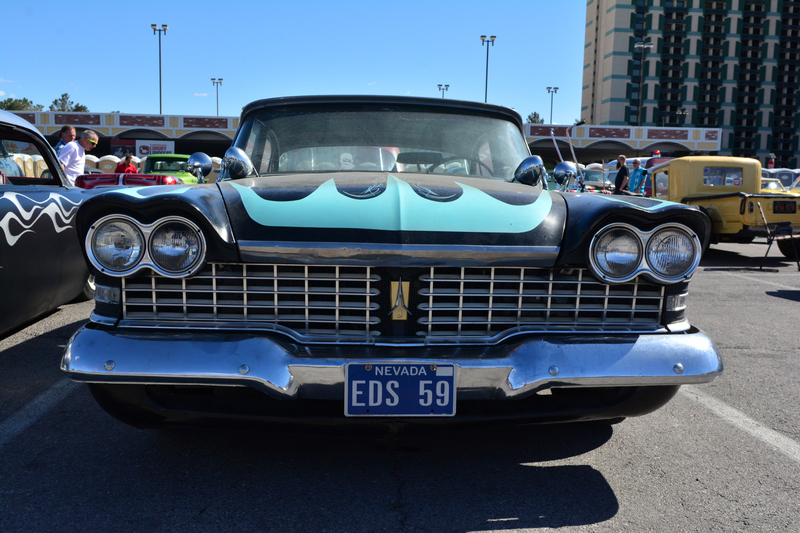 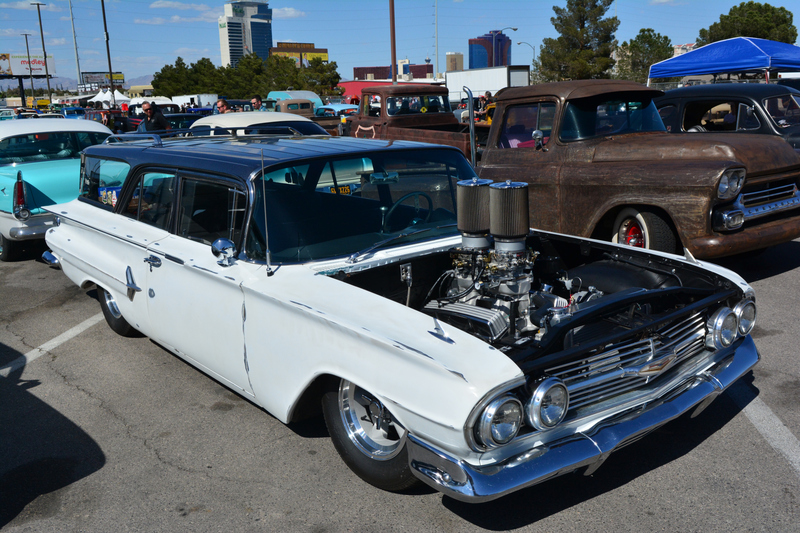 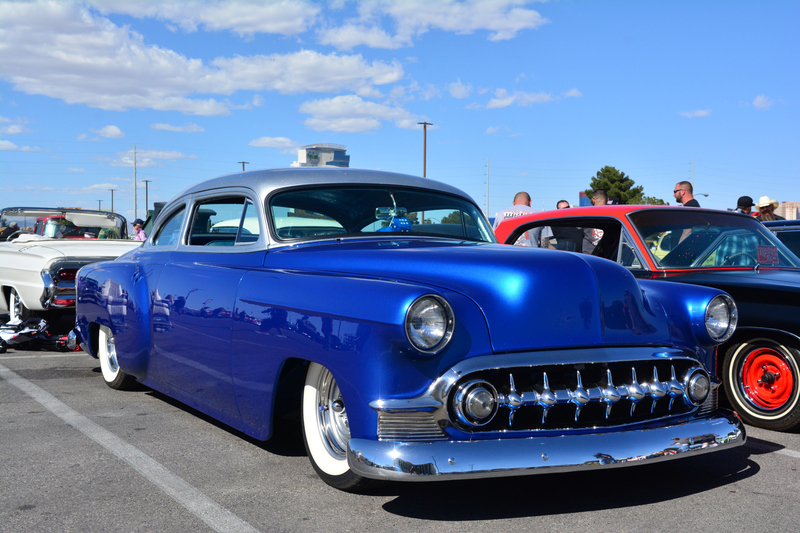 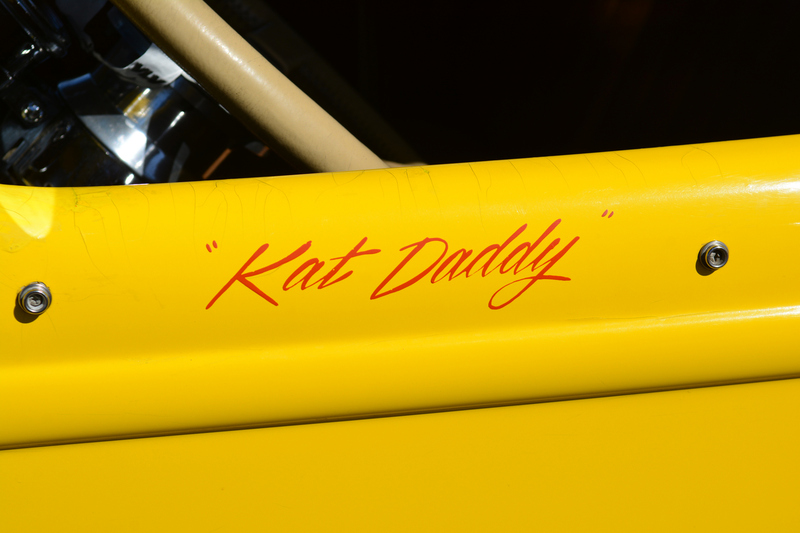 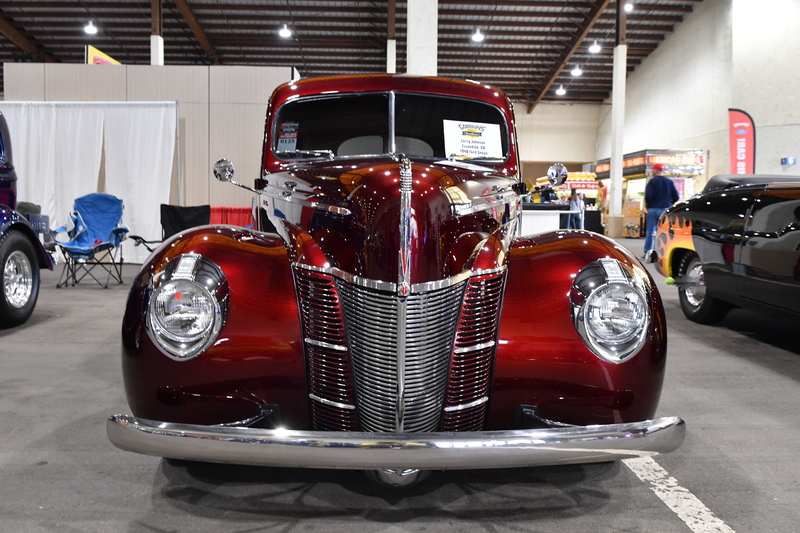 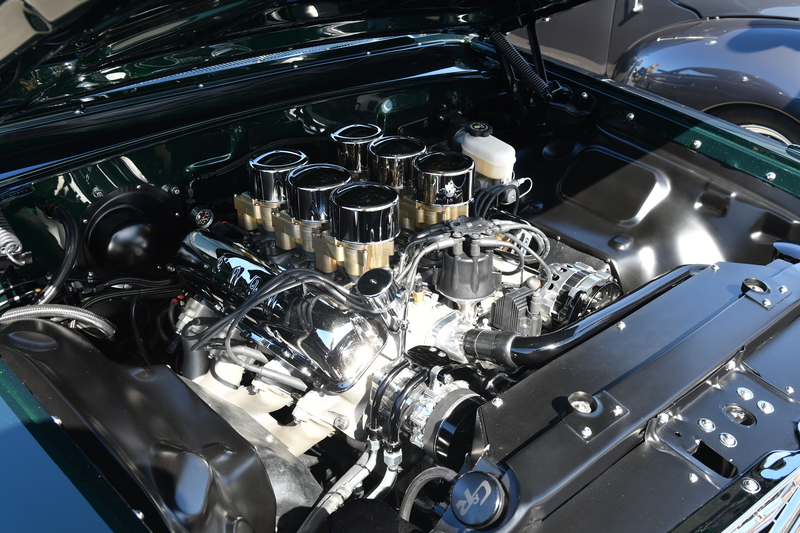 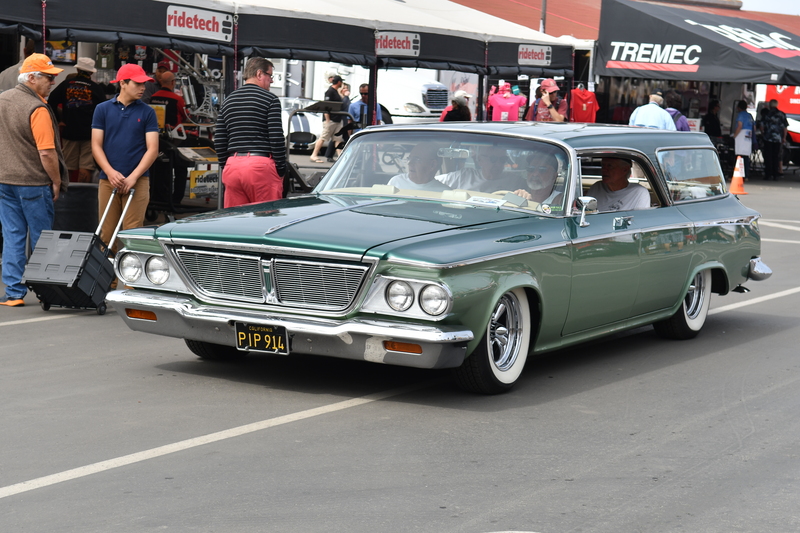 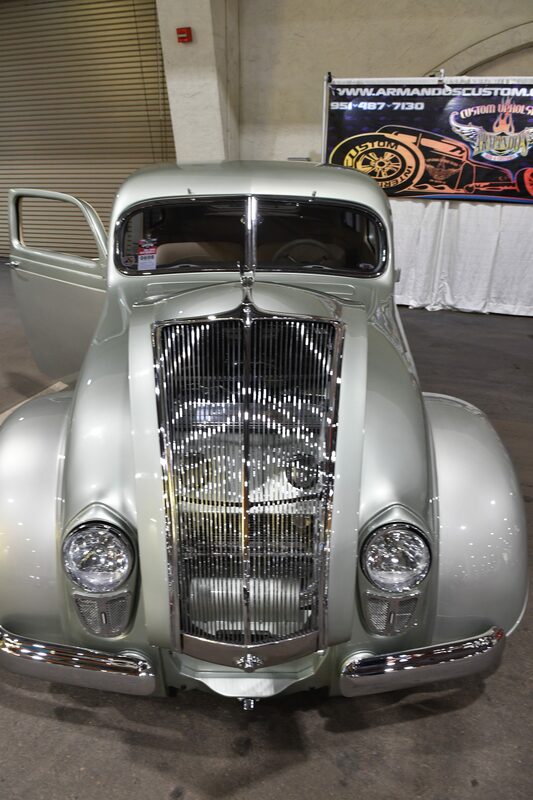 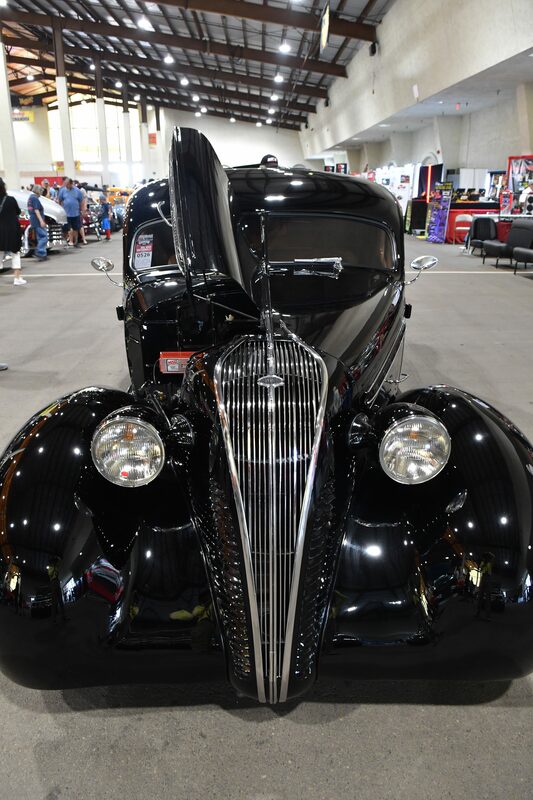 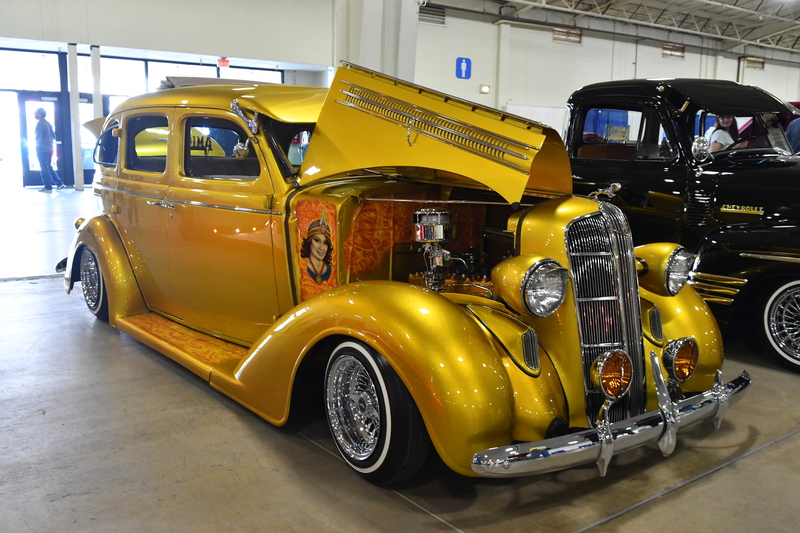 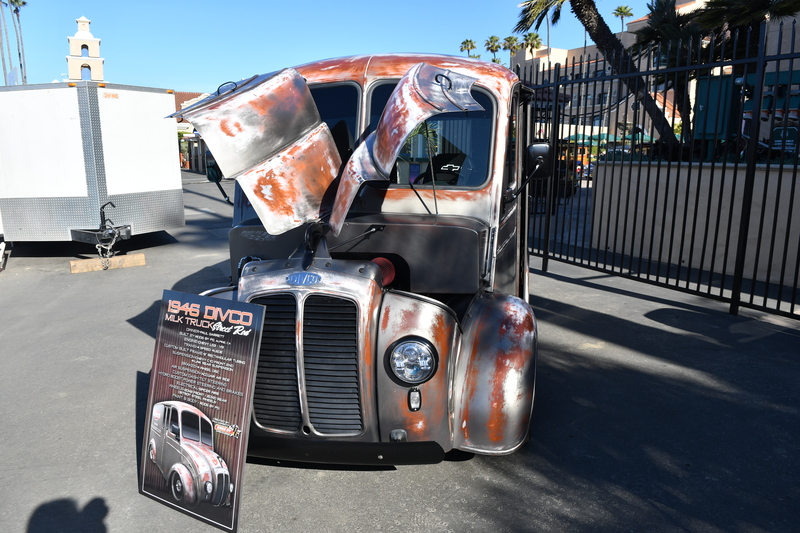 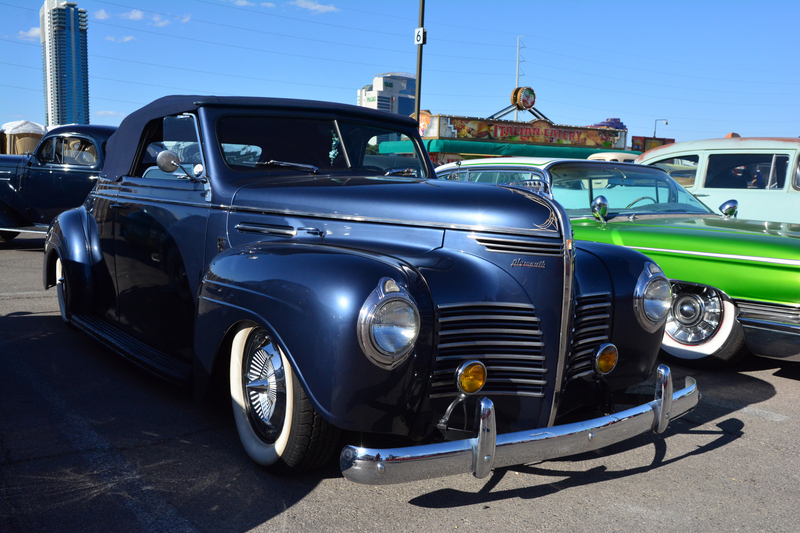 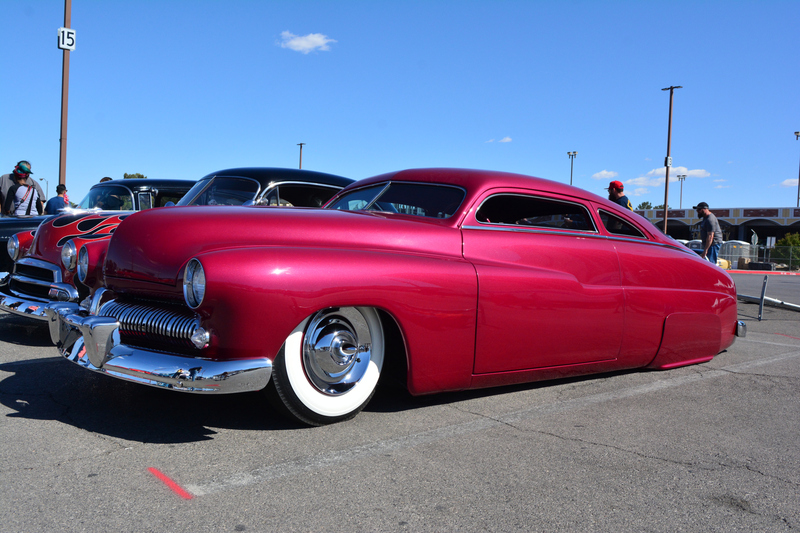 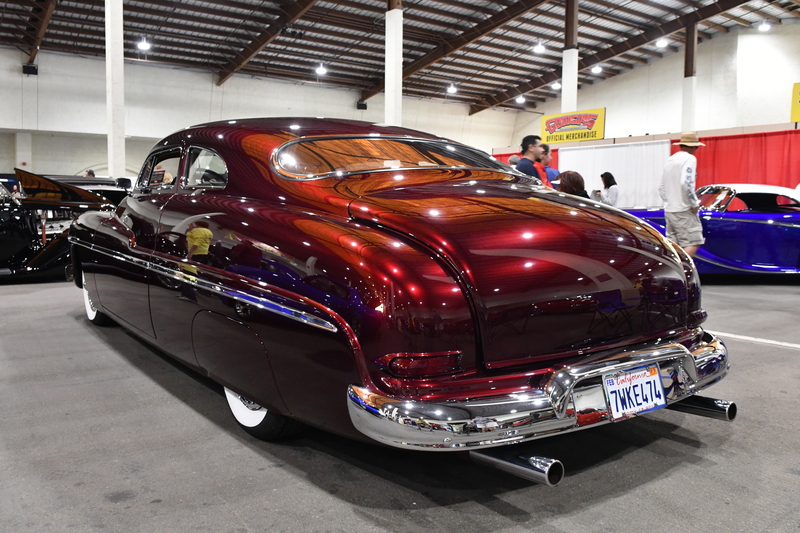 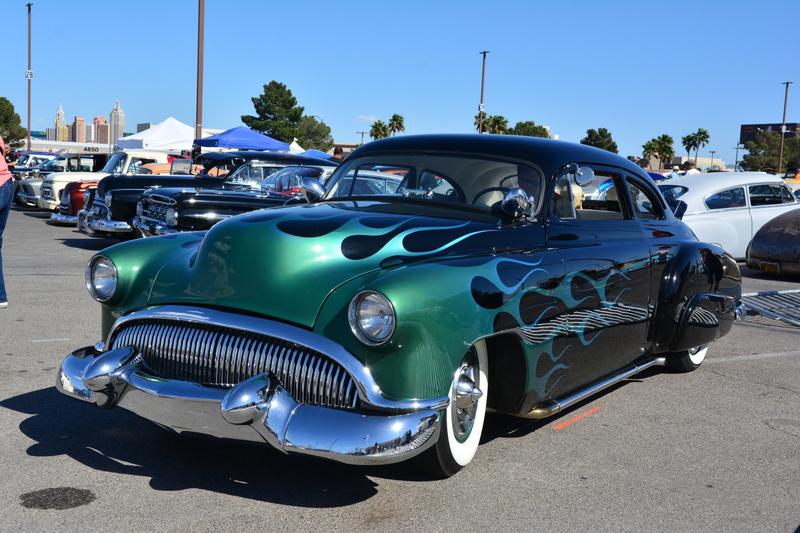 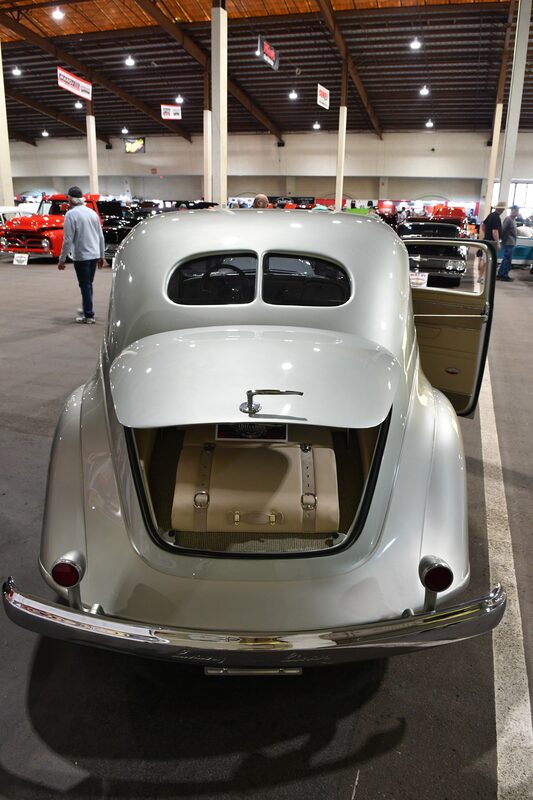 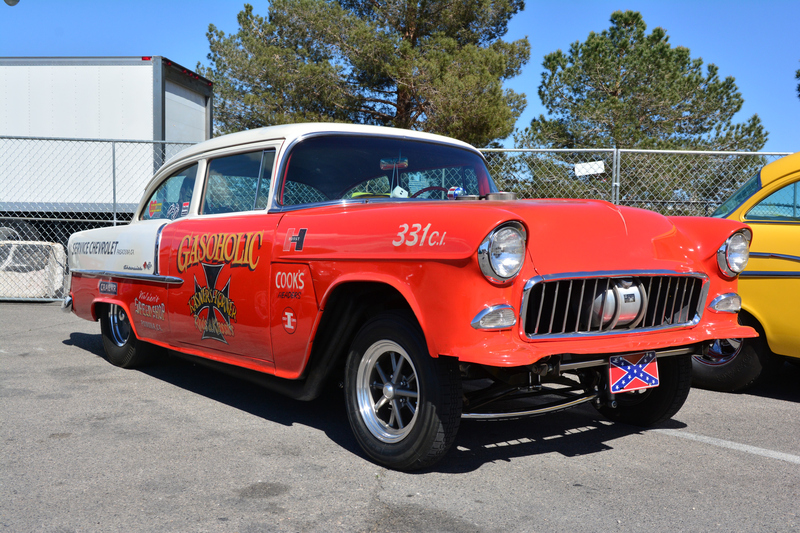 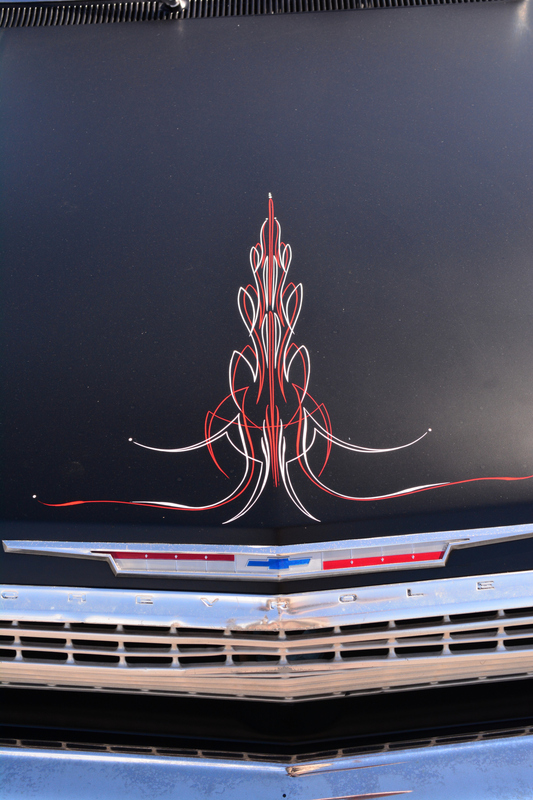 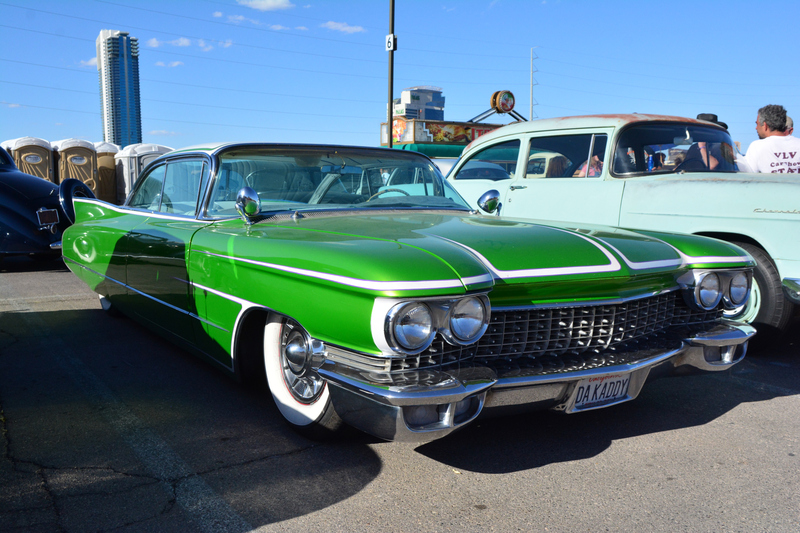 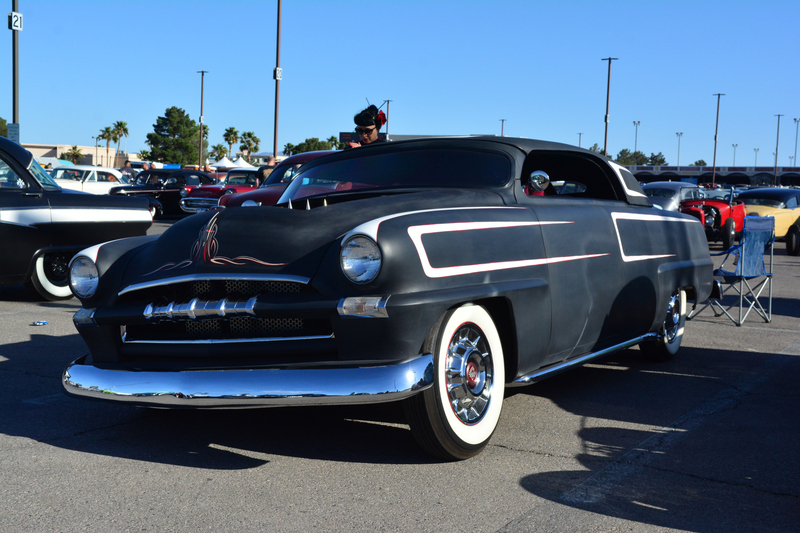 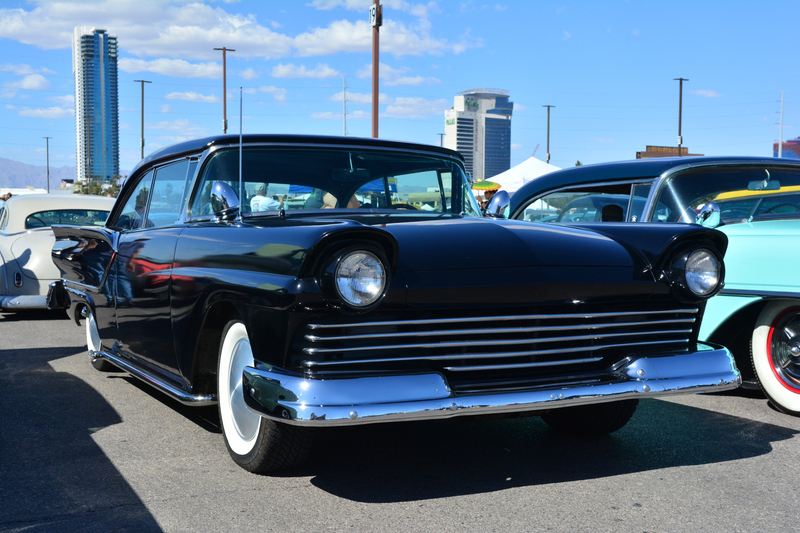 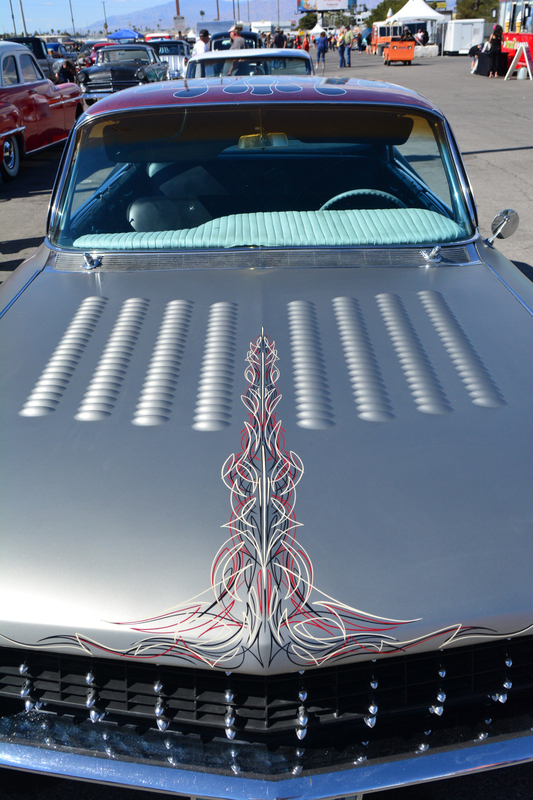 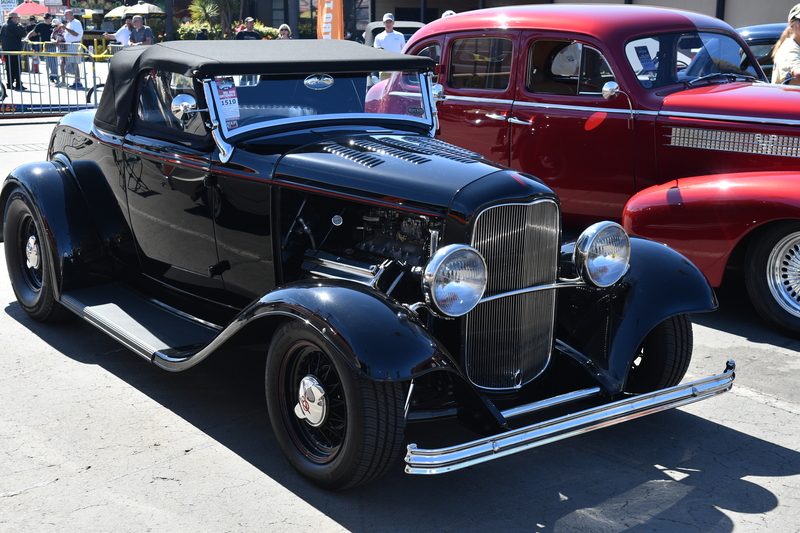 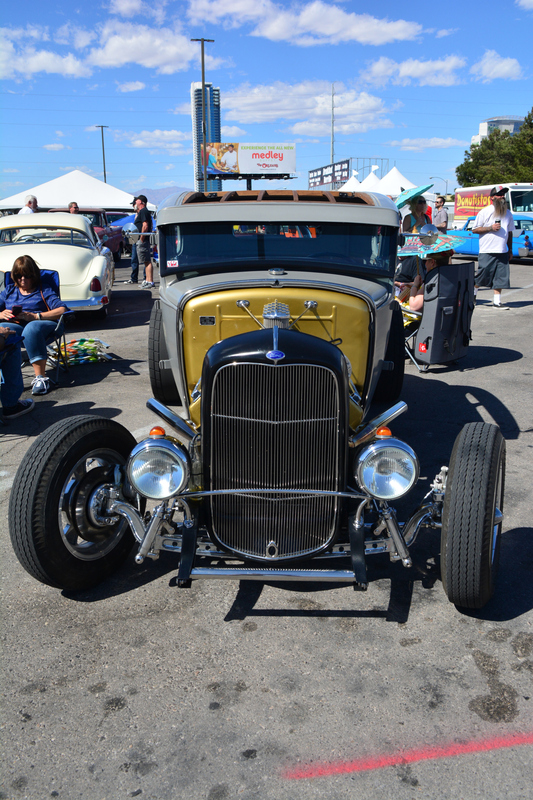 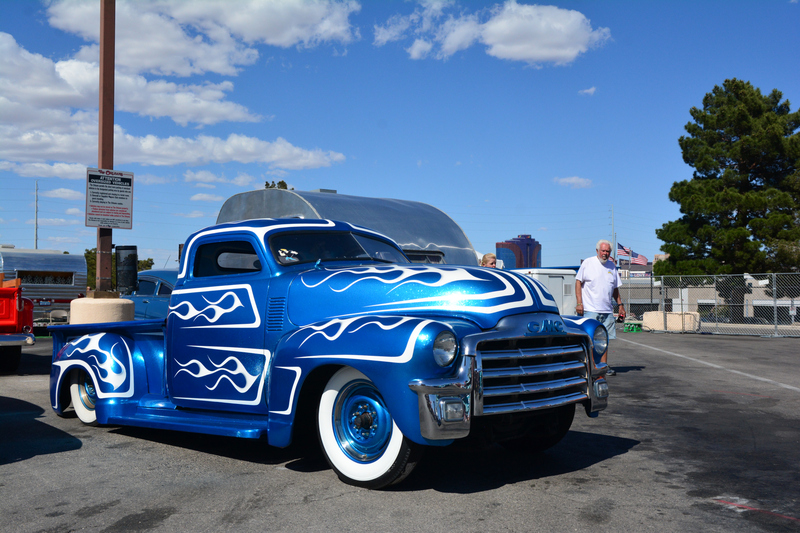 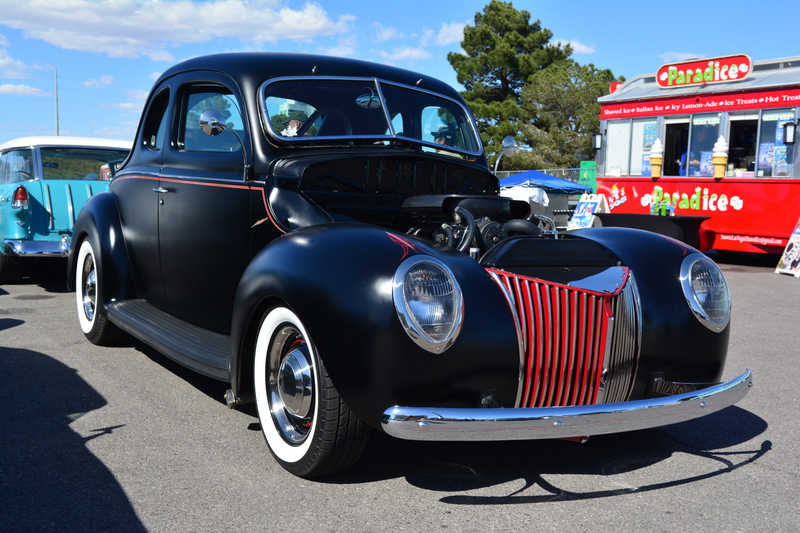 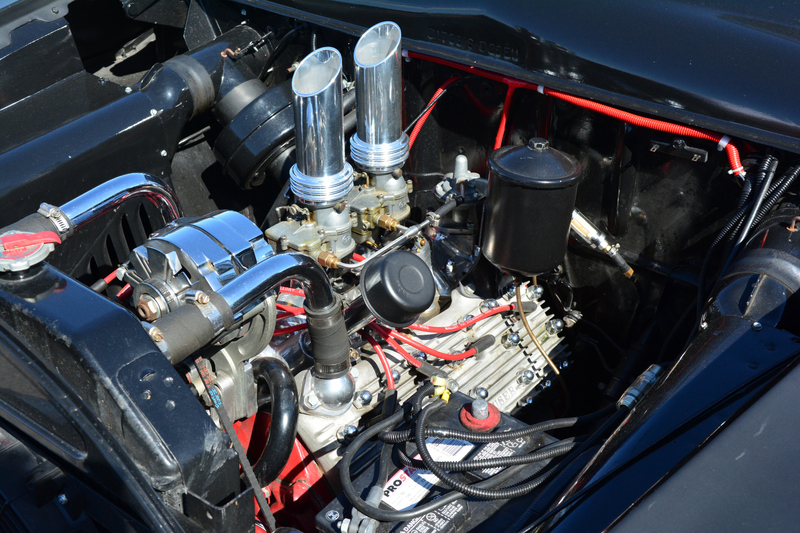 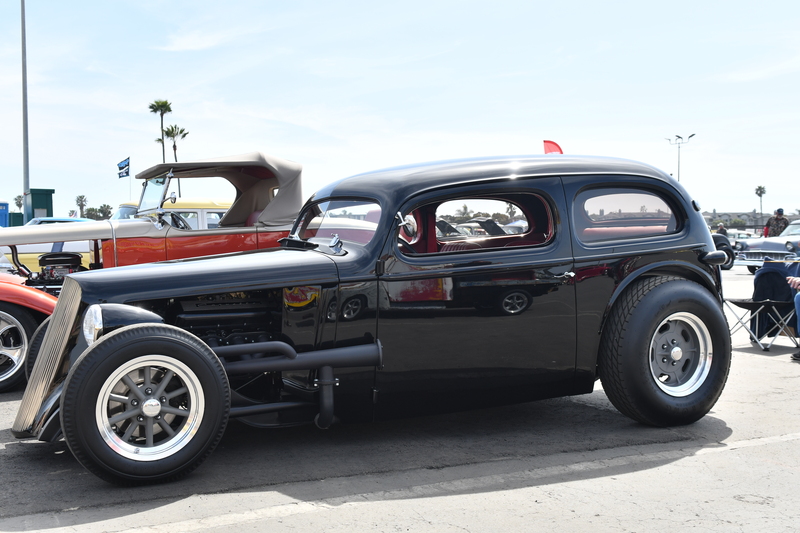 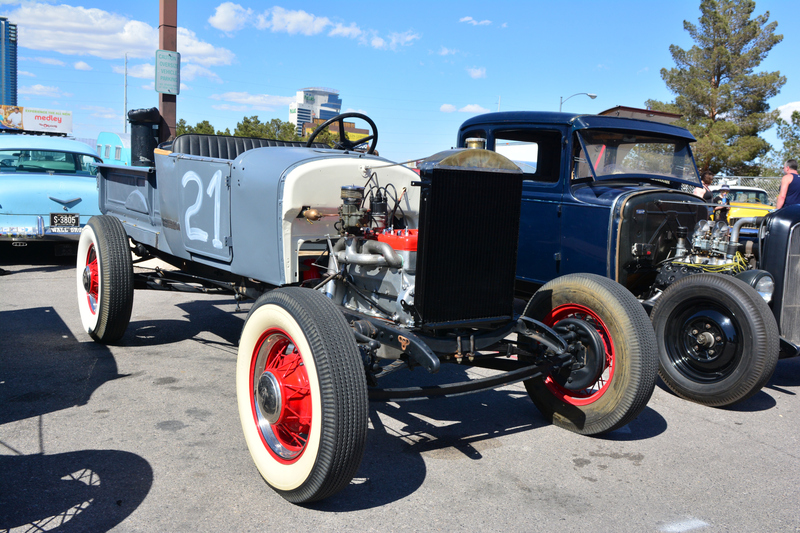 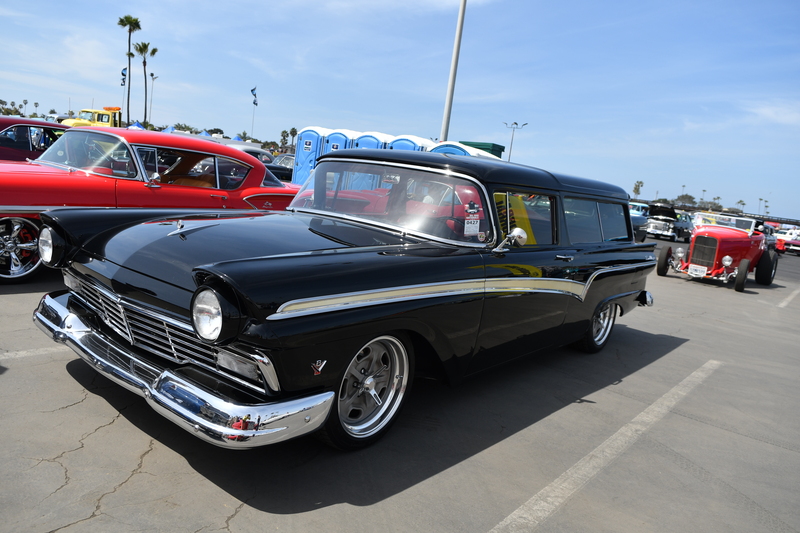 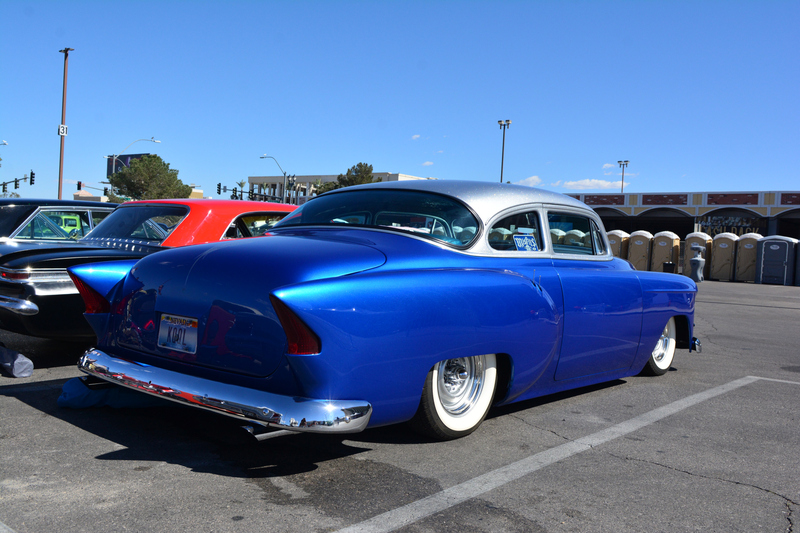 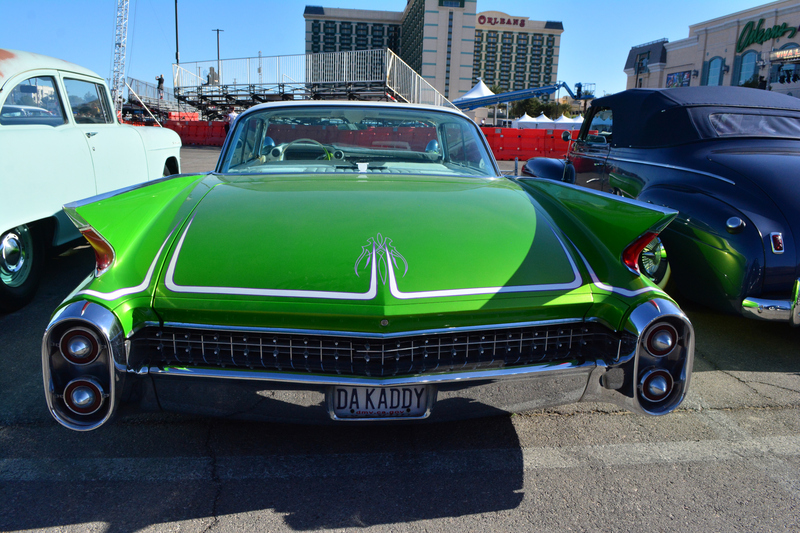 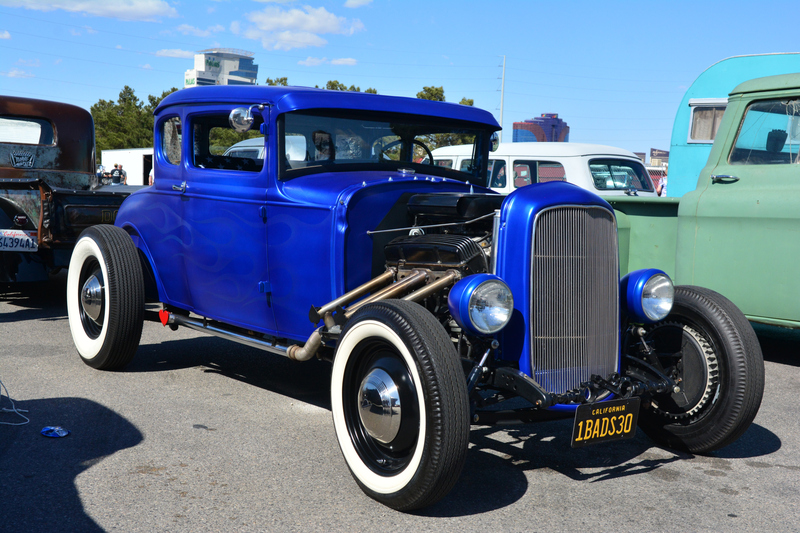 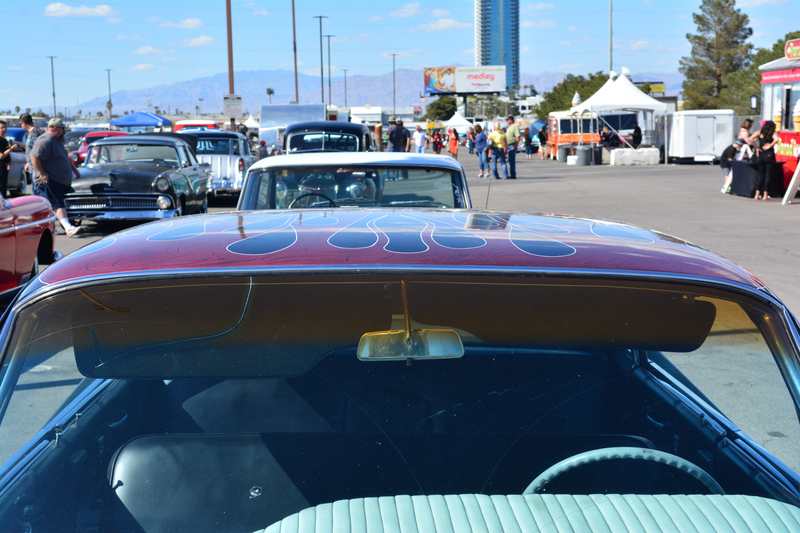 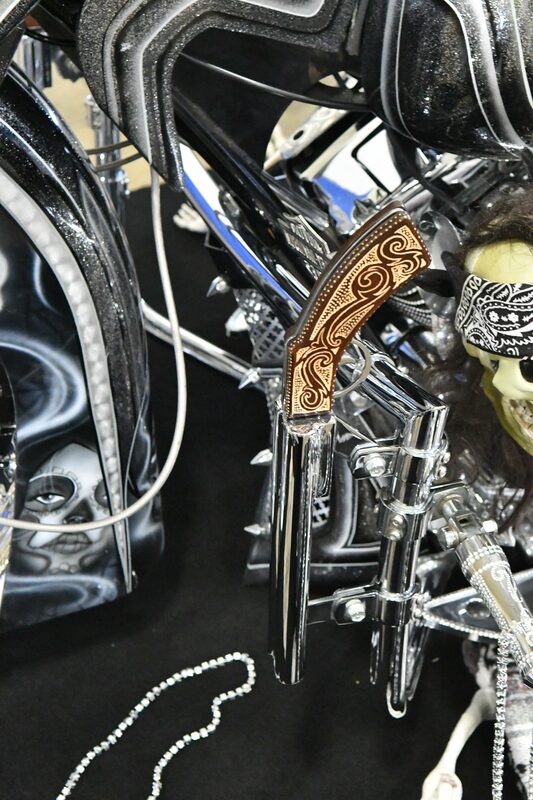 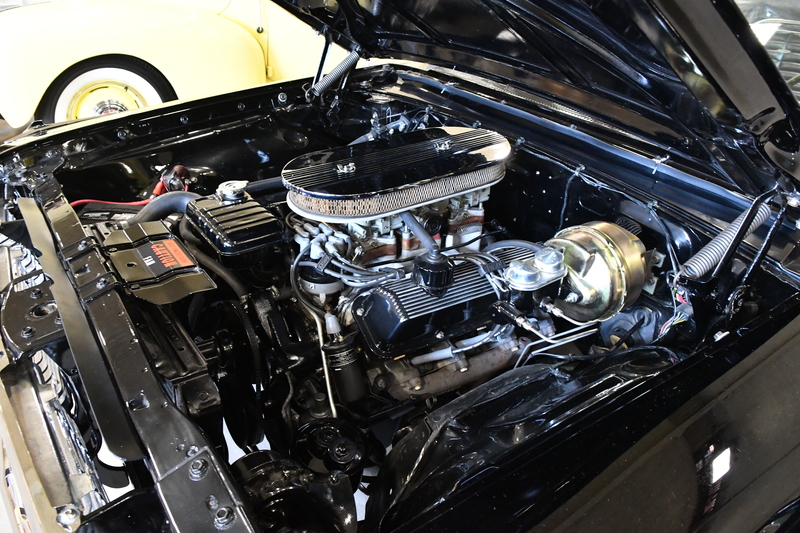 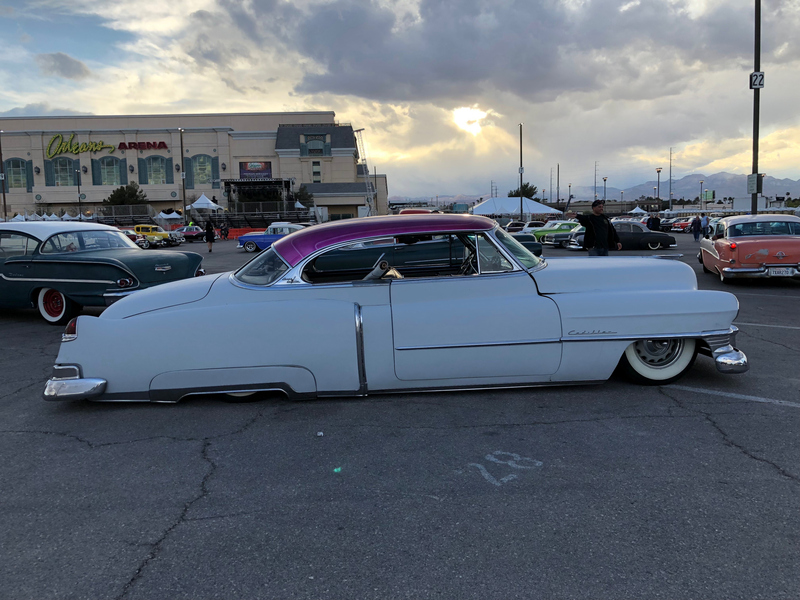 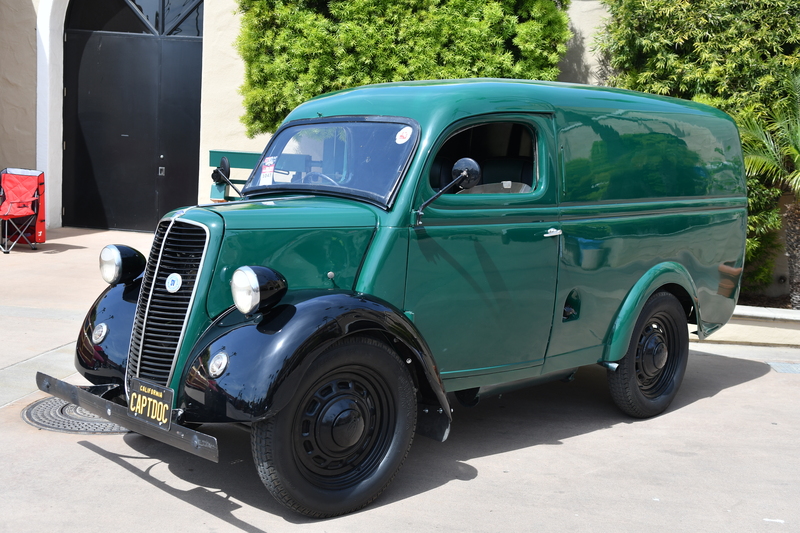 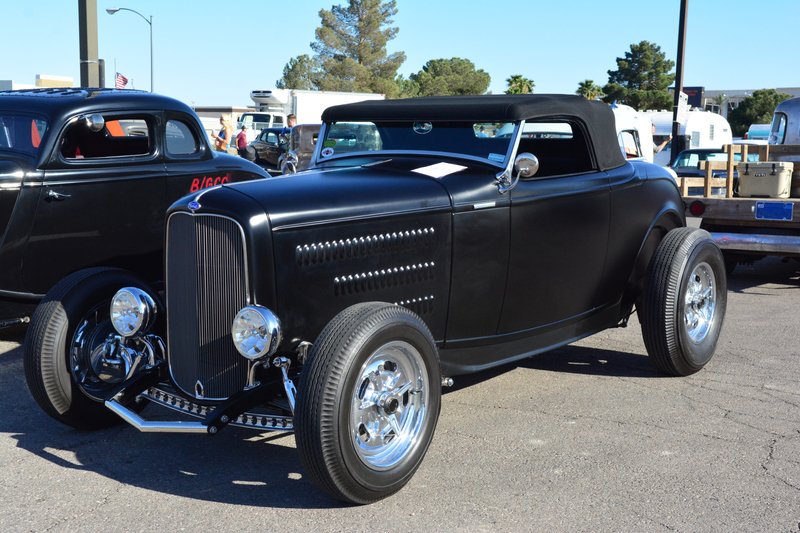 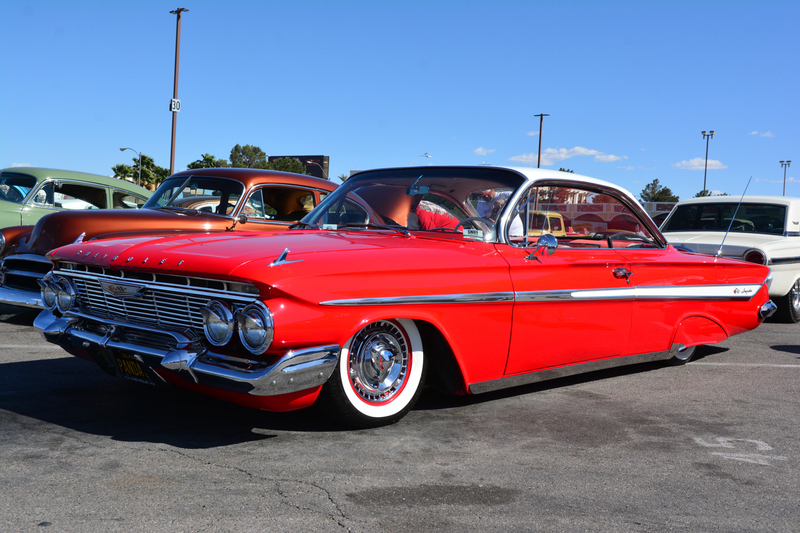 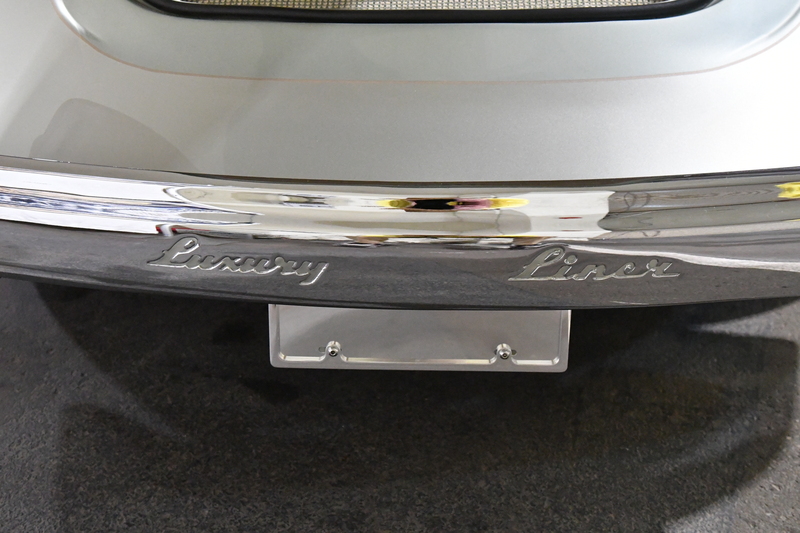 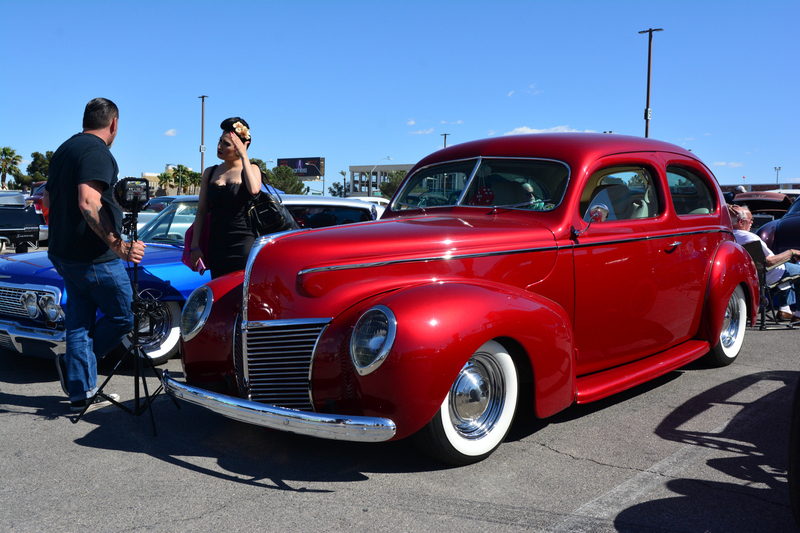 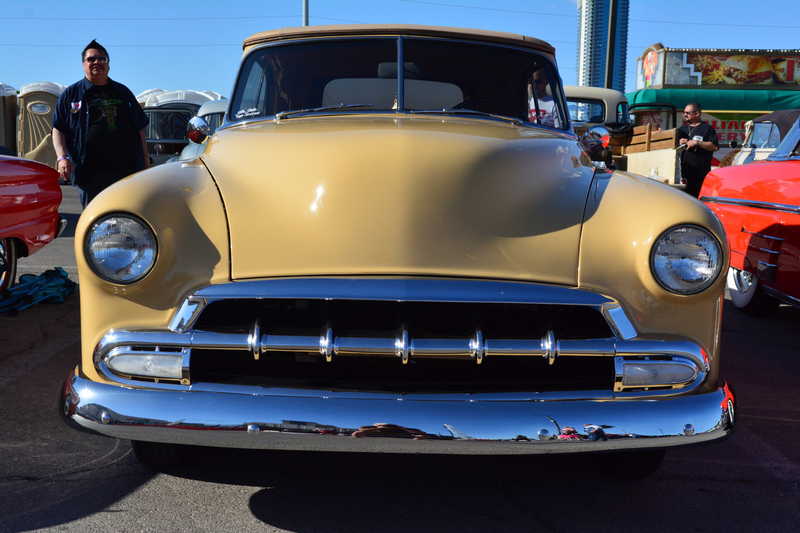 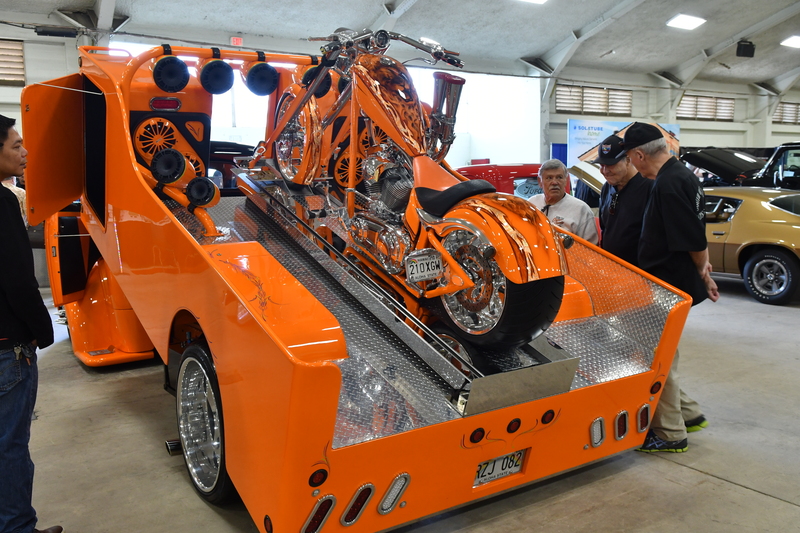 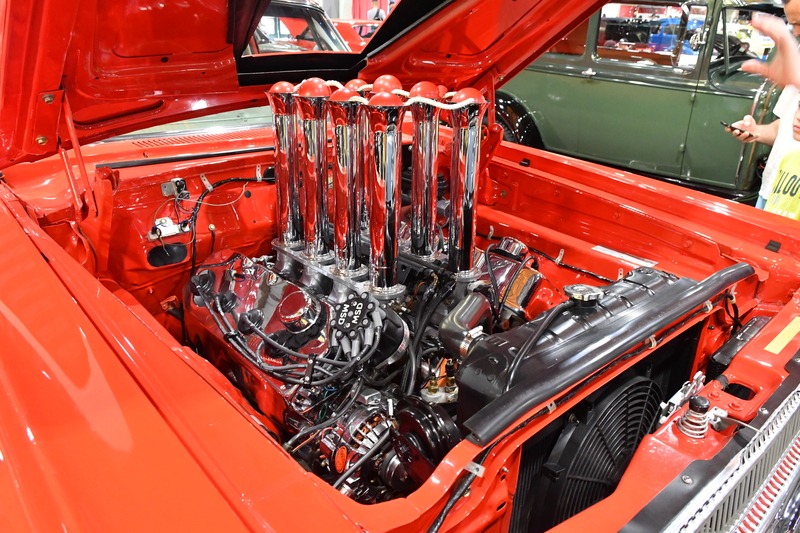 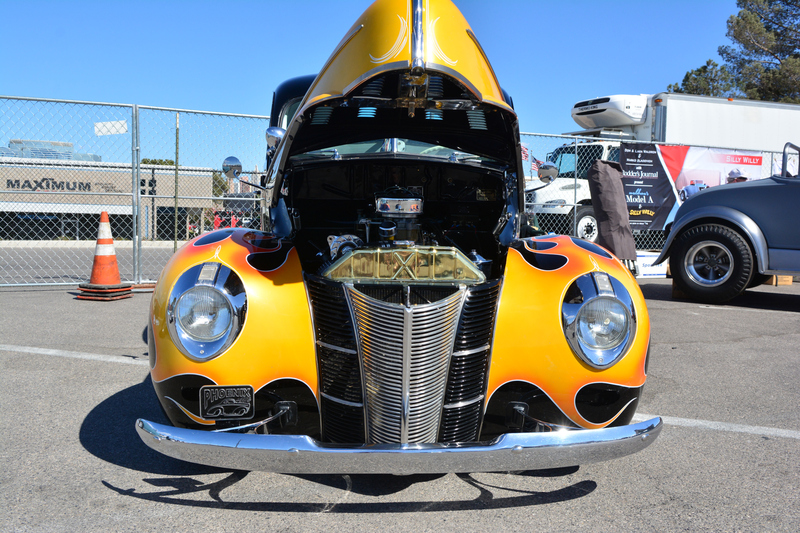 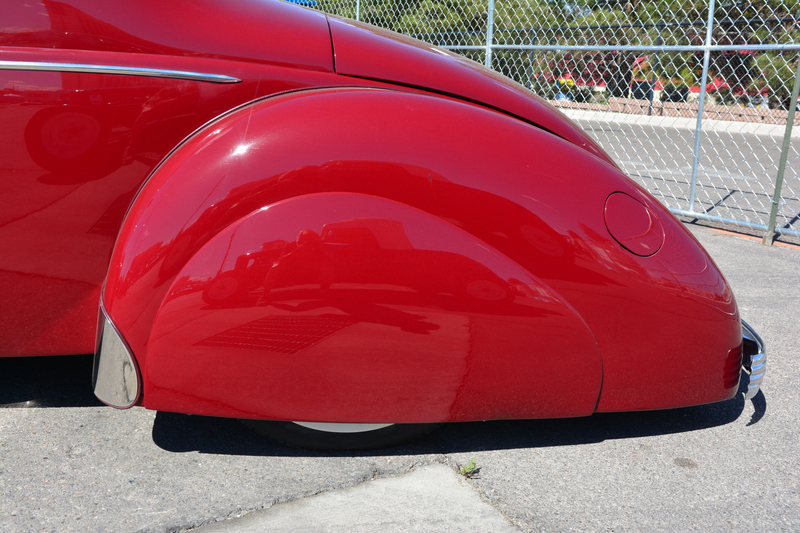 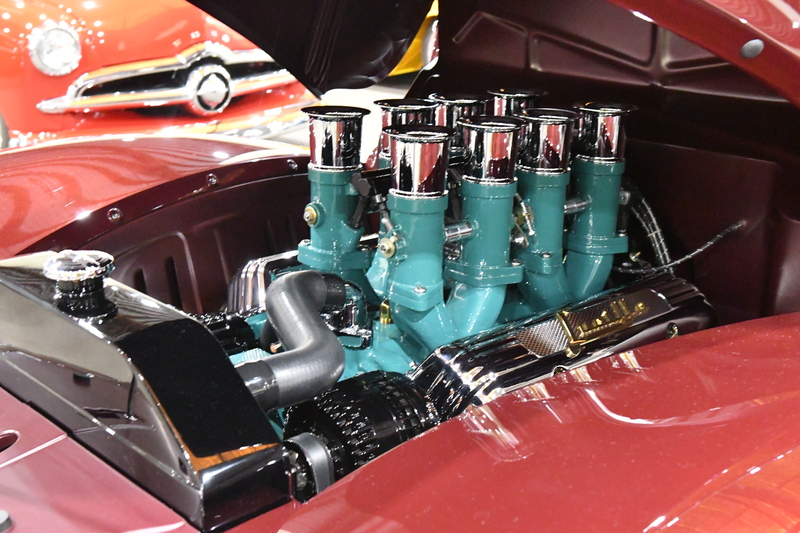 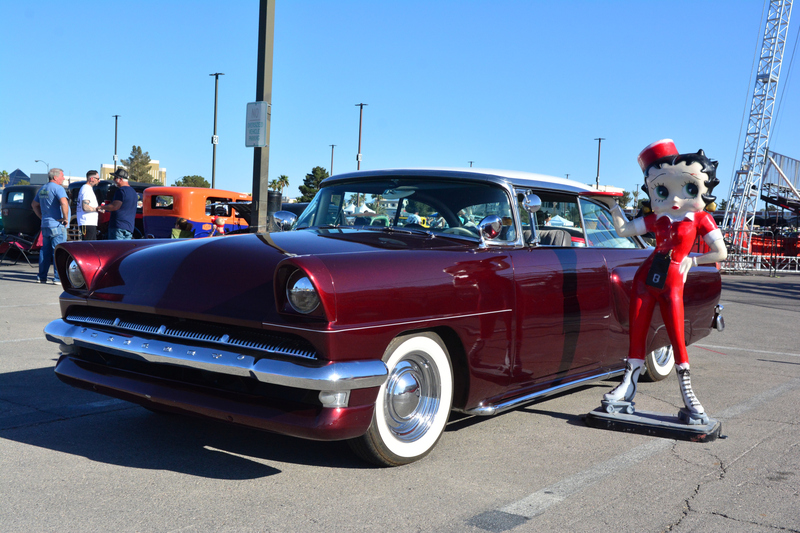 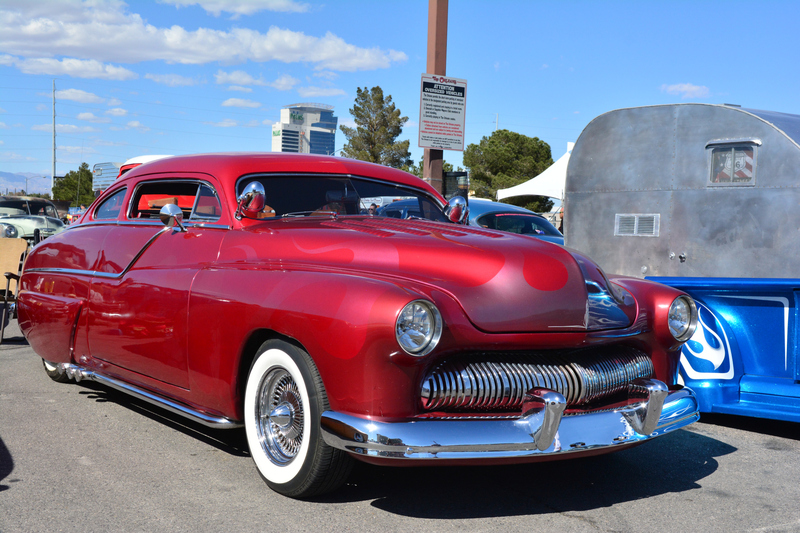 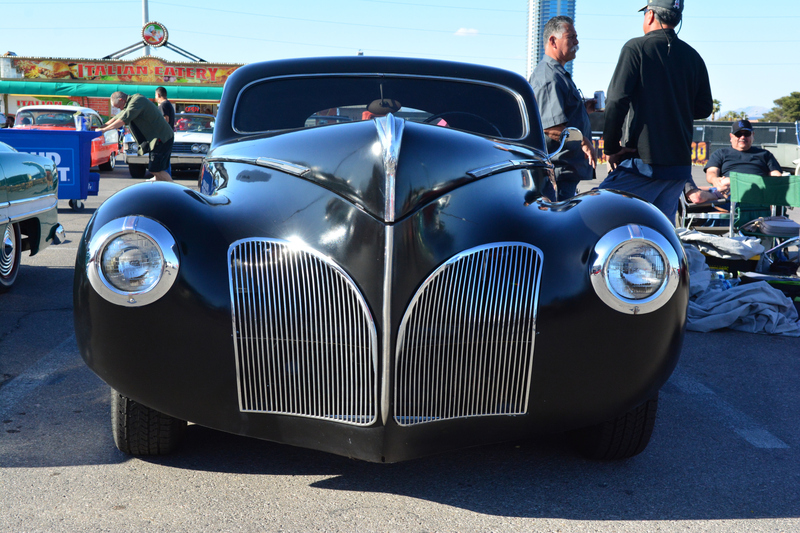 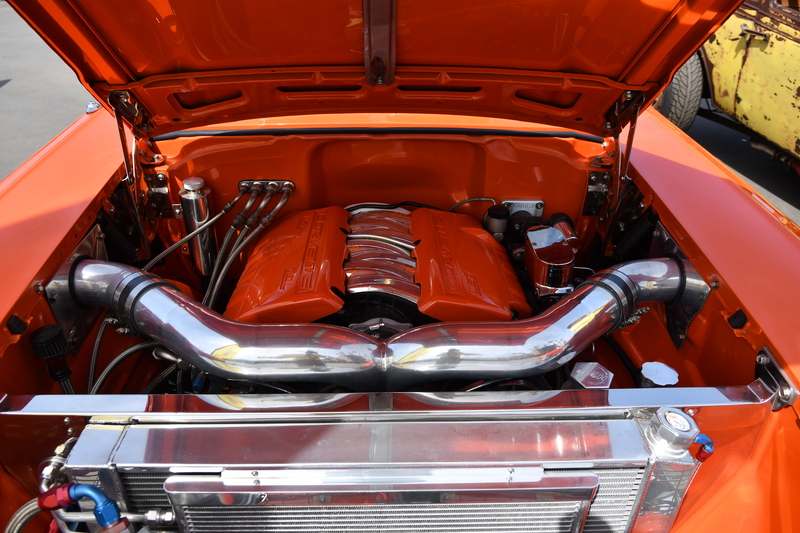 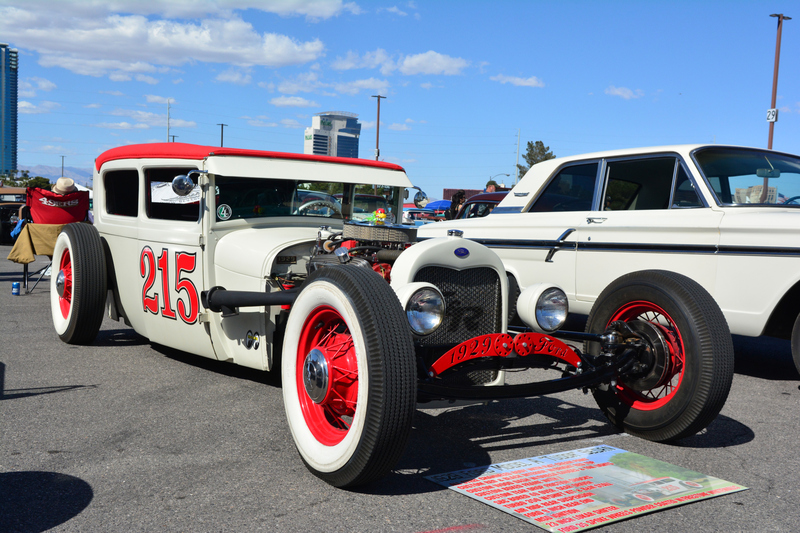 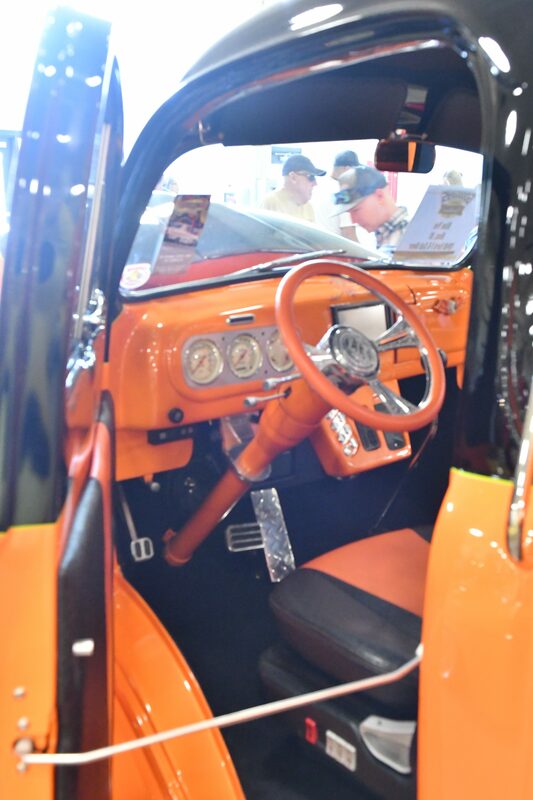 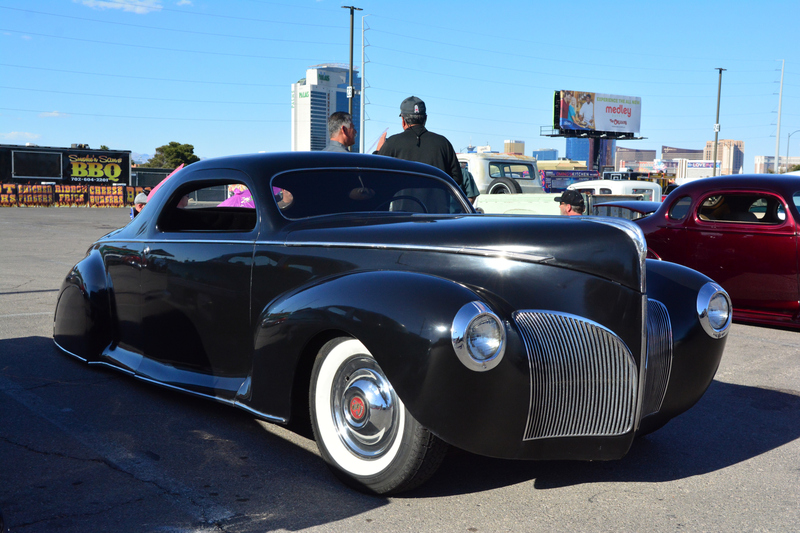 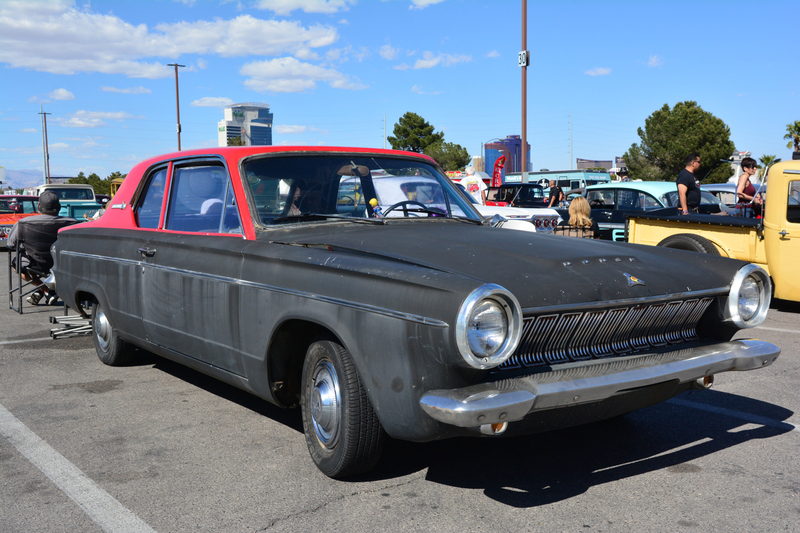 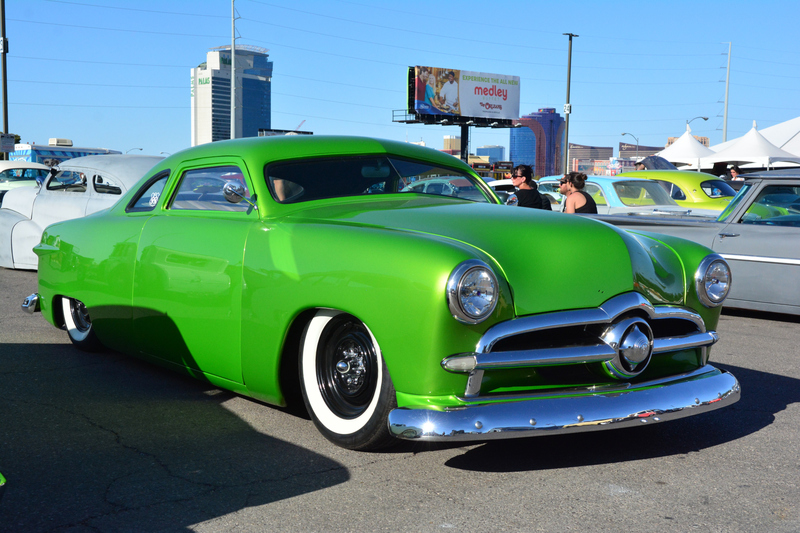 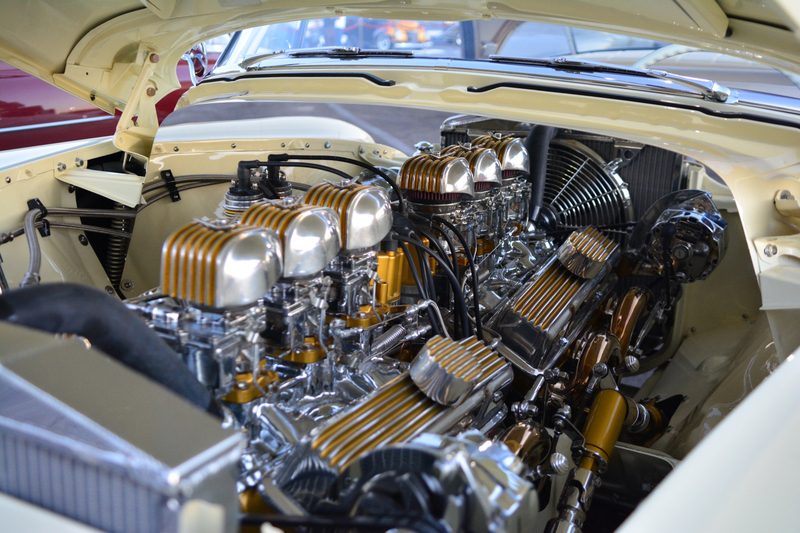 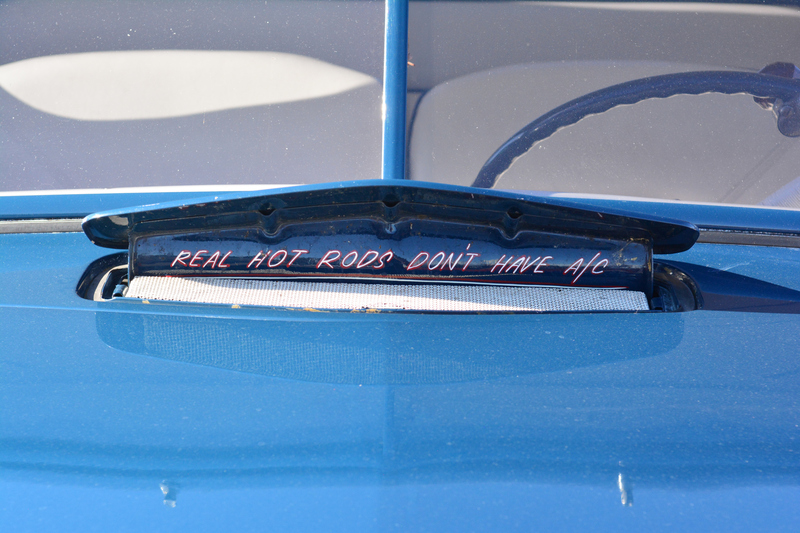 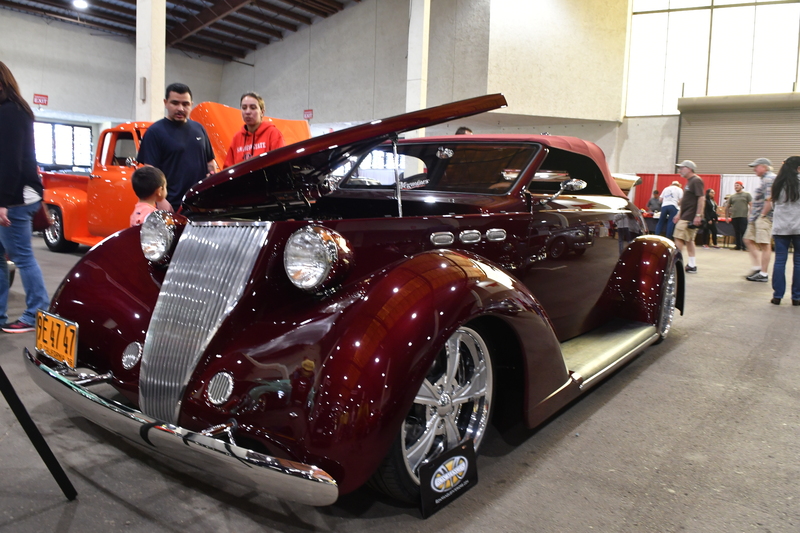 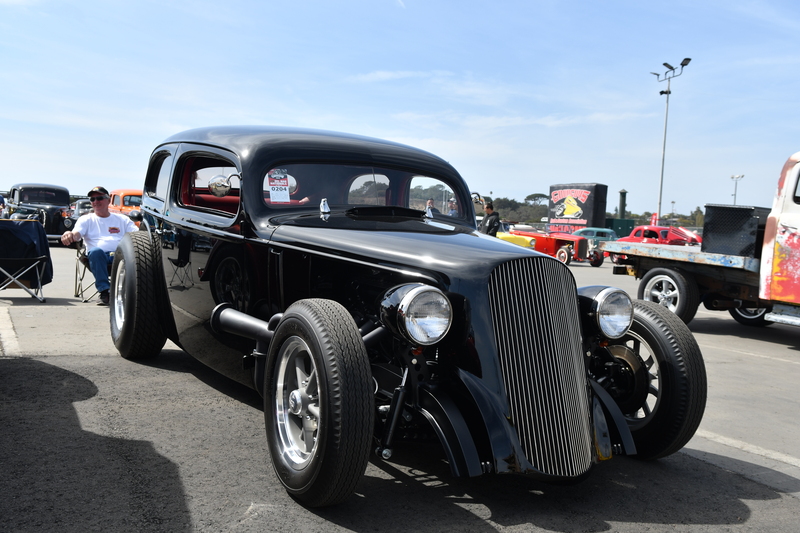 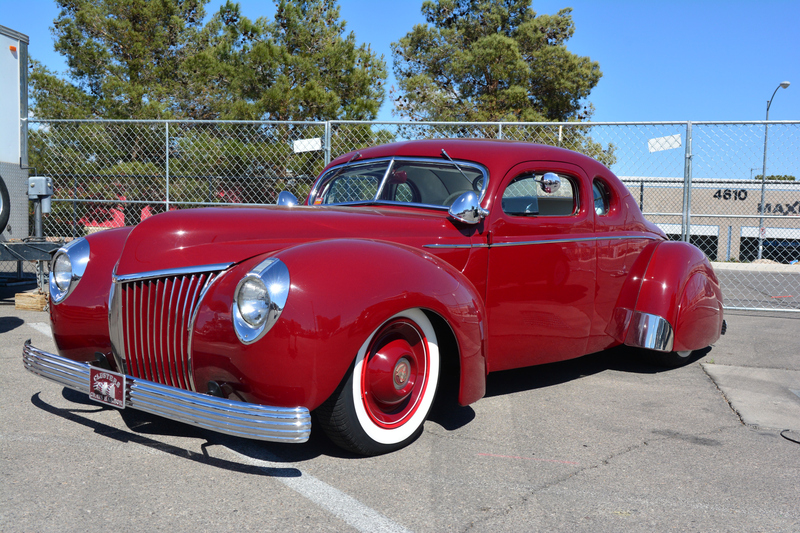 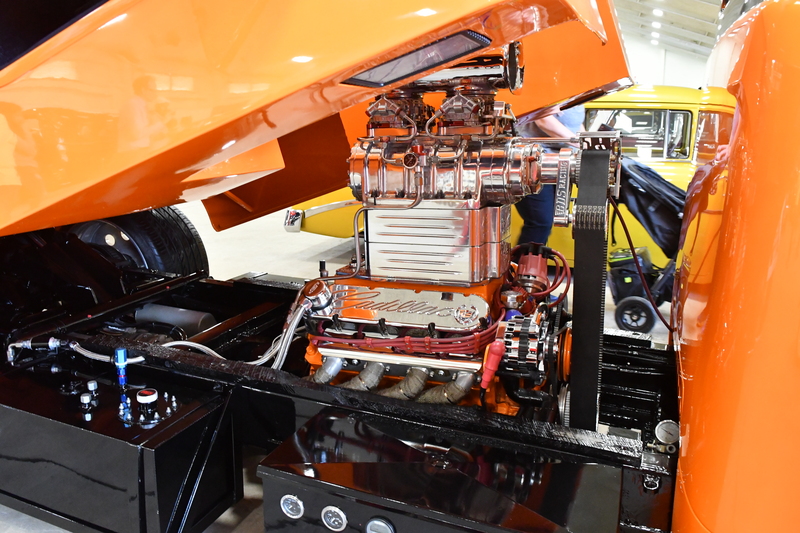 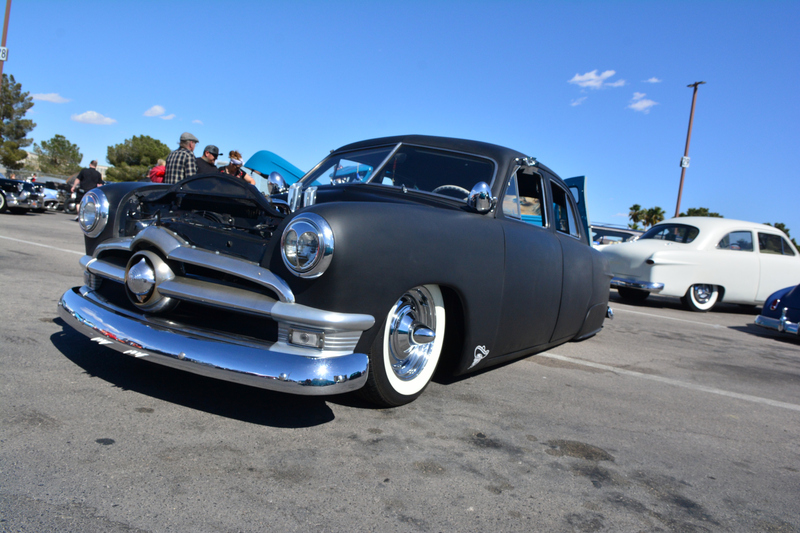 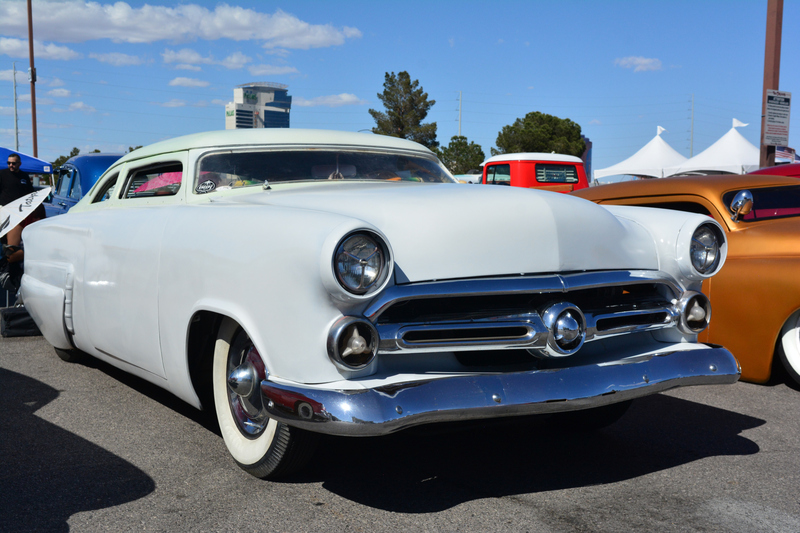 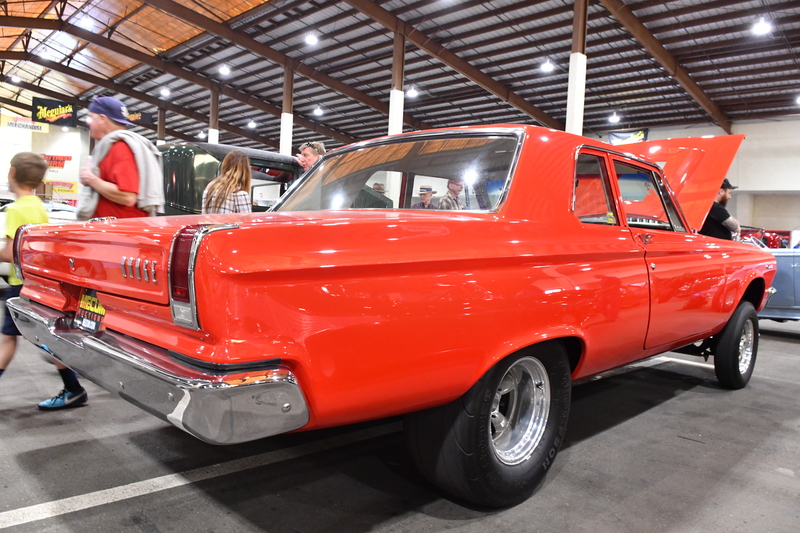 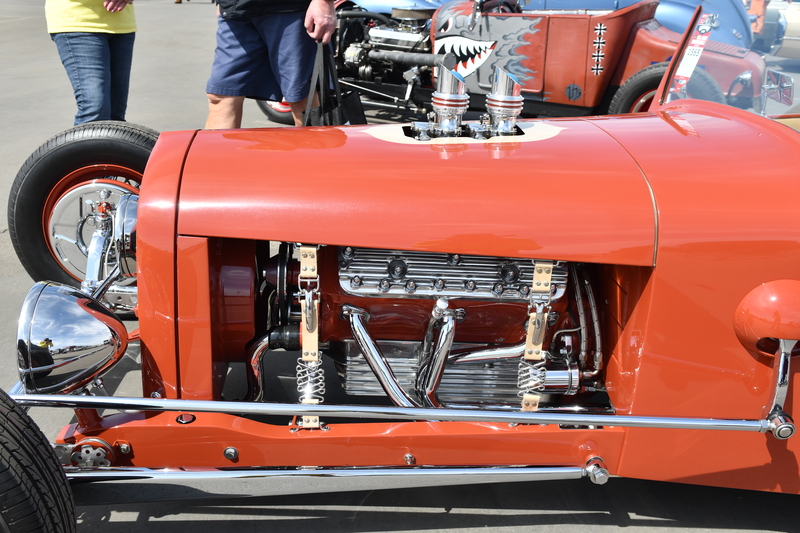 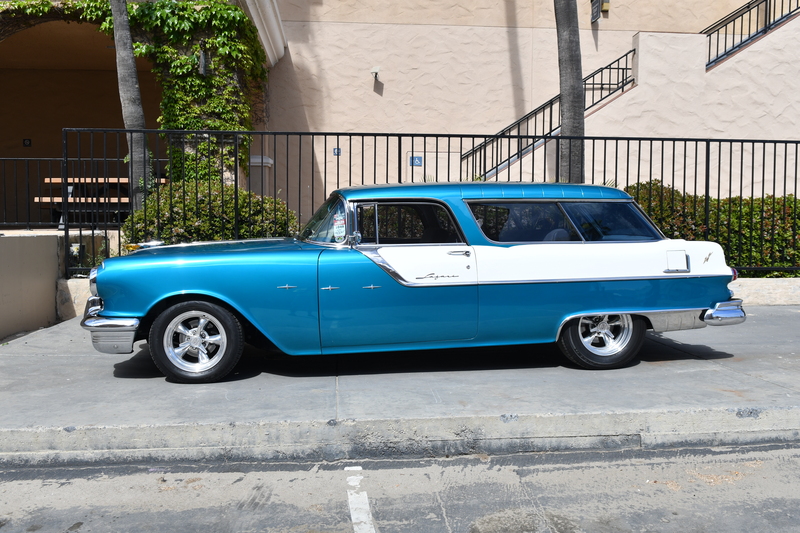 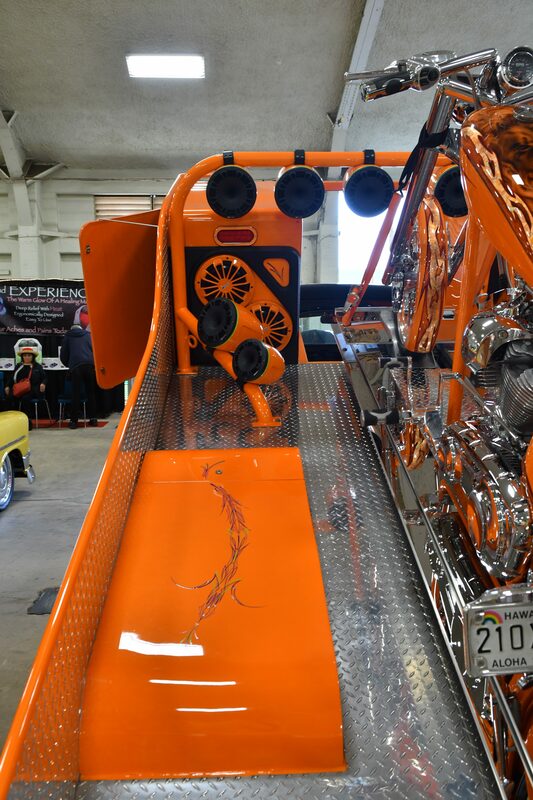 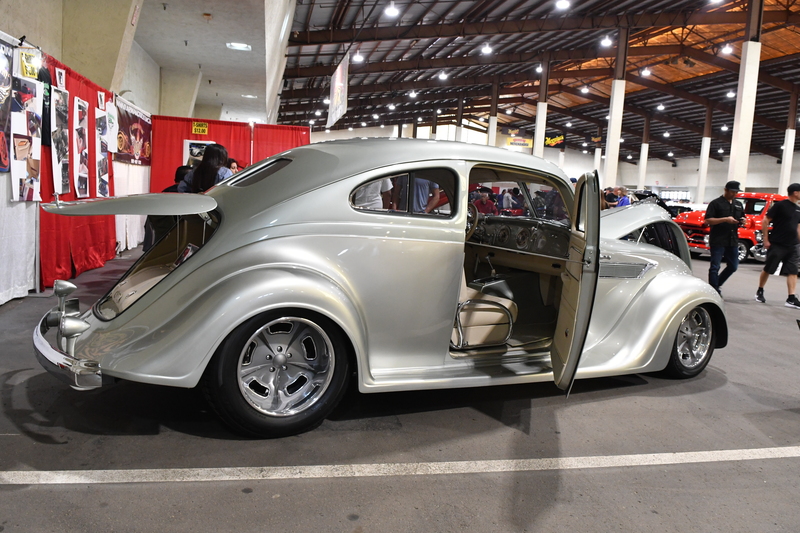 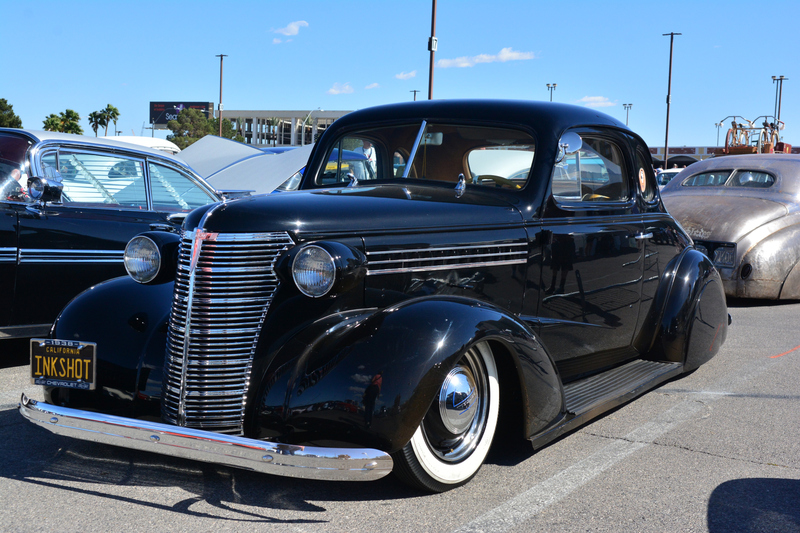 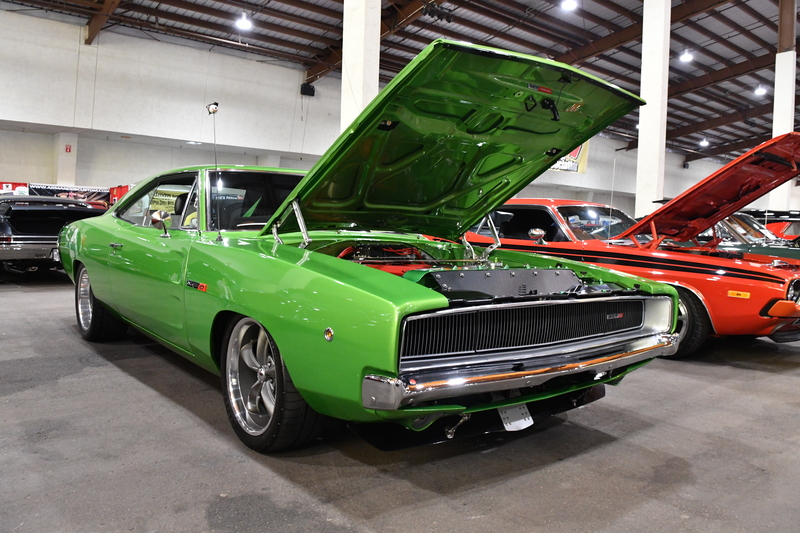 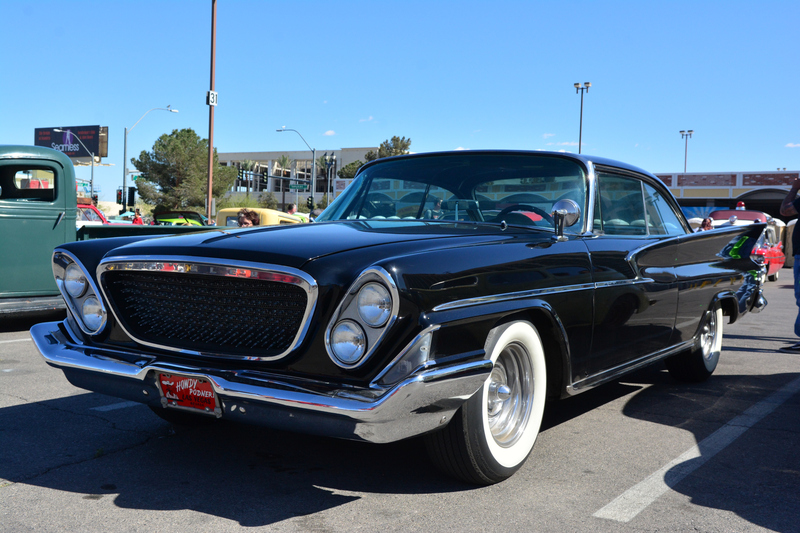 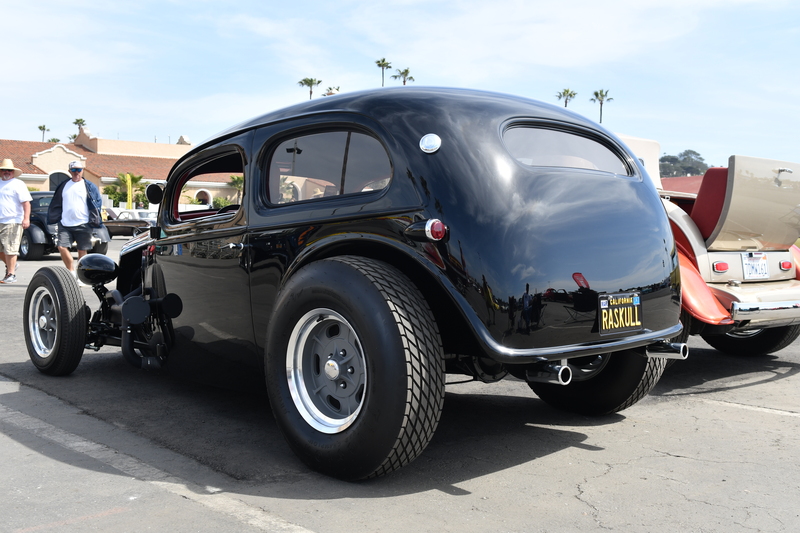 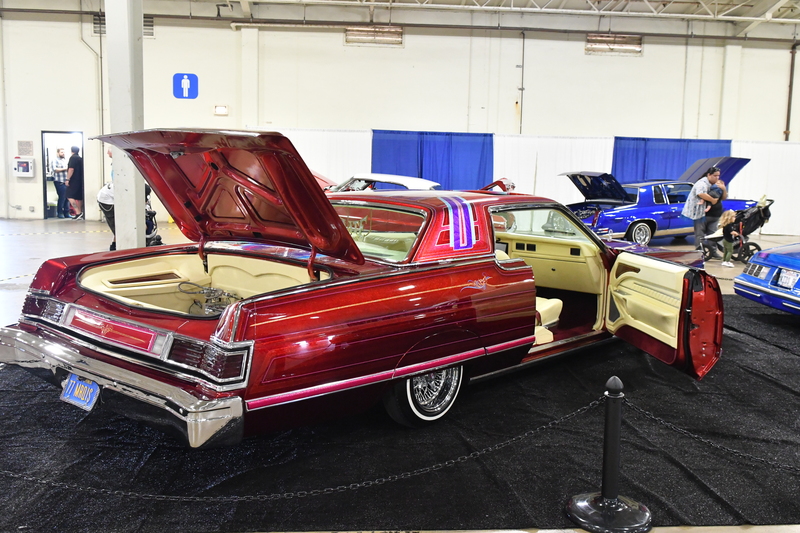 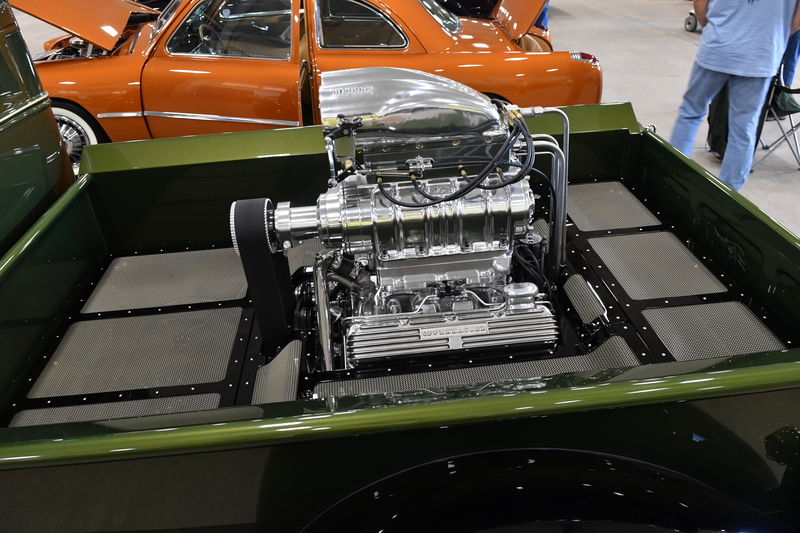 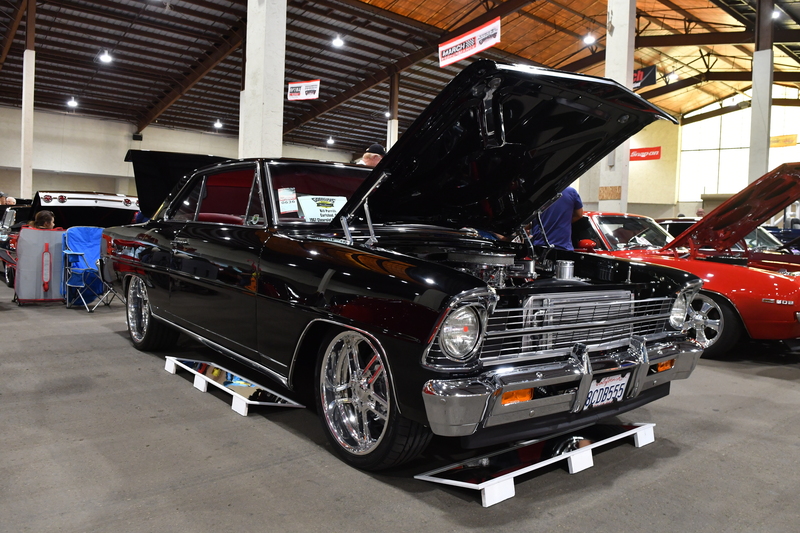 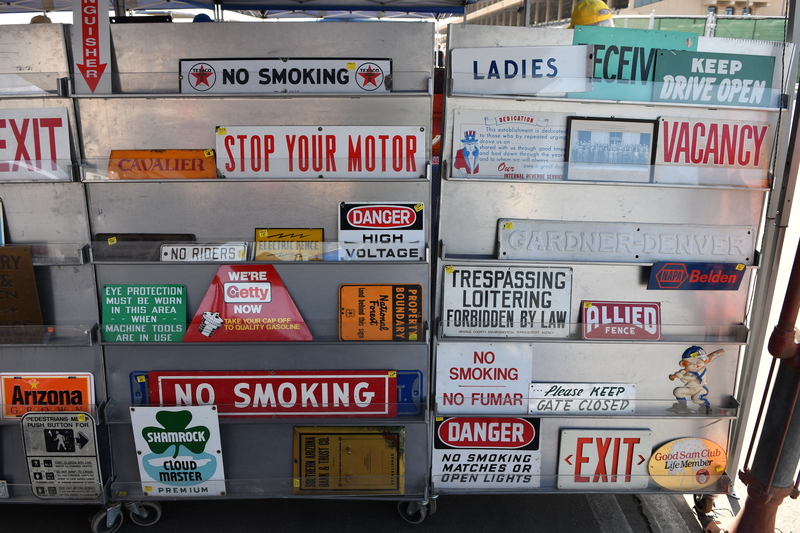 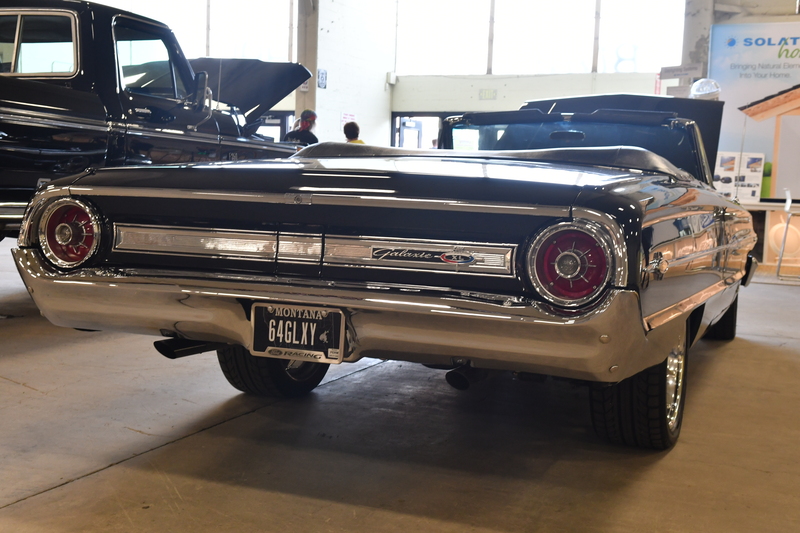 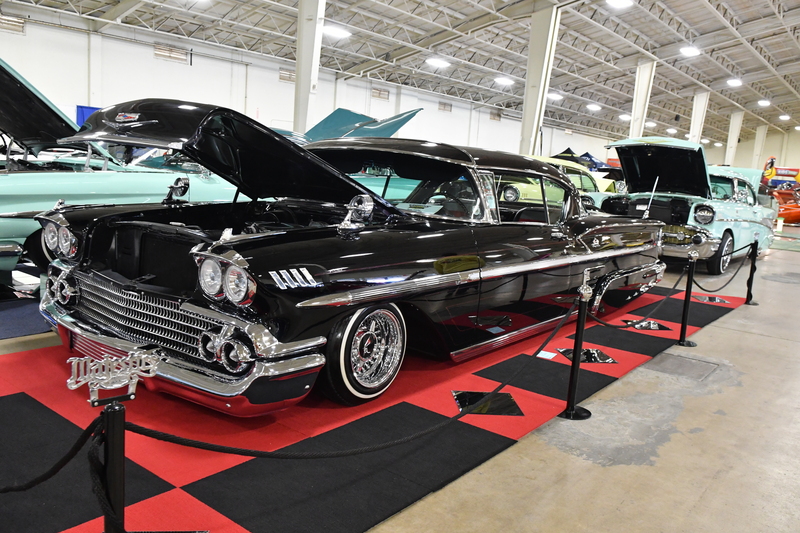 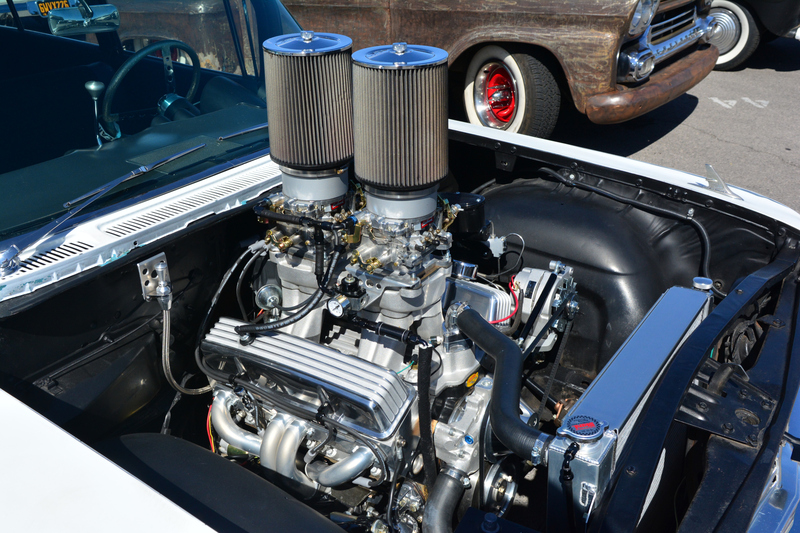 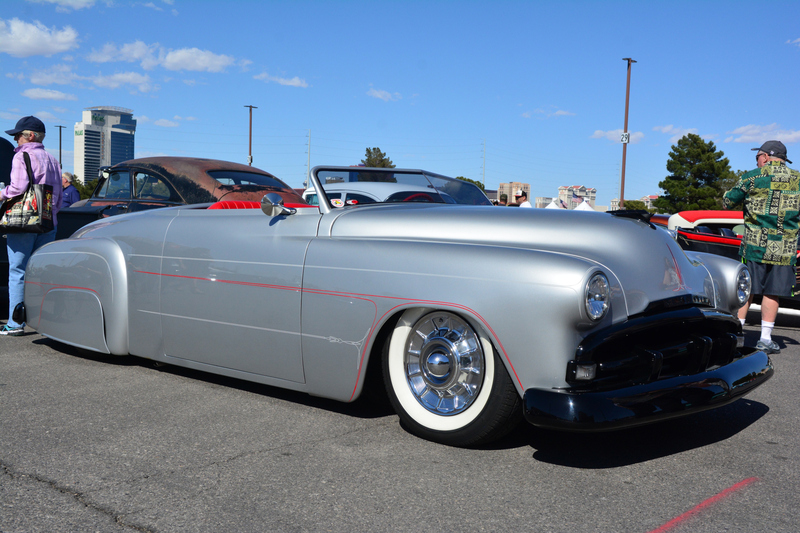 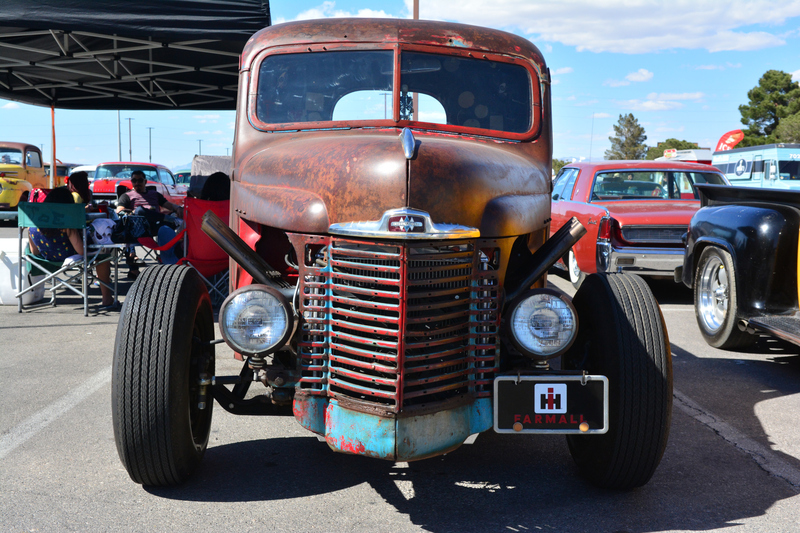 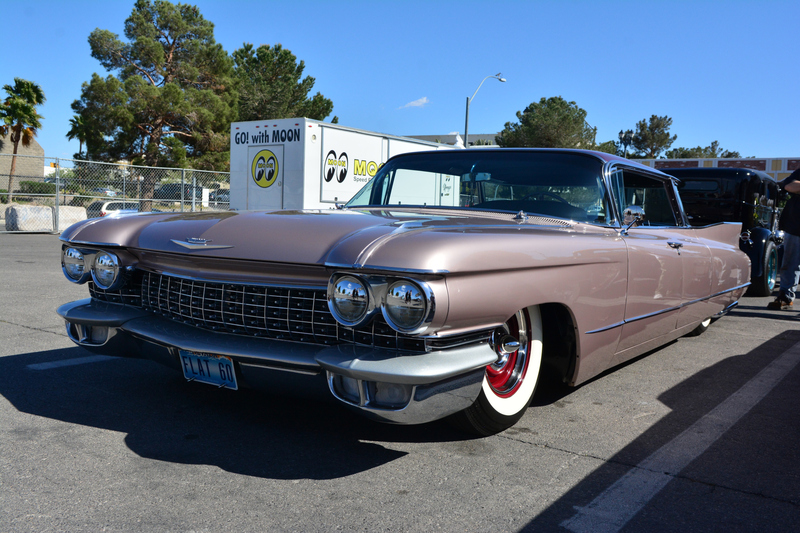 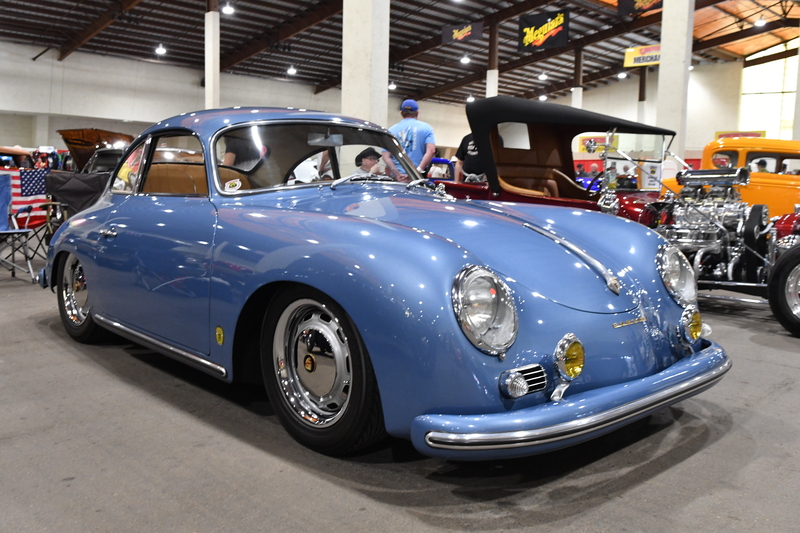 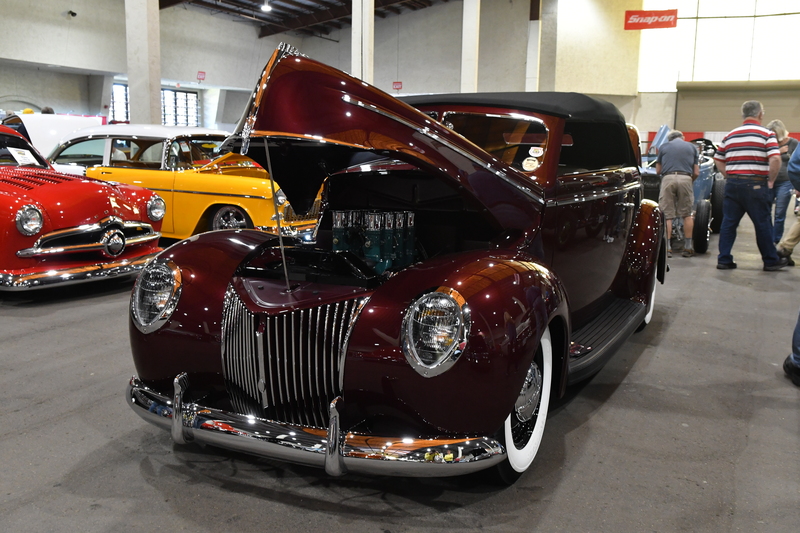 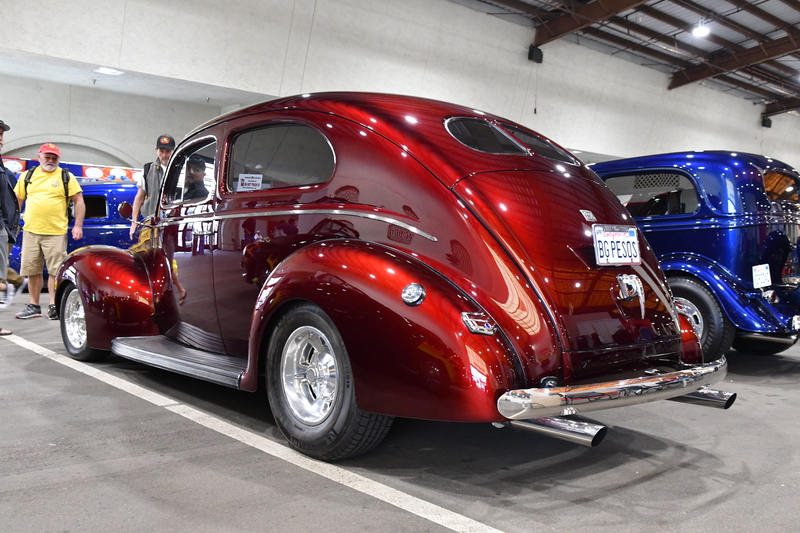 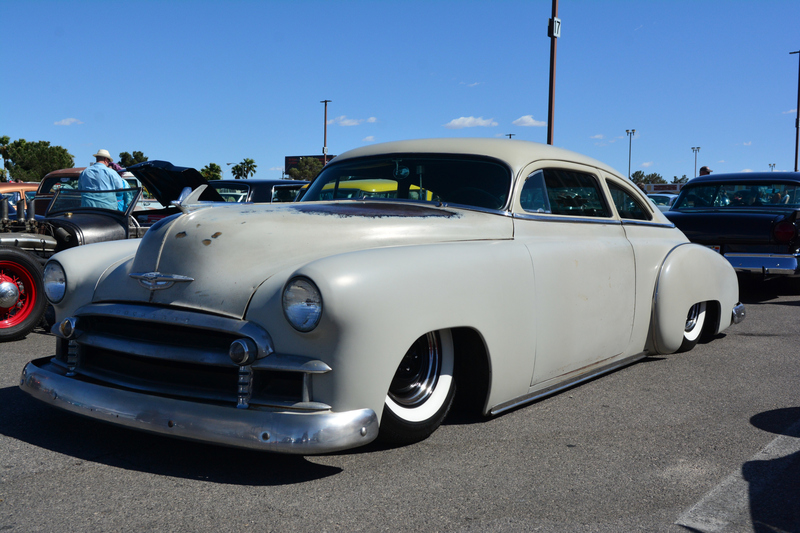 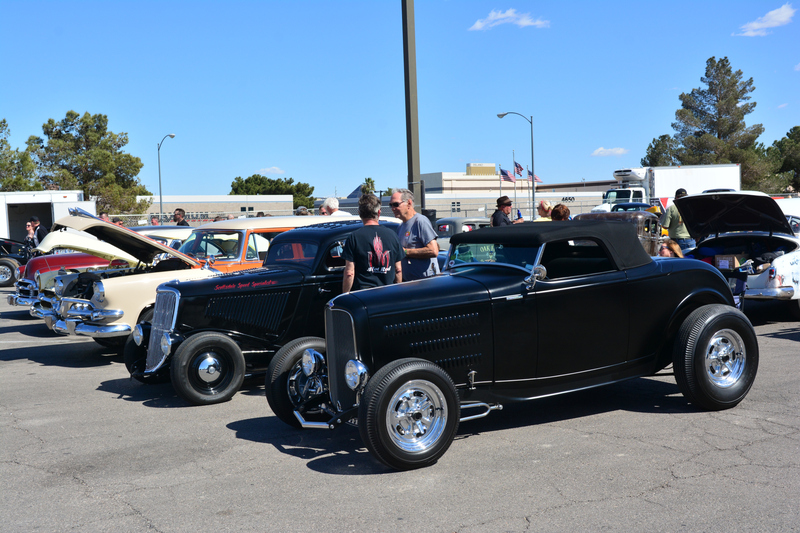 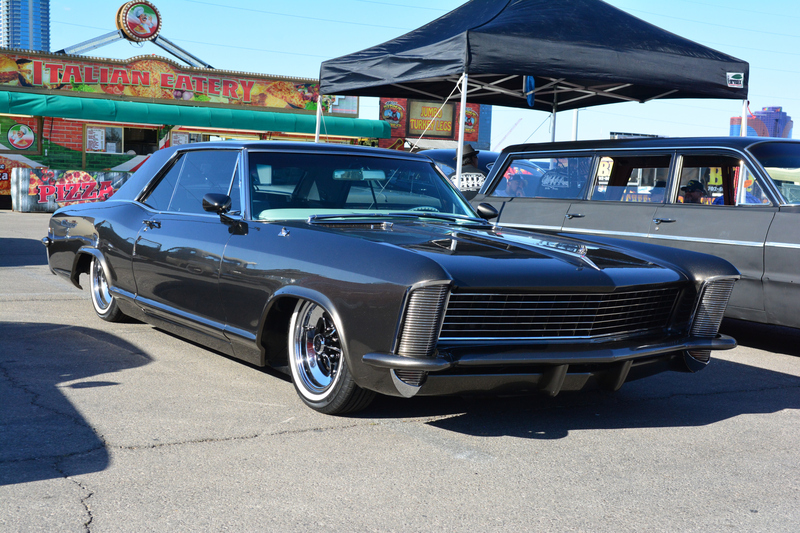 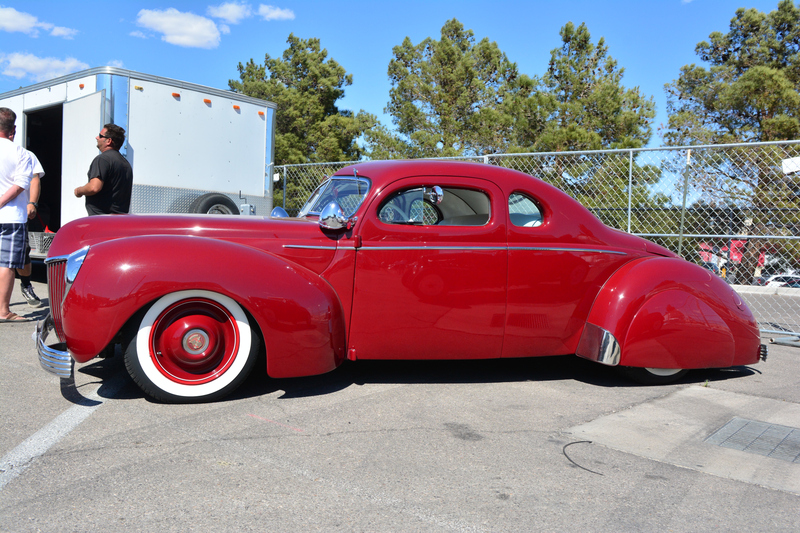 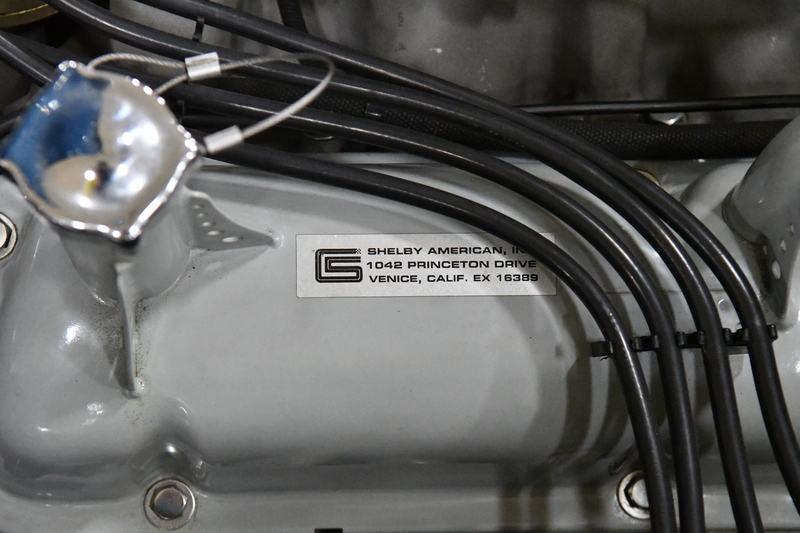 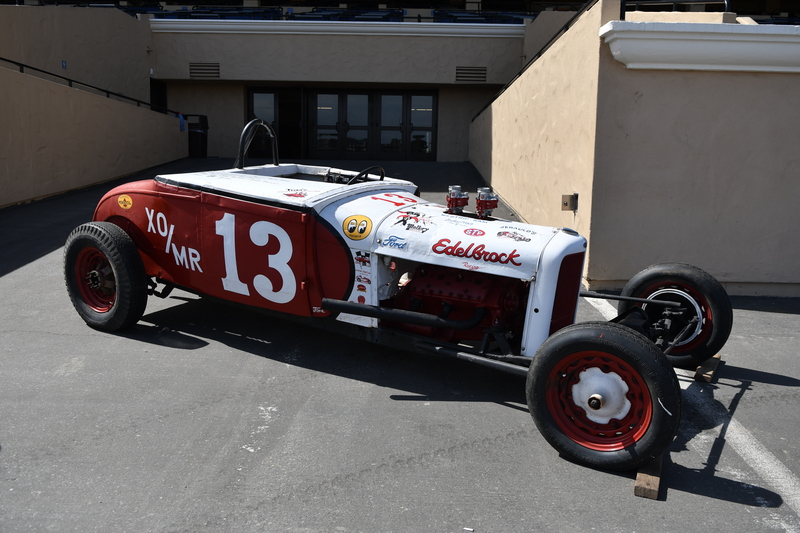 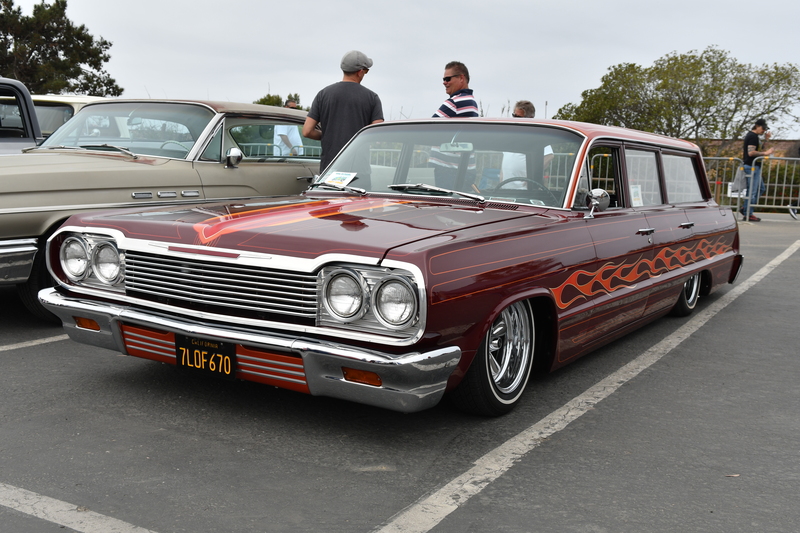 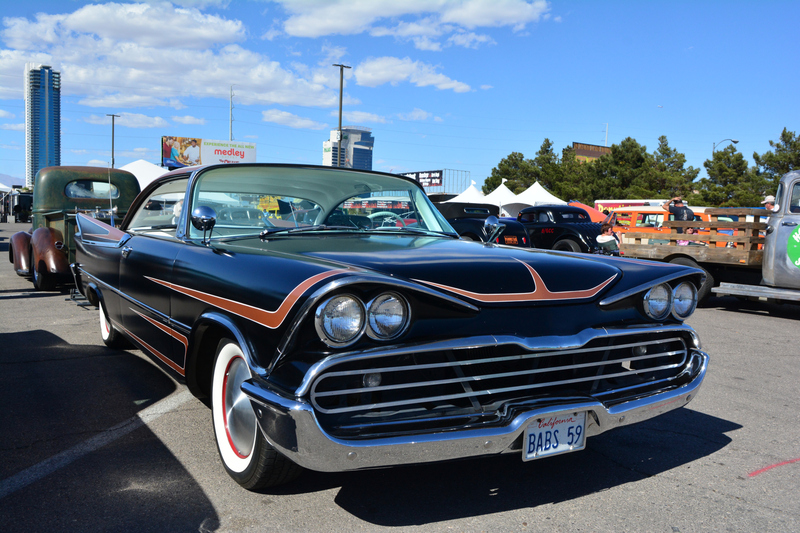 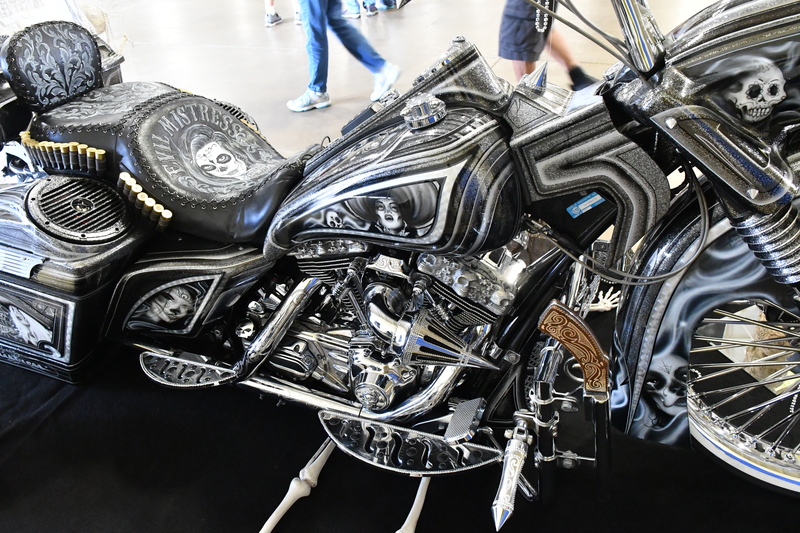 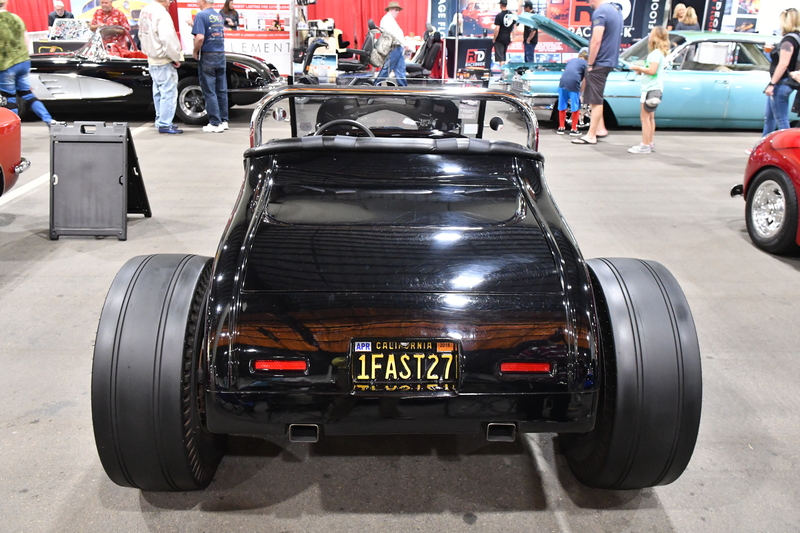 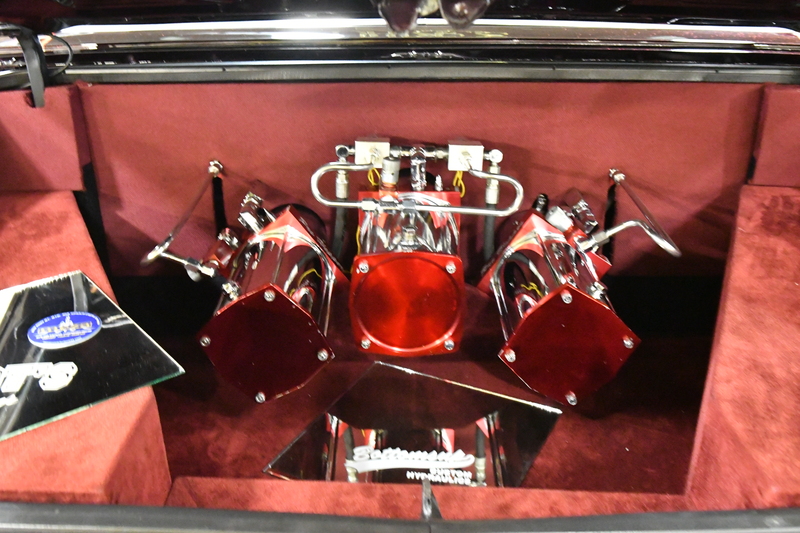 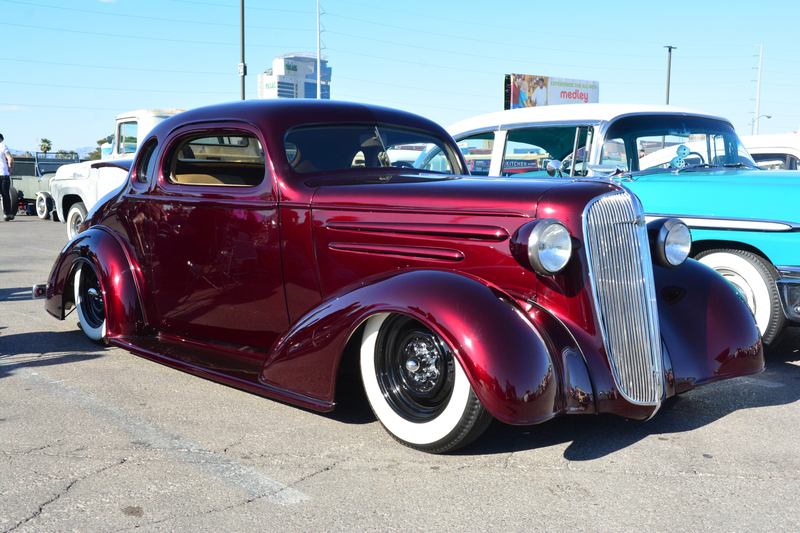 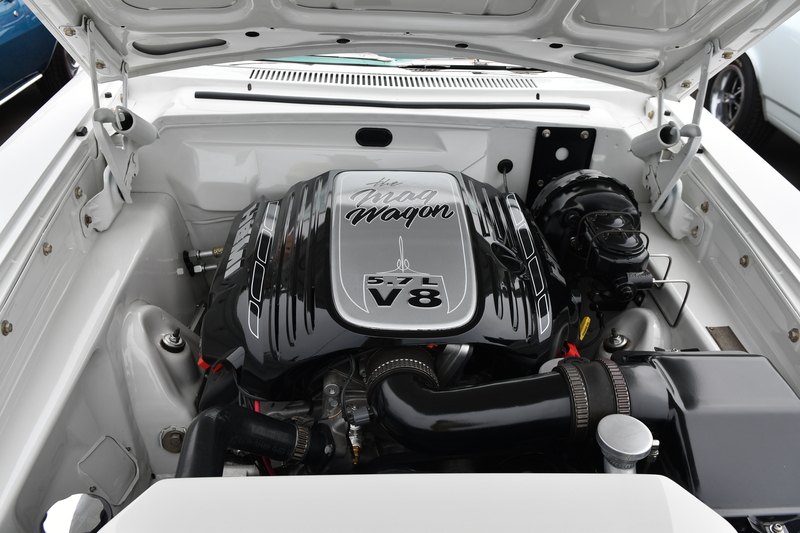 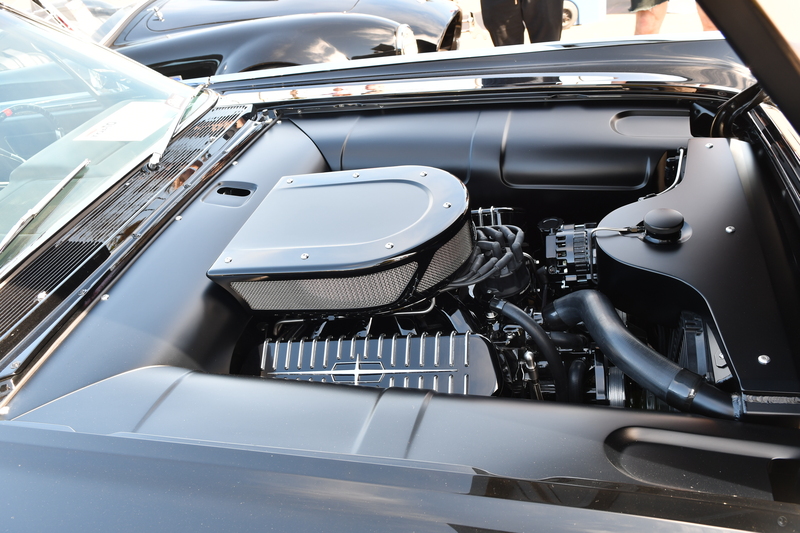 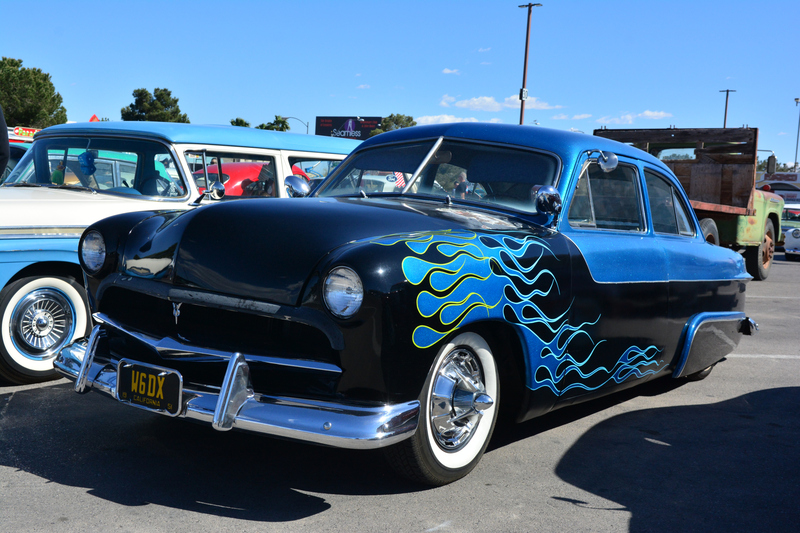 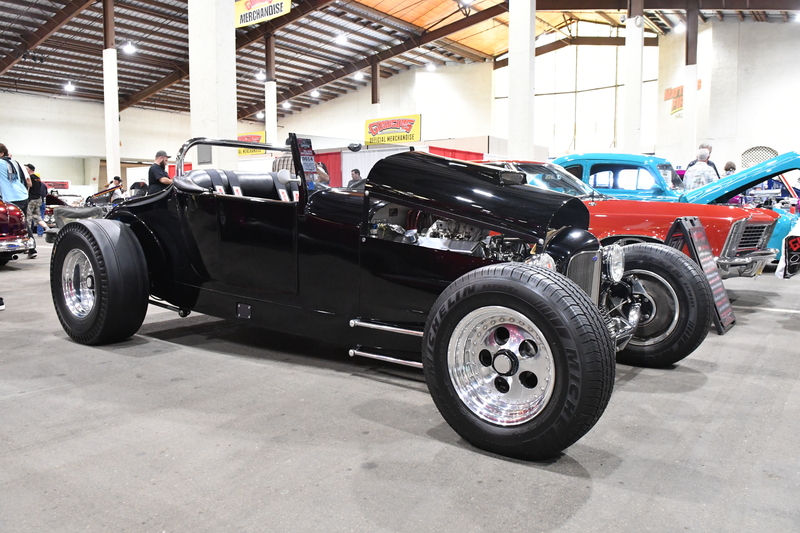 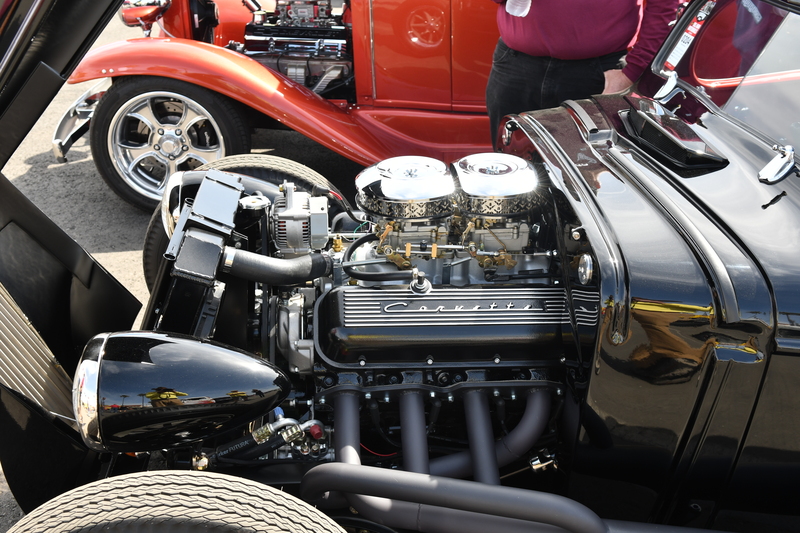 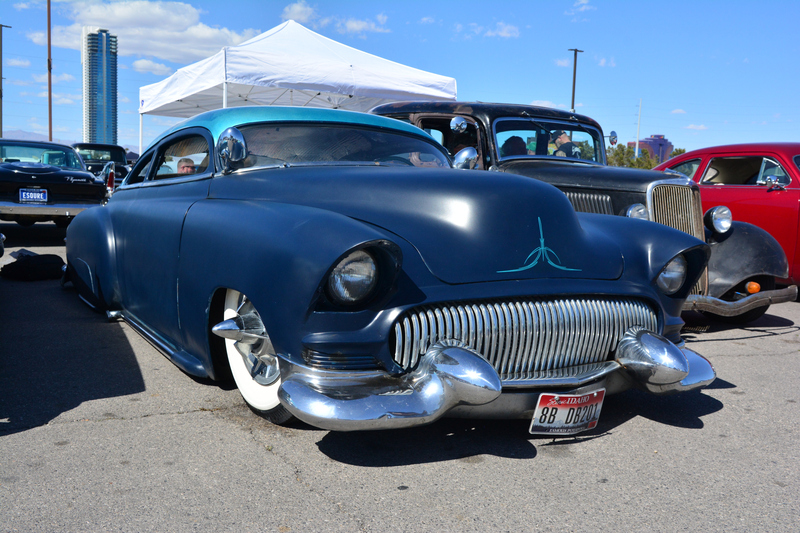 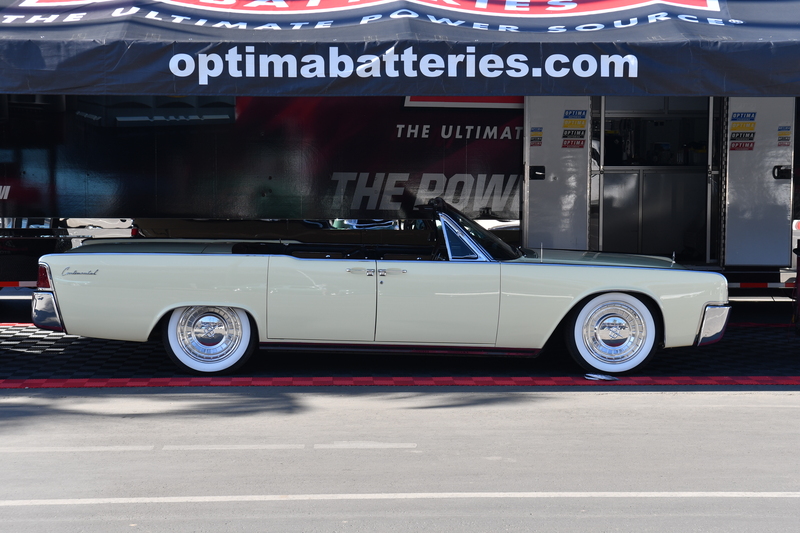 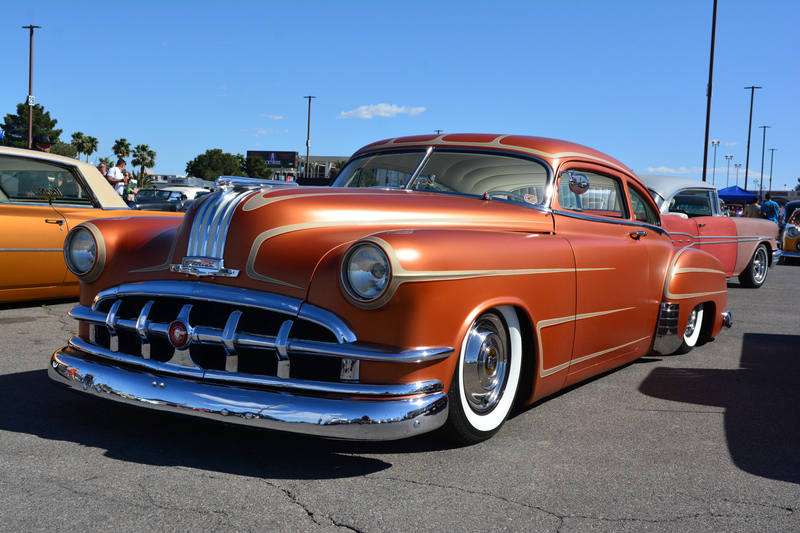 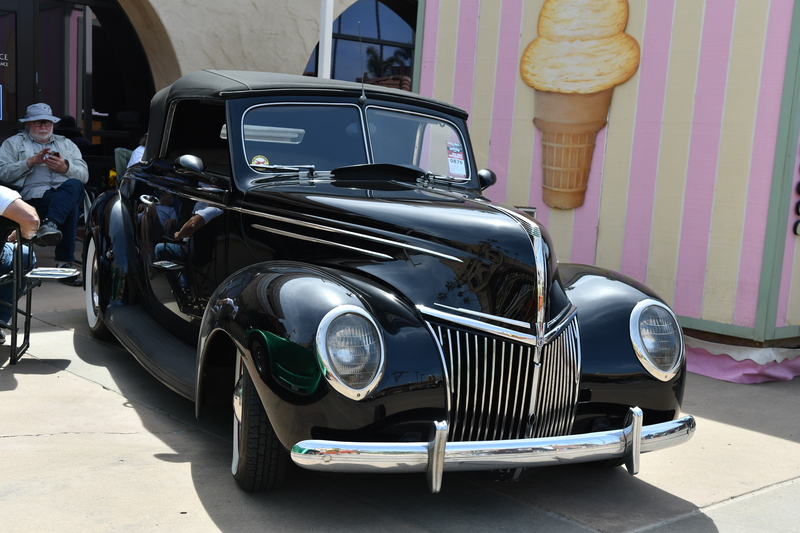 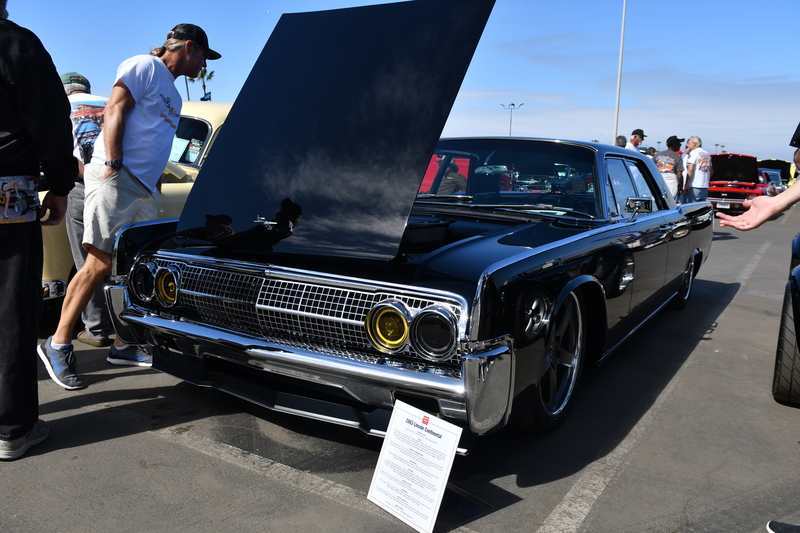 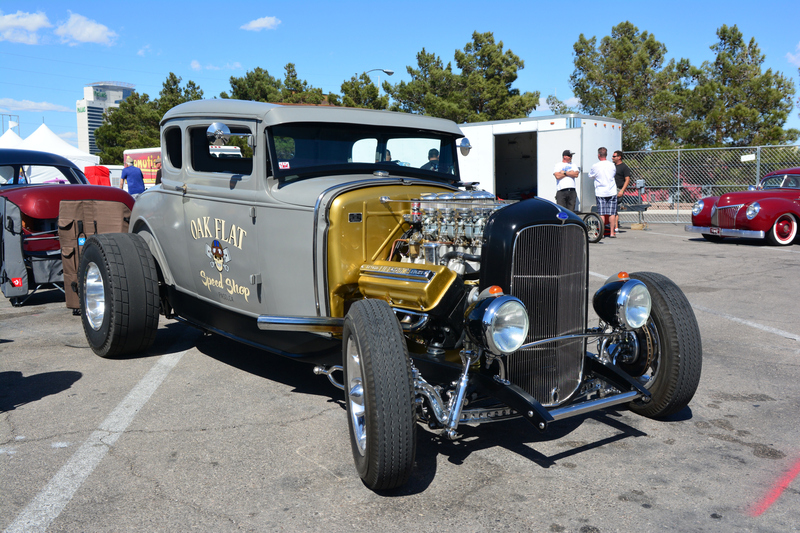 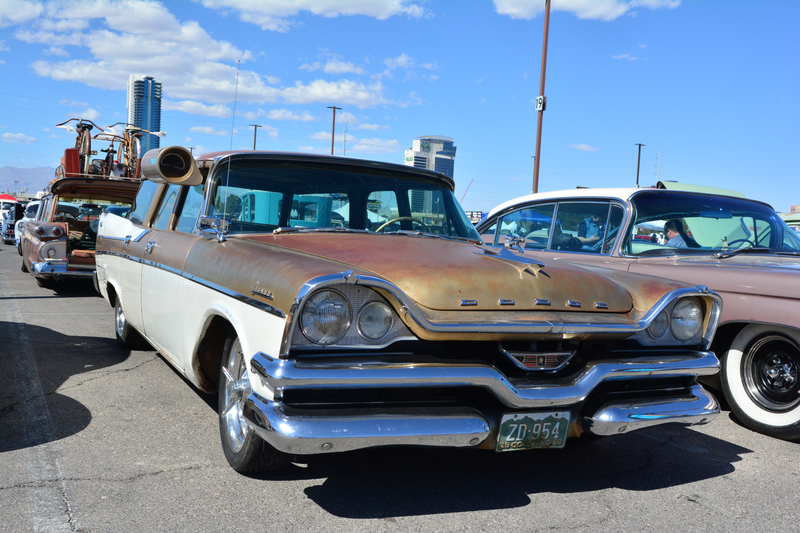 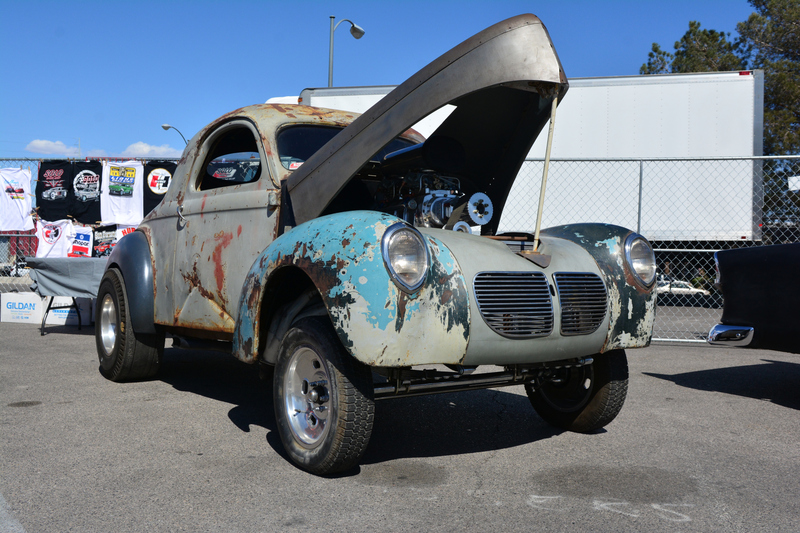 As you can see, this is in no way like a GoodGuys Show… the cars are definitely different! 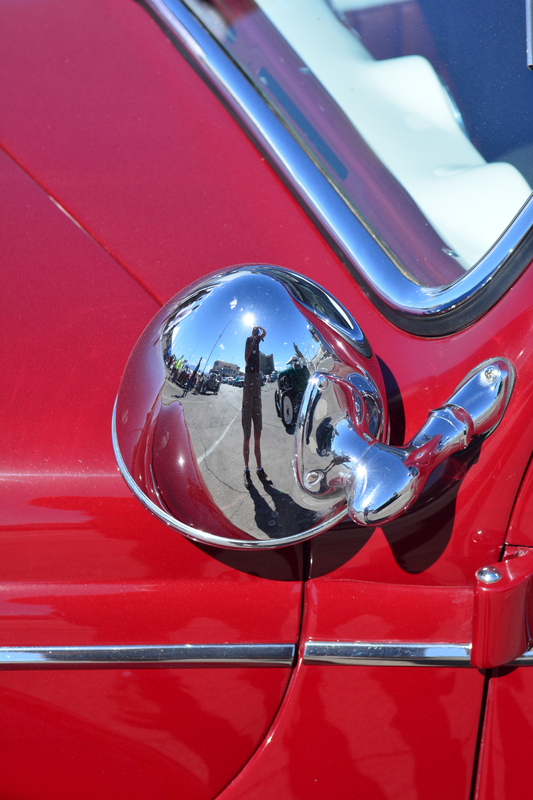 As an extra treat, late Friday afternoon, a photographer, model and a couple of grips showed up at the 1959 Dodge Hardtop that was parked next to us. 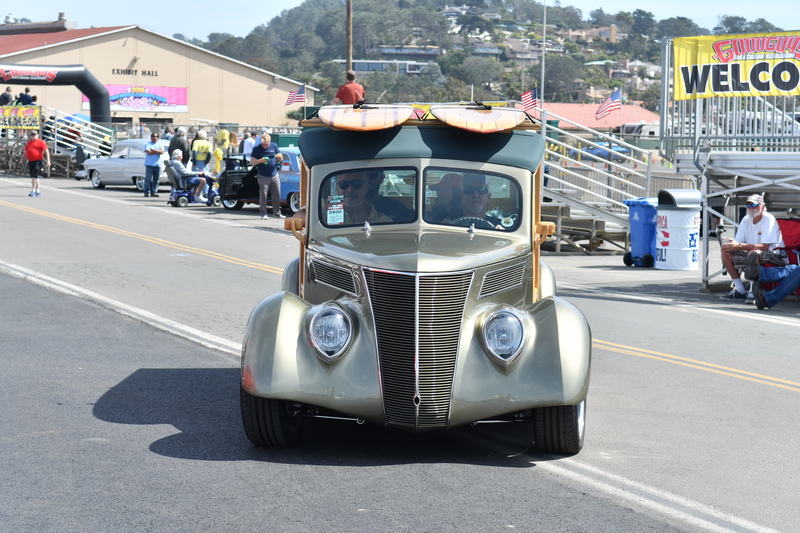 I had a grand time piggybacking on the photog’s setup! 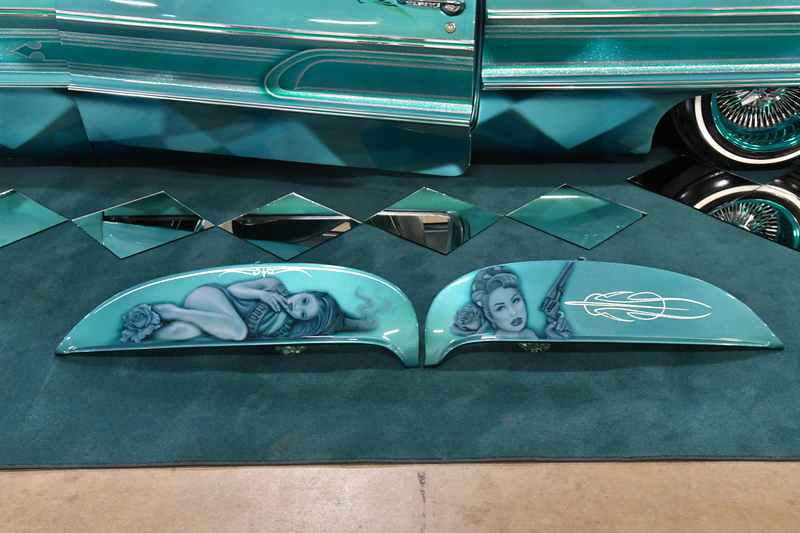 Saturday is the DAY, for the Pin Up Contest which is held in the early afternoon. 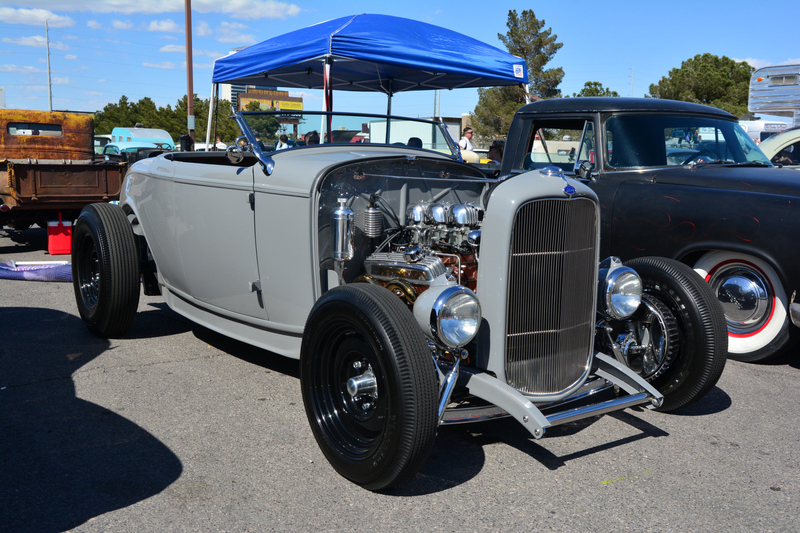 They weather was excellent this year and thanks to Michelle, I was able to get a very good spot to shoot from. 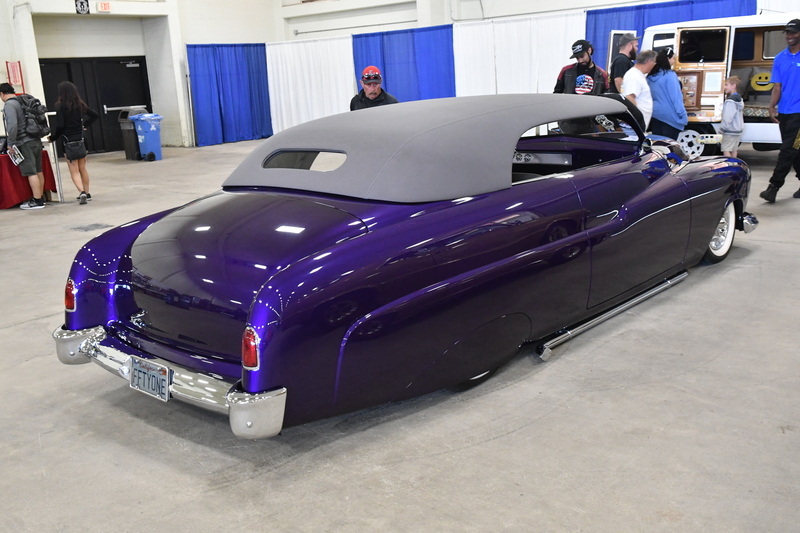 After the contest, I walked around the venue shooting candids, which to me is great fun, especially when you are surrounded by happy people who are having a great time! 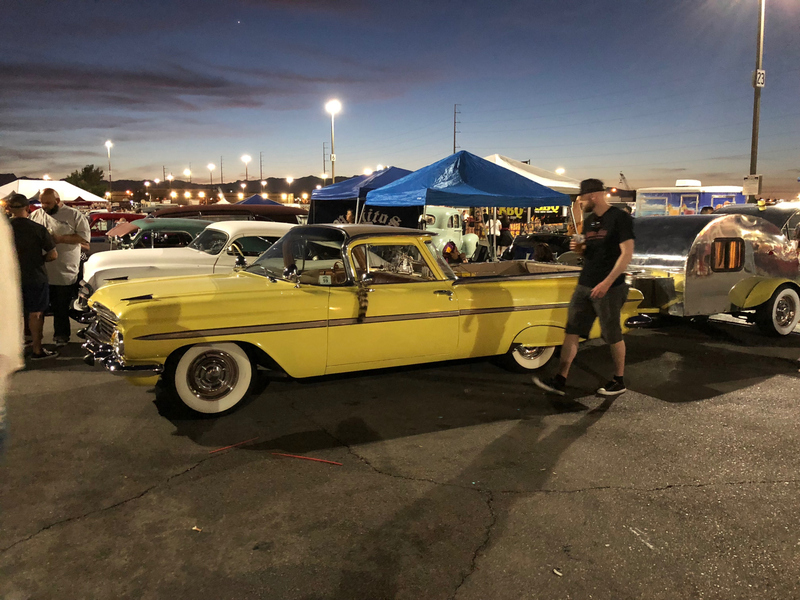 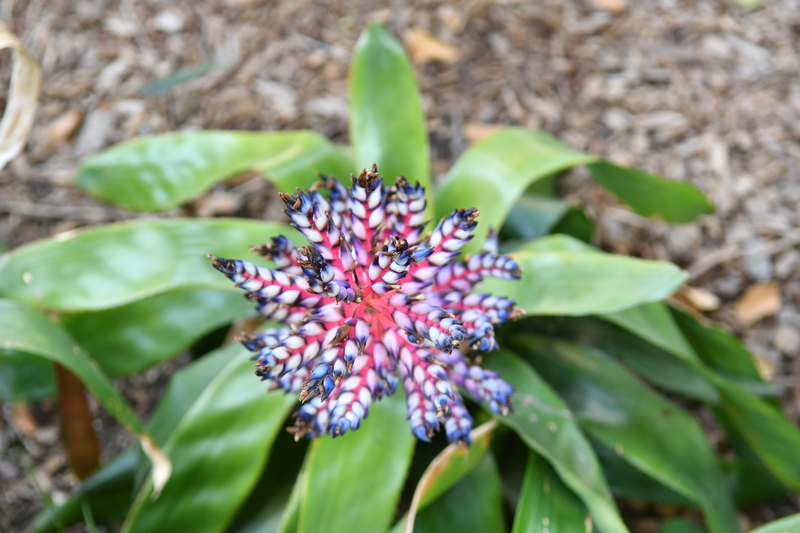 I had shot a movie of the Stray Cats performing, but it was too large to upload to WordPress and it really needed a tripod… movies just are not my thing! 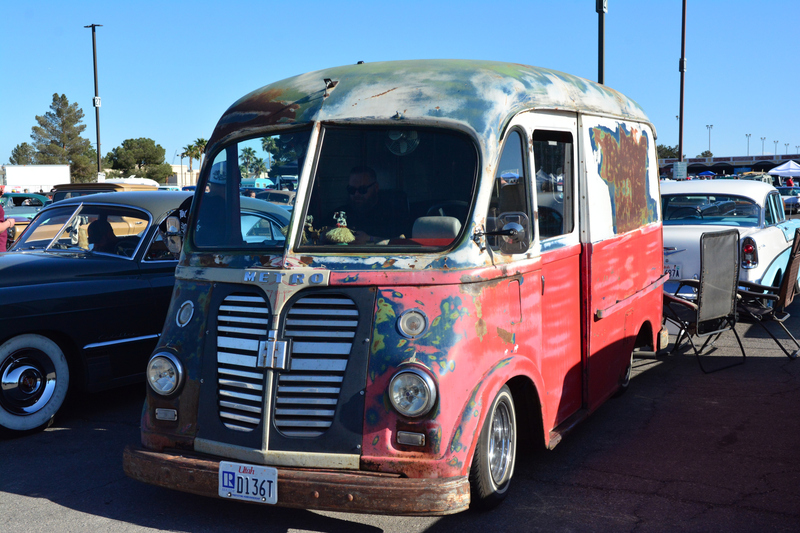 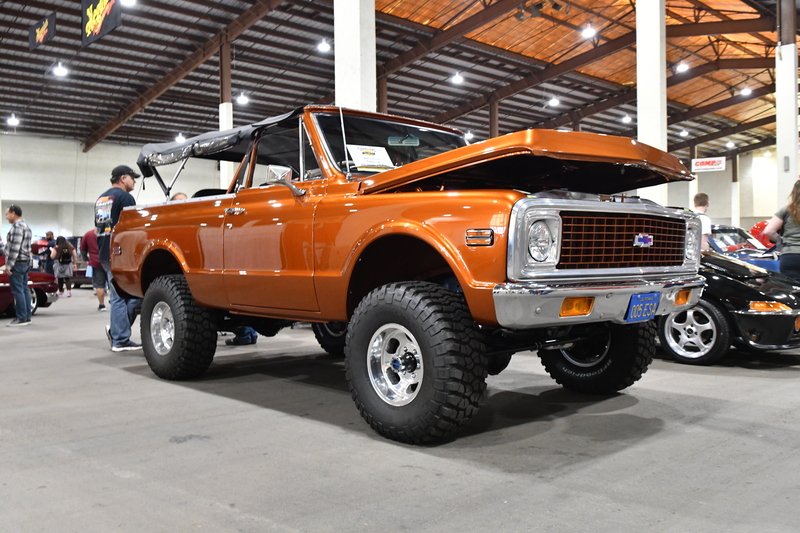 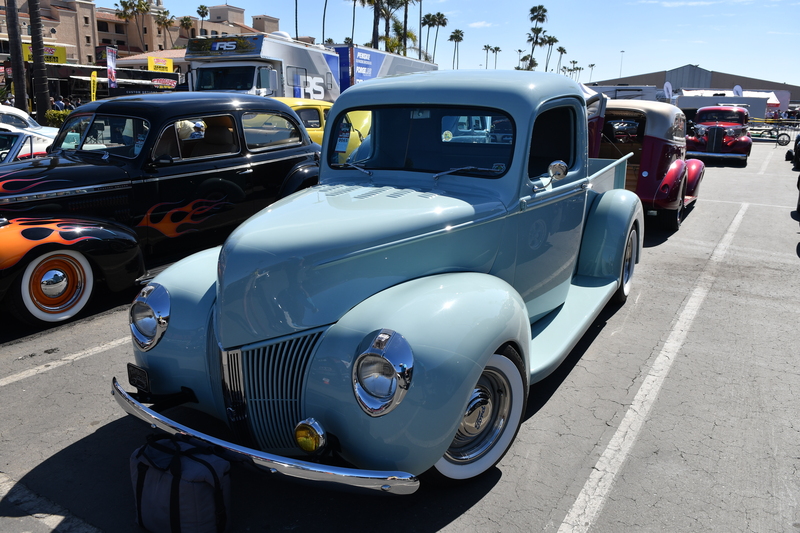 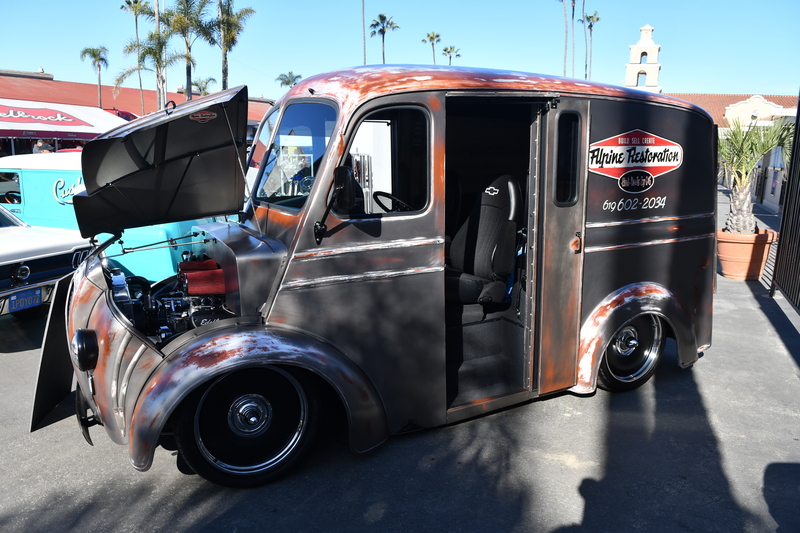 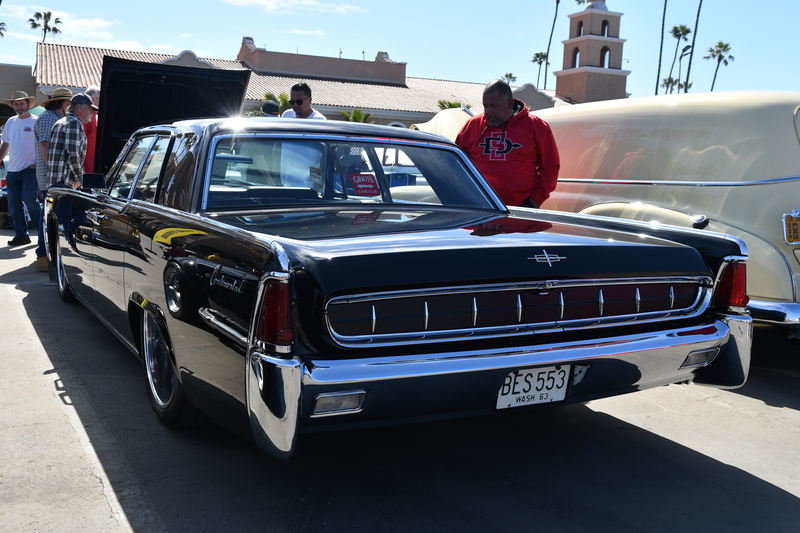 Up until Goodguys added the spring car show in Scottsdale we were regular attendees of the Goodguys Del Mar show, which are always one to two weeks apart making it very difficult for most club members to schedule. 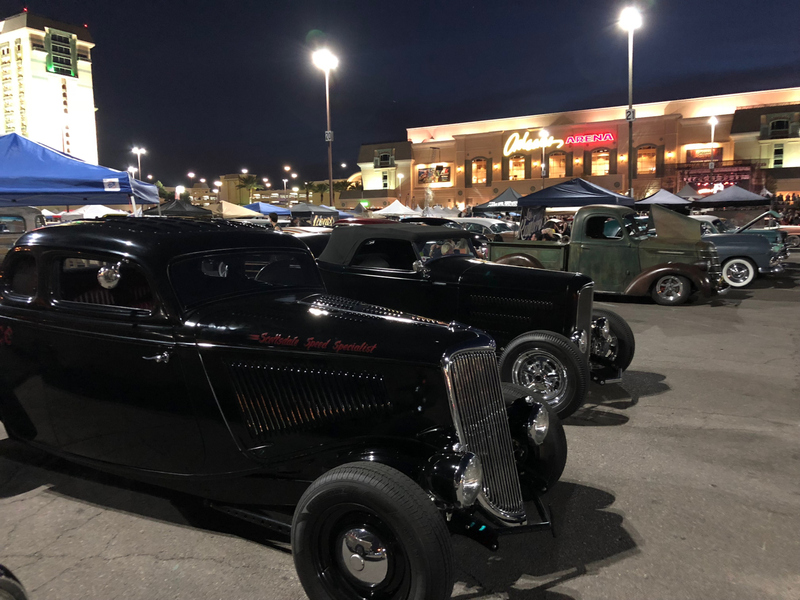 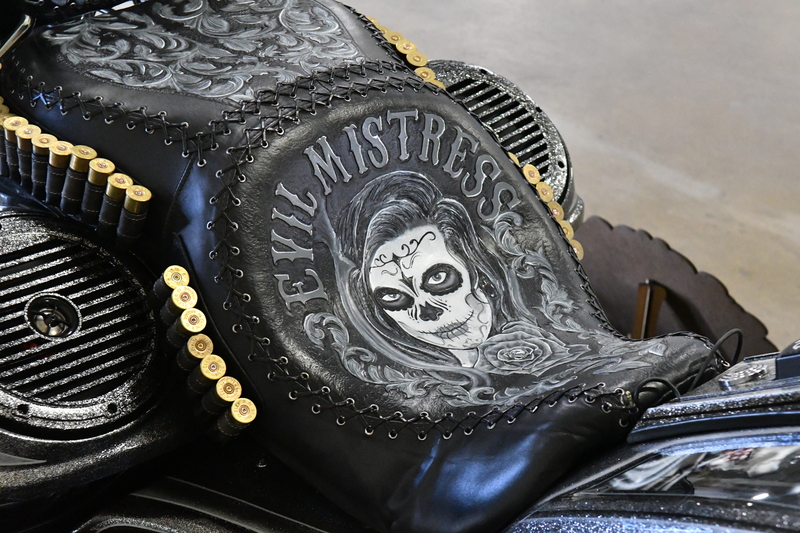 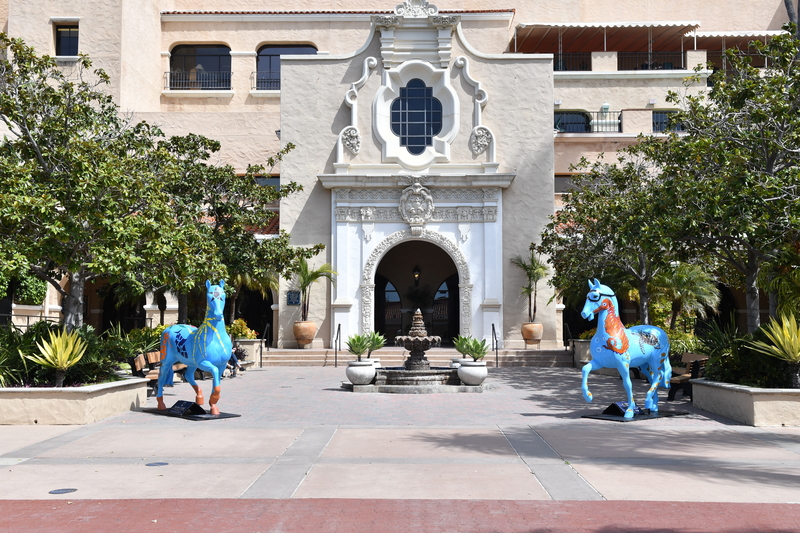 Now that we are no longer the Host Club for the Scottsdale events we can once again make the trip over to the San Diego area. 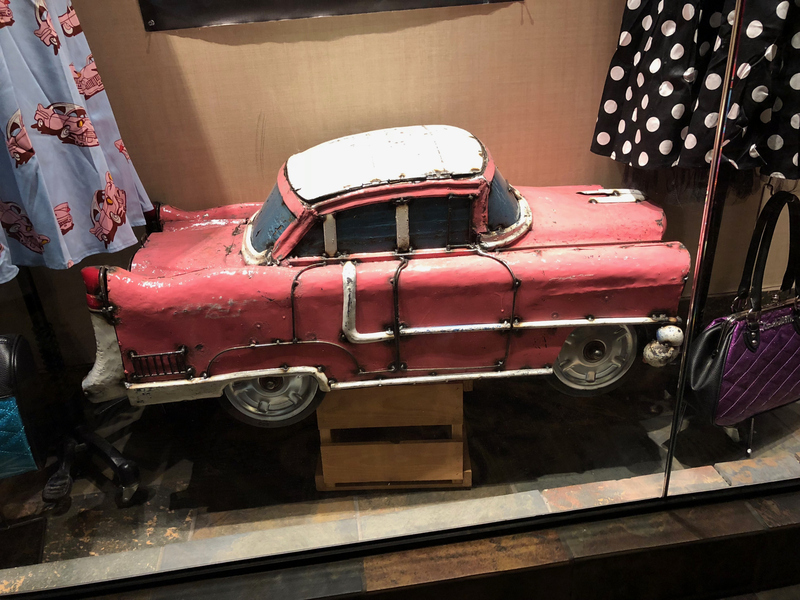 Art & Debbie Thompson, Rick & Debbie Aronson, Dave & Anne Bennett, Ron & Carol Boen, John & Leah Carmody, Charlie & Danise Cover, Jim & Carol Dalton, Tom & Jane Harris, Chuck & Diane LeVetter, Conrad & Michelle Monroe, Val & Sandy Muyres, Greg Selvidge & Sherry Hoffler. 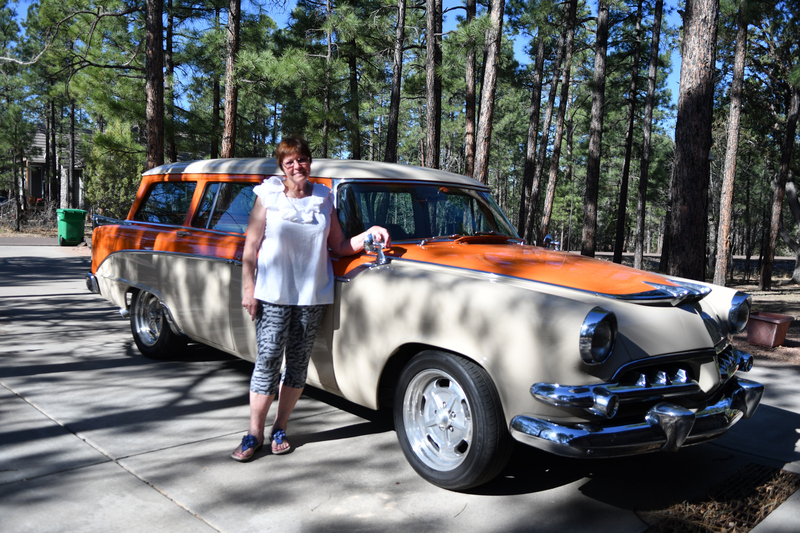 Eddie & JoAnn Asten and Don & Marcia Mueller. 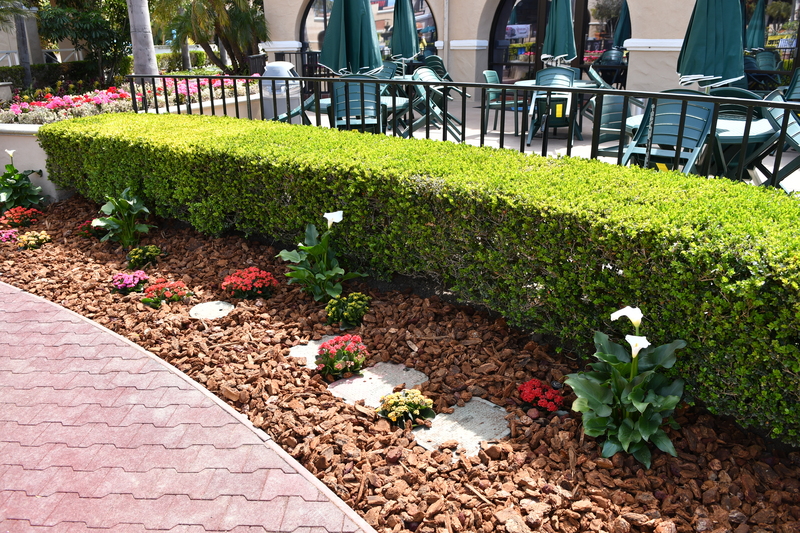 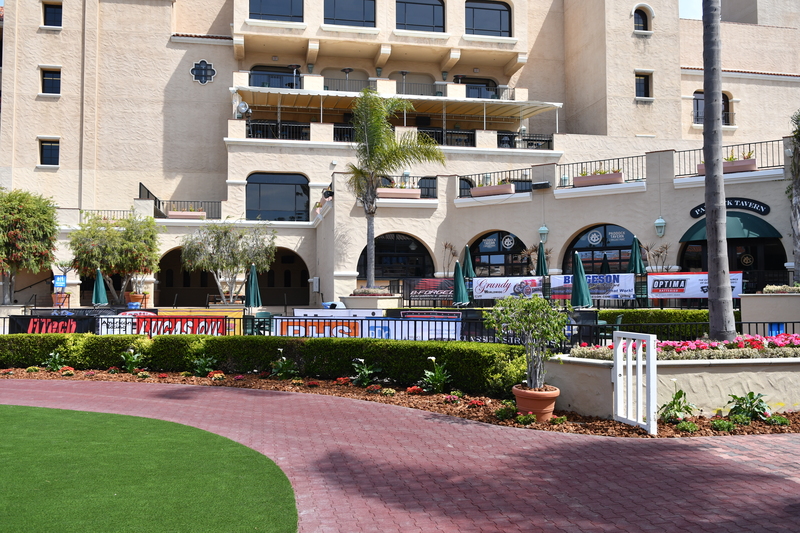 Many thanks to Charlie Cover for putting the run together and Debbie Aronson for making the hotel arrangements and getting us a really good rate! 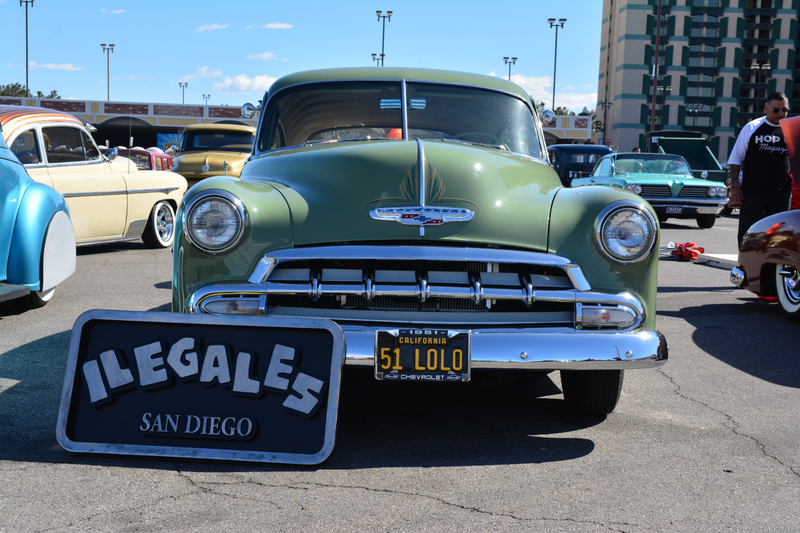 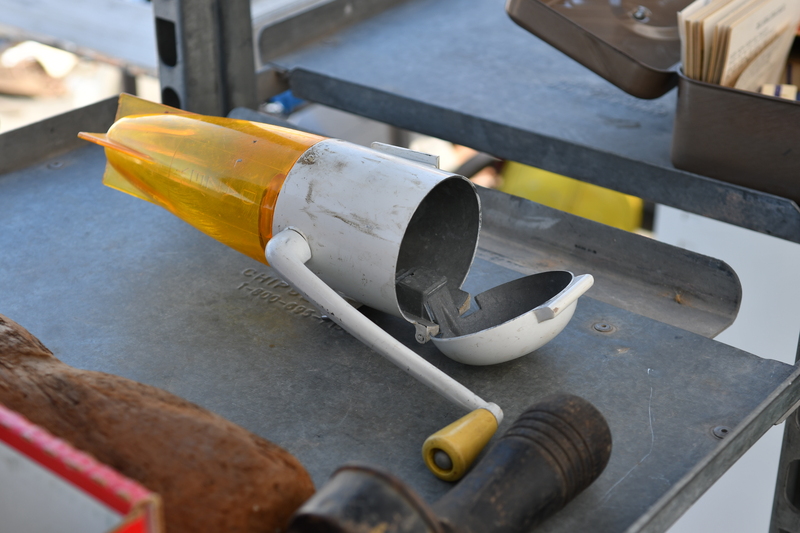 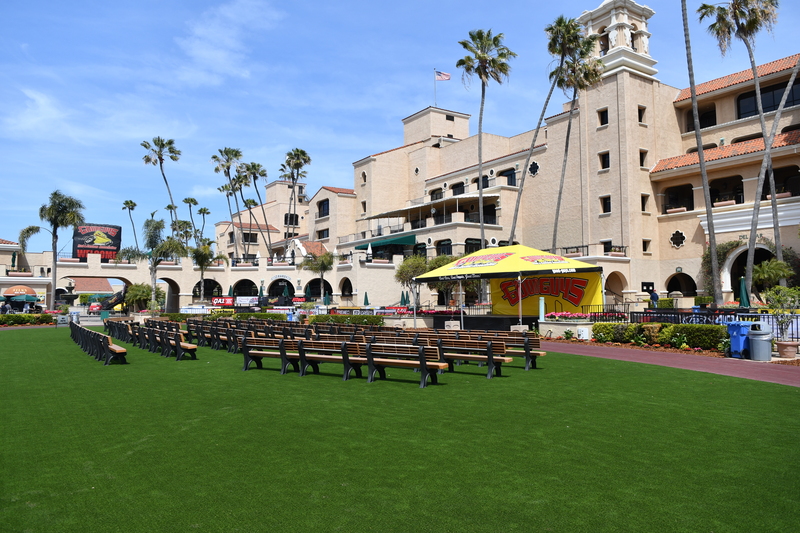 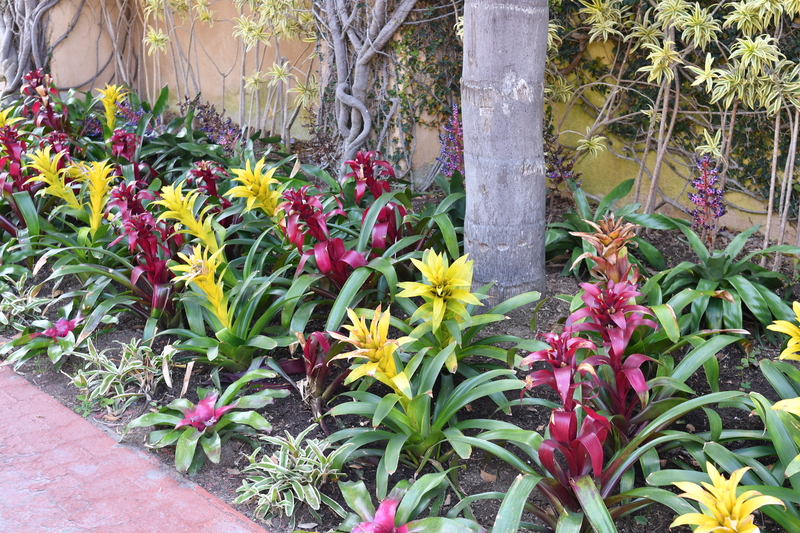 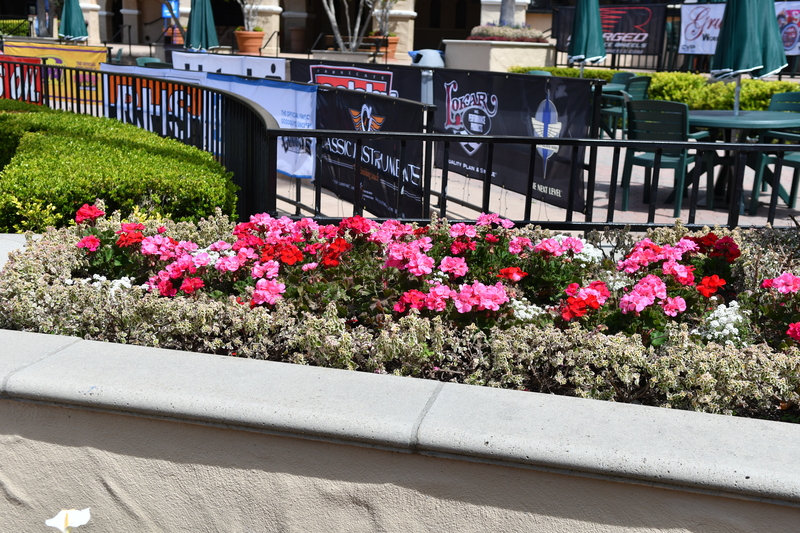 Also many thanks to the OTHG-San Diego club for providing another great lunch on Saturday. 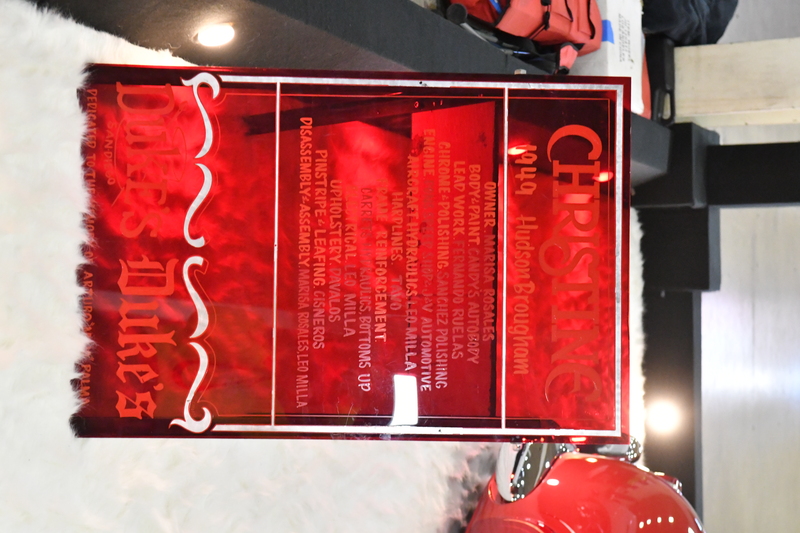 Also my personal thanks to Danise Cover for helping with the photo chores! 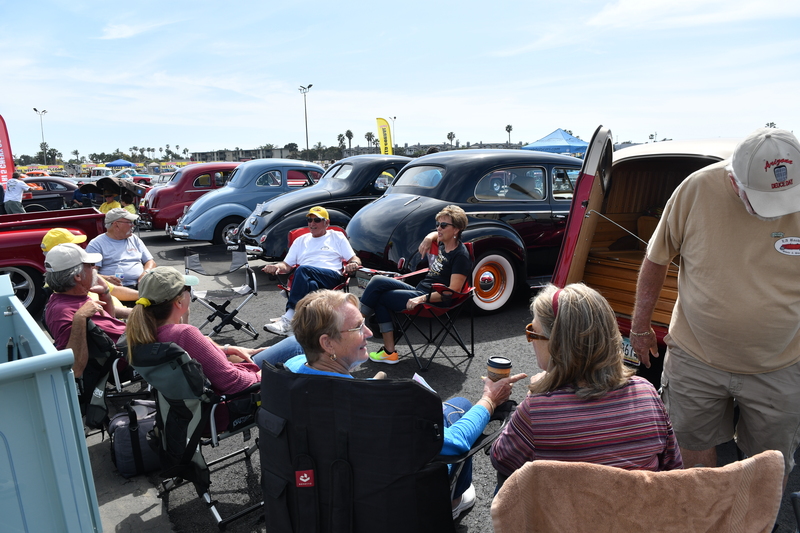 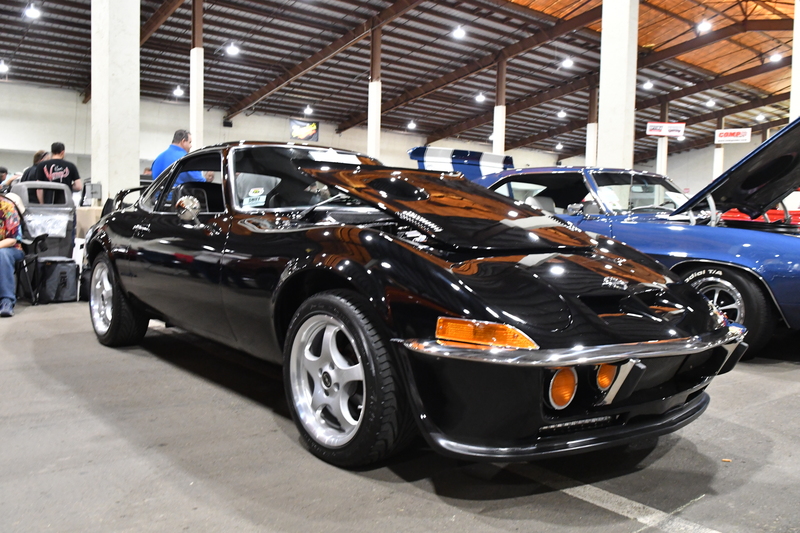 All in all the weather was great, there were many great new cars to look at, and as always a great time talking with old and new friends. 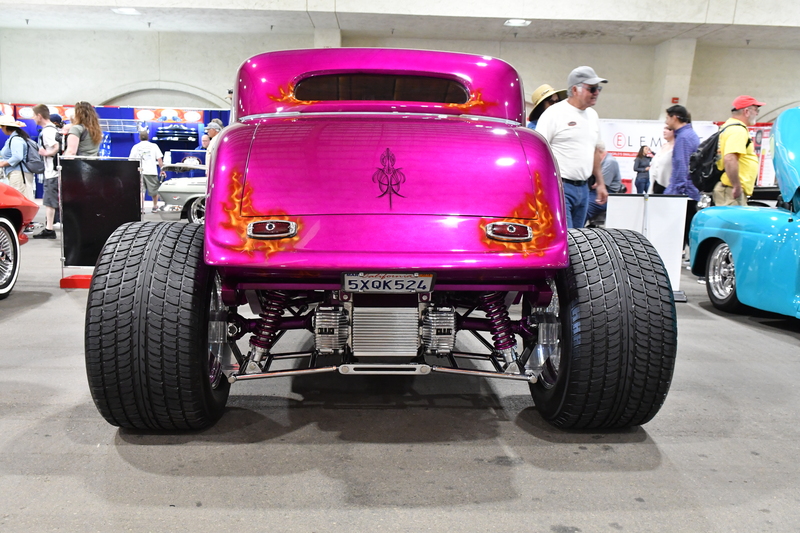 Until the next time, Keep On Keeping On! 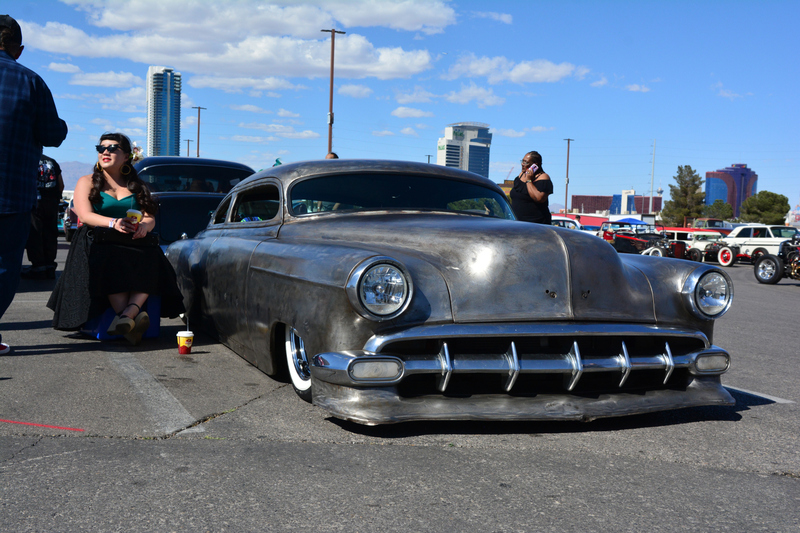 Stay safe and have fun!